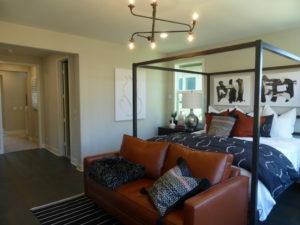 Last week, I saw the Lyric collection in Cadence Park. 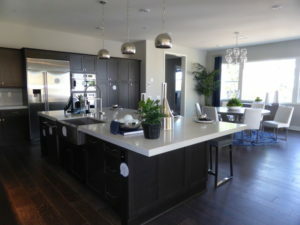 Built by Tri Pointe Homes, these detached condos have two basic floorplans with an option for a third story on both. 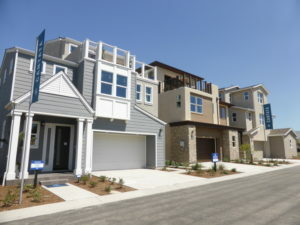 While the homes appear connected from the outside, there is an 8” air gap between each one and every house has its own foundation and roof. 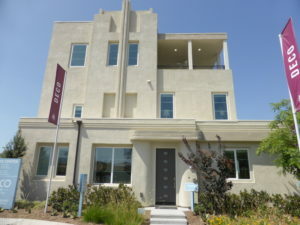 The development will have 70 units near Modjeska and Irvine Blvd. 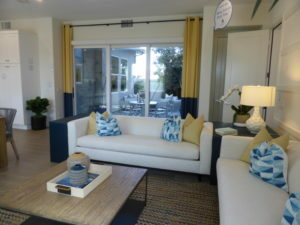 Homes range from 1,661 – 2,346 square feet, with 3 bedrooms, 2.5 bathrooms, and options for third-floor bonus rooms. 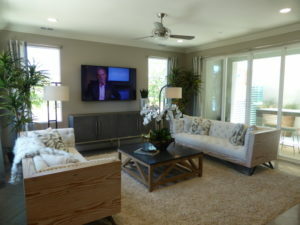 Each home has a private, two-car garage accessed from a shared motor court. 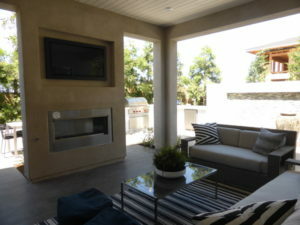 Elevations include Contemporary, Transitional Modern, and Abstract Traditional. 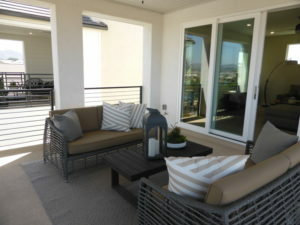 The Lyric homes come standard with 8’ Therma-Tru® entry doors with Kwikset satin nickel handset and SmartCode® hardware; gas stub for barbecue at courtyard; exterior decorative lighting; water-resistant exterior electrical outlets; 3 ½” baseboards and 2 ¼” door casing with enamel finish; ceramic tile flooring in entry, kitchen, bathrooms, and laundry room; five-panel interior doors; bathrooms and laundry room with quartz countertop in White Ice, undermount rectangular china sinks, and Delta® Ashlyn® chrome faucets; pedestal sink in powder room; and recessed lighting throughout. 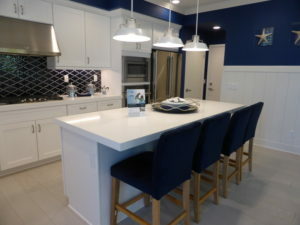 The kitchens come standard with European-style, white Shaker, Thermofoil cabinetry with concealed hinges and satin nickel 6” bar pulls; under-cabinet fluorescent task lighting; granite countertops in select colors with 1 ½” square edge, 6” backsplash, and full splash at cooktop; dual-compartment, 18-gauge stainless steel sink with Insinkerator® garbage disposal; Delta® Essa® chrome faucet with pull-down sprayer; refrigerator space pre-plumbed for water; and a Whirlpool® stainless steel appliance package with a 36” 5-burner gas cooktop, 36” 350-CFM range hood, built-in microwave, 30” Accu-Bake® wall oven with Precise Clean® cleaning system, and an ENERGY STAR® certified, multiple-cycle dishwasher with soil sensor. 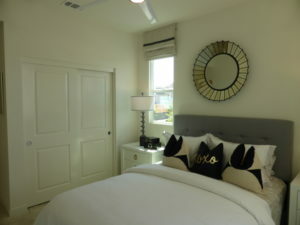 The master suites have an 8’ contemporary six-panel door; compartmentalized bath with dual vanities; with European-style, white Shaker, Thermofoil cabinetry with concealed hinges and satin nickel 6” bar pulls; quartz countertops in White Ice with 1 ½” square edge and 4” backsplash; , undermount rectangular china sinks and Delta® Ashlyn® wide-spread chrome faucets; walk-in tile shower with semi-frameless enclosure; and handset white ceramic tile in 6” x 6” on shower walls and 2” x 2” on shower floor. 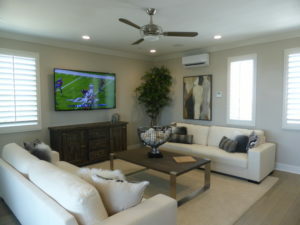 The home technology advancements include universal outlets at great room, loft, and bonus room (per residence); TV and data outlets in all bedrooms; phone and USB charging outlets at kitchen and master bedroom; On-Q 30” plastic wiring hub with hinged door; hard-wired smoke detectors and carbon monoxide alarms with battery back-up; forced-air heating and climate controlled air conditioning; and third-floor heating and cooling system with separate wall-mounted thermostat. 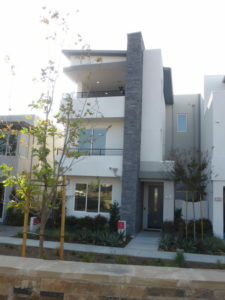 Lyric is part of the Irvine Unified School District. 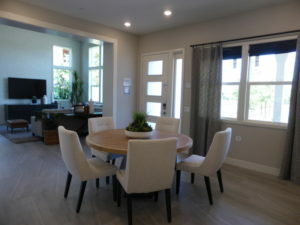 The brand new Cadence Park School serving grades K – 8 school opened in August 2018 with grades K – 6. 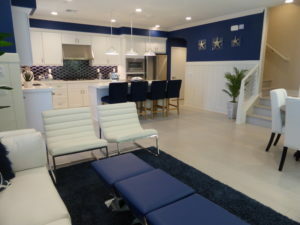 It will add 7th grade in 2019 and 8th grade in 2020. 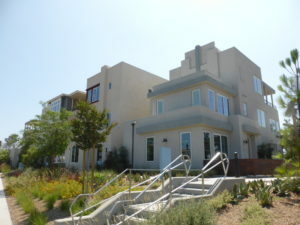 Until those grades are added, middle school students will attend Beacon Park School, which serves grades K – 8. 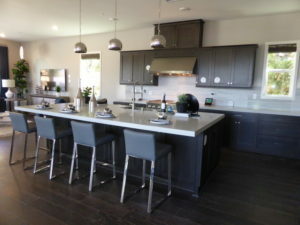 The neighborhood is served by Portola High School, which will have grades 9 – 11 in 2018-19 and will add 12th grade the following year. 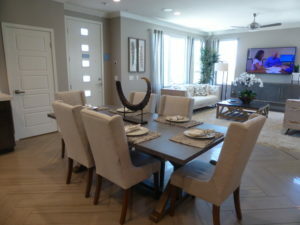 Seniors moving in this year will attend Northwood High School. 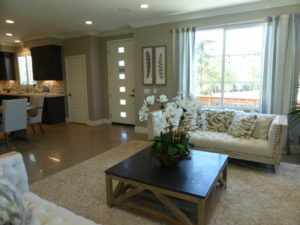 Recent pricing started at $807,203 for residence 1, $895,234 for residence 1X, and $857,860 for residence 2. 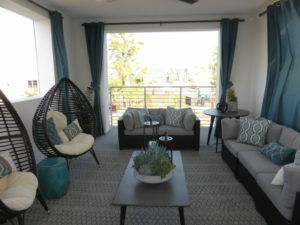 Pricing on residence 2X wasn’t available. 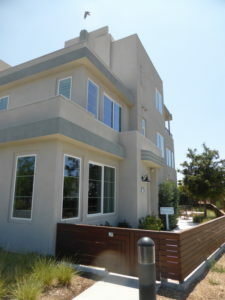 Residence 1 and 1X are the same on the first two floors. 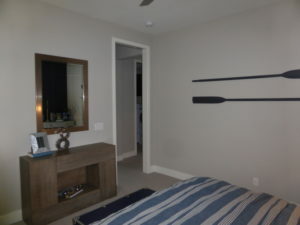 The only difference between them is the third floor in the 1X model. 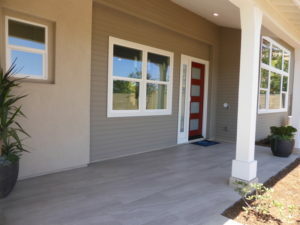 The home has a covered walkway leading to the front door. 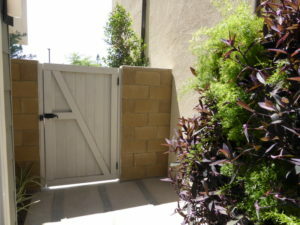 To the right of the front door, a gate opens into the private courtyard. 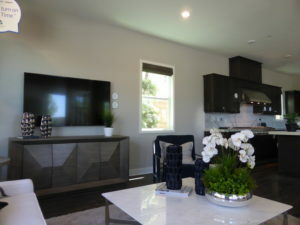 Upgrades throughout the model include whole house plumbing fixtures and accessories to stainless steel finish, 5 ½” baseboards, sound system, speakers, volume controls, security system, window treatments, flooring, interior paint, and all decorator’s items. 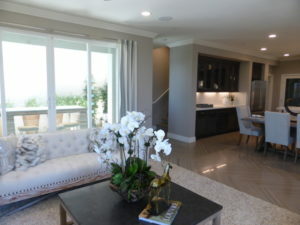 Inside, the house has a small foyer that opens directly into the great room. 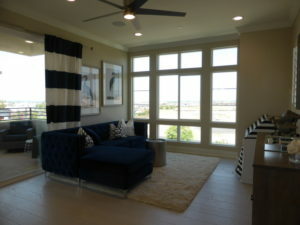 The great room has large windows facing the street and one smaller window on the side. 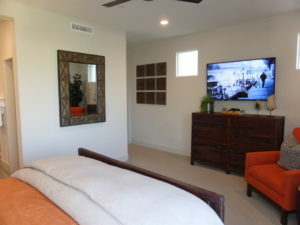 Upgrades include four recessed LED lights, flat-screen TV outlet with conduit, and the tiled wall. 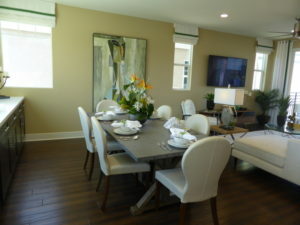 The room is on the smaller side, as it also includes the dining area. 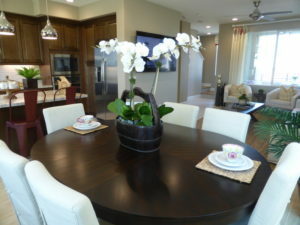 In lieu of a formal dining room, the residence 1 dining area is an extension of the great room. 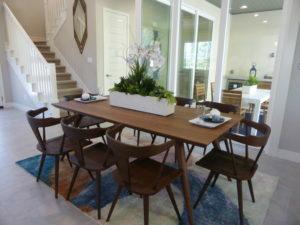 The model shows a table six with enough space for something a little bigger. 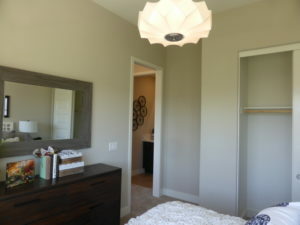 It also has space for a china hutch or shelving unit along one wall. 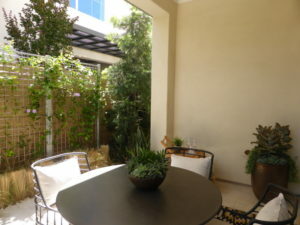 The opposite wall has a small window and sliding doors leading to the private courtyard. 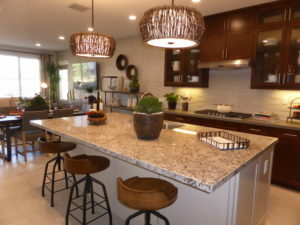 The kitchen is behind the dining area. 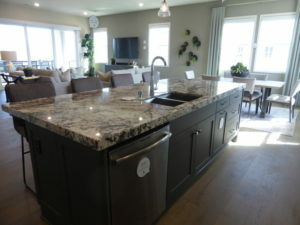 The island has seating for 3 – 4 people and holds the sink and dishwasher. 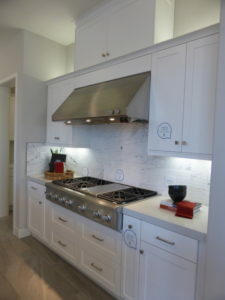 The side wall has the cooktop, a few drawers, and numerous upper and lower cabinets. 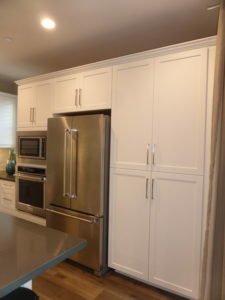 The back wall holds the fridge, oven, microwave, and pantry-height cupboards. 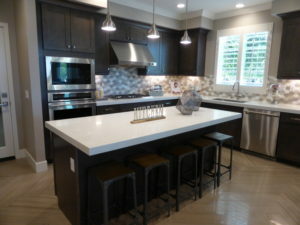 Upgrades in the kitchen include two pendant lights and pre-wire, Delta Trinsic Touch faucet in arctic stainless, reverse osmosis with stainless faucet, stained shaker cabinets with painted cabinets at island, roll-outs flanking cooktop and at pantry, stacked glass uppers, upgraded quartz countertop with full-tile splash, upgraded granite island countertop, and Whirlpool side-by-side stainless refrigerator. 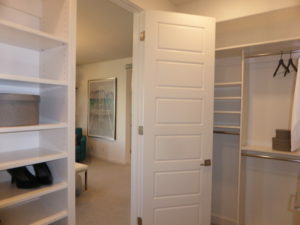 A doorway in the back corner of the kitchen leads to the coat closet, garage access, and powder room. 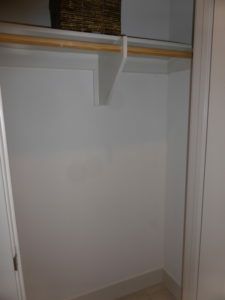 The closet is small and has a single shelf and pole. 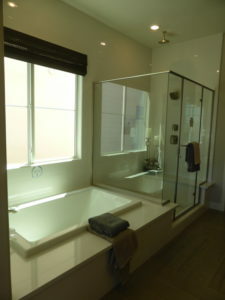 The bathroom includes a pedestal sink, which is full visible from the kitchen. 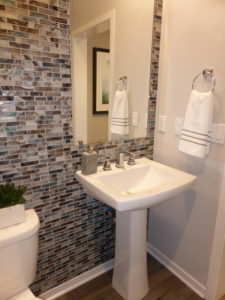 The mirror, faucet, and bath accessories are upgrades. 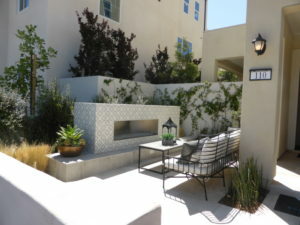 The courtyard is small and is modeled with a built-in bench and above-ground fire pit. 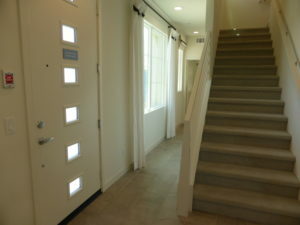 On the second floor, the secondary bathroom is directly across from the staircase. 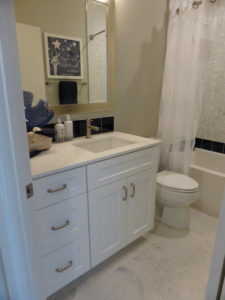 It has a vanity with two sinks, two large cabinets, and three drawers. 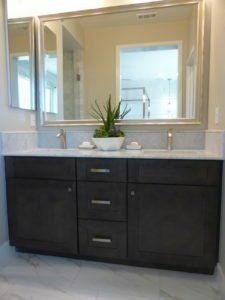 The cabinet finish, faucets, and accessories are upgrades. 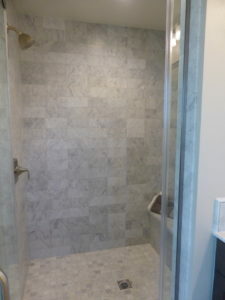 A separate doorway leads to the shower/tub combo, which has upgraded tile walls and an upgraded enclosure in brushed nickel. 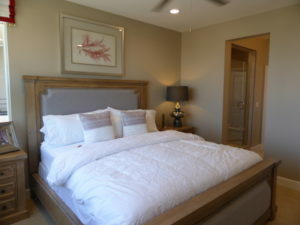 Both secondary bedrooms are at the back of the house. 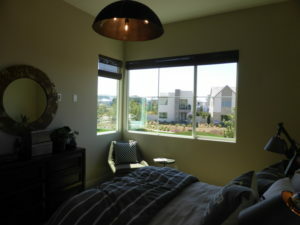 Bedroom 2 has a small window on one side and a larger window at the back. 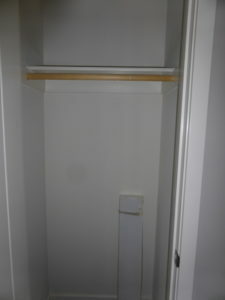 It’s a fairly small room with a standard bypass closet. 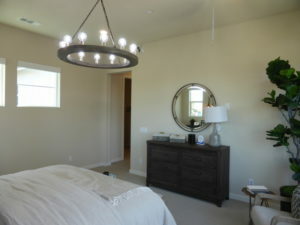 Upgrades include the four recessed LED lights and the ceiling fan and pre-wire. 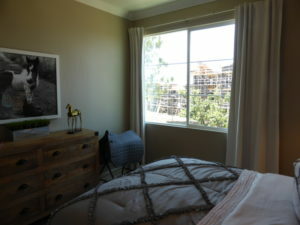 Bedroom 3 has windows across the back wall that overlook the motor court. 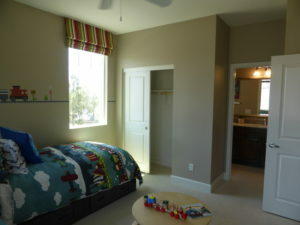 It is comparable in size to bedroom 2 and has the same bypass closet. 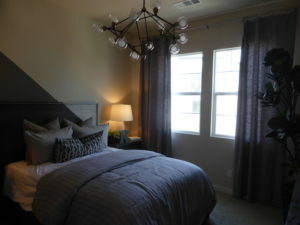 Upgrades include the hanging light fixtures and prewire, recessed LED lights, and the wall treatment behind the bed. 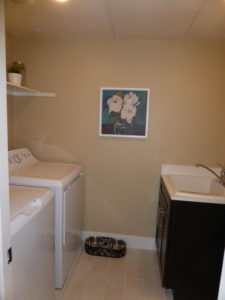 The laundry room is on the other side of the secondary bathroom. 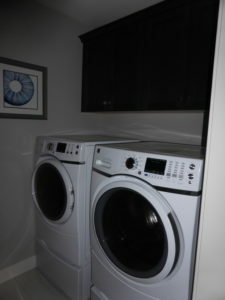 It is modeled with side-by-side machines and has upgraded cabinets in lieu of the standard shelf. 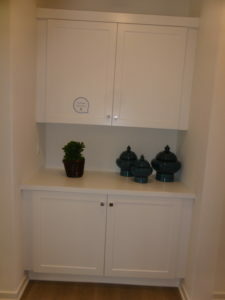 There are additional linen cabinets in the hallway. 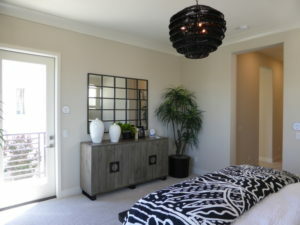 The master suite is at the front of the house. 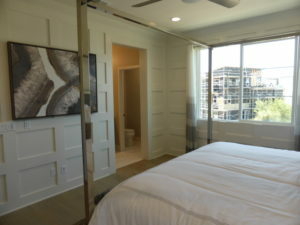 The bedroom is large, with windows on the two side walls and sliding doors at the front that open to a narrow balcony. 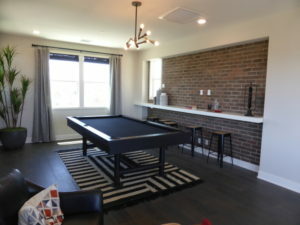 Upgrades include the four recessed LED lights, ceiling fan and pre-wire, flat screen TV outlet with conduit, and tile at bed wall. 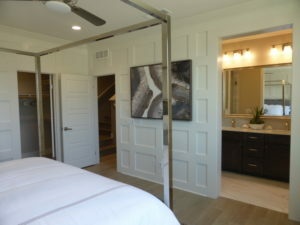 There is an option for a barn door separating the bedroom from the bathroom. 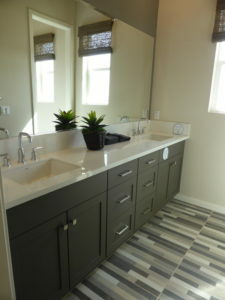 The bathroom has a vanity with two sinks, two sets of cabinets, and three drawers. 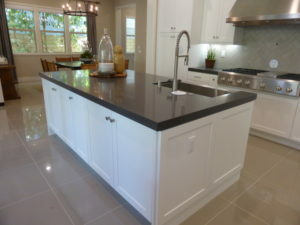 The countertop, backsplash, faucets, and accessories are upgrades. 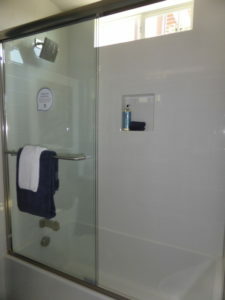 The shower is across from the vanity and includes a full seat. 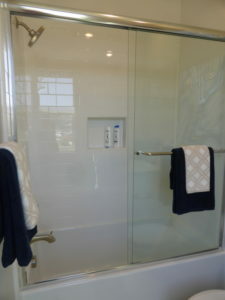 The shower tile surround and floor and shower enclosure are upgrades. 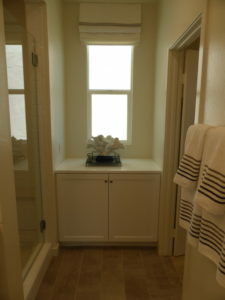 There are also upgraded cabinets above the toilet. 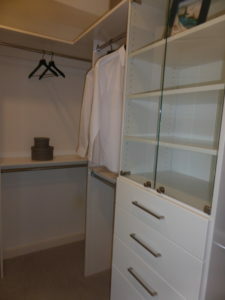 The walk-in closet is shown with the standard shelves and poles and has an upgraded mirrored door. 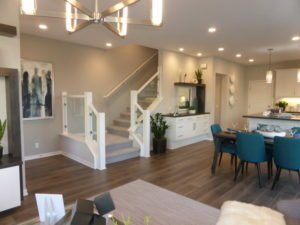 Only the 1X model has a third floor. 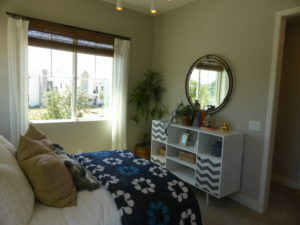 It has a big bonus room with windows on three walls. 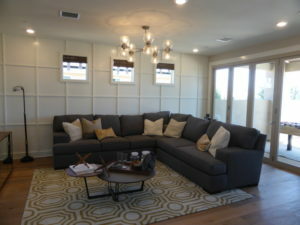 One side shows the optional built-in bar that spans the full length of the wall. 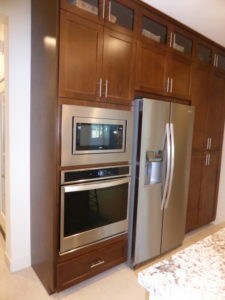 It includes a beverage center, fridge, freezer with ice maker, sink, dishwasher, and several cabinets and drawers. 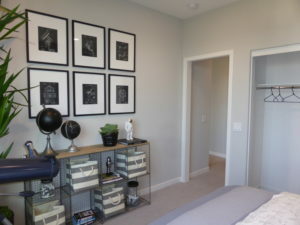 Even without the bar features, it would make a great spot for built-in storage cabinets or desks. 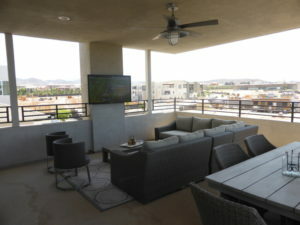 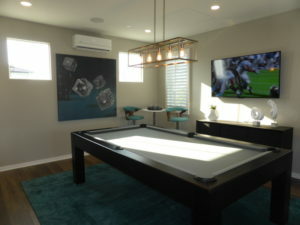 Additional upgrades shown in the model are the six recessed LED lights, ceiling fan and pre-wire, flat screen TV outlet with conduit, and floating shelves at bar. 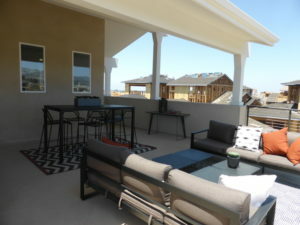 There is a large, covered deck off the bonus room. 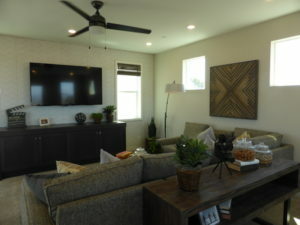 It has plenty of space for seating and is shown with an upgraded ceiling fan and pre-wire, and flat screen TV outlet with conduit. 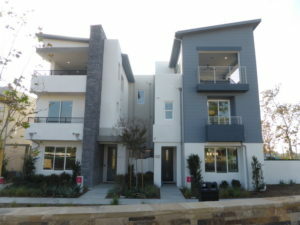 Residences 1 and 1X are quite similar to most of the other homes I’ve seen in Cadence Park and Parasol Park. 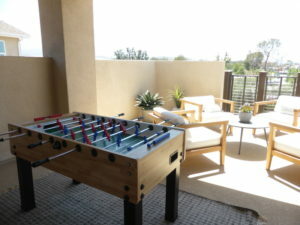 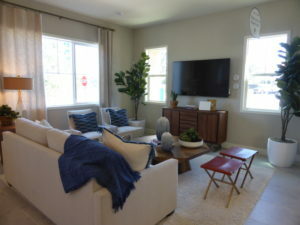 Without the bonus room option, this home is a smaller unit, as it only has three bedrooms and no loft, den, or other common space aside from the great room. 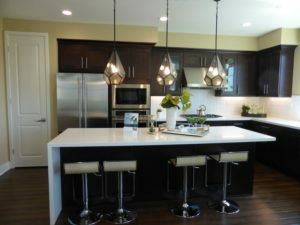 The home has a good layout and the kitchen has a lot of storage for a home of this size. 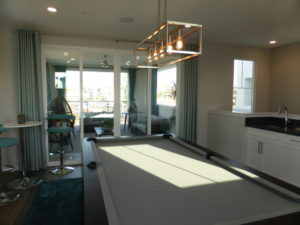 Residences 2 and 2X are the same on the first two floors; the key difference between them is the third-floor bonus room and deck available in residence 2X. 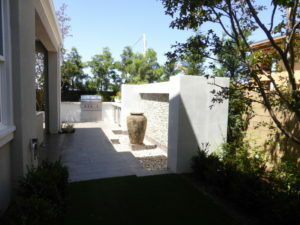 As in residence 1, this home has a covered walkway leading to the front door. 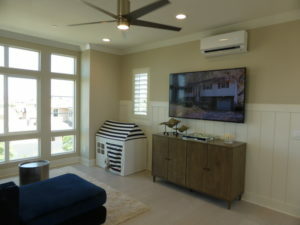 Upgrades found throughout the home include chrome poles throughout, cased windows at first floor, cabinet pulls, sound system, speakers, volume controls, security system, window treatments, flooring, interior paint, and all decorator’s items. 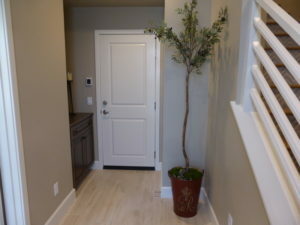 The house has a very small foyer but doesn’t have enough space to put anything in it. 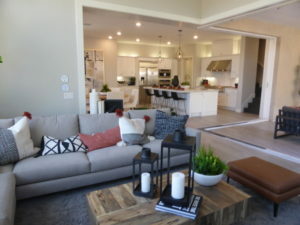 The great room is just to the right when you enter the home. 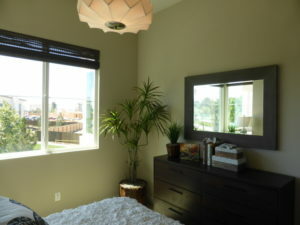 It has a big window facing the street and a smaller one on the side. 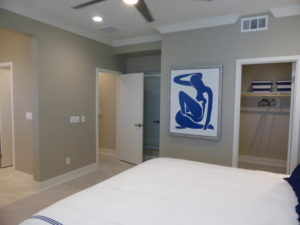 The room is a little bigger than in residence 1. 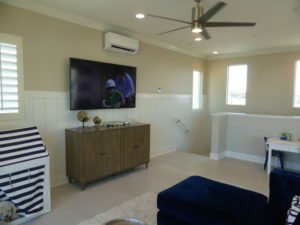 Upgrades include the recessed LED lights, hanging light and pre-wire, recessed flat screen TV outlet with conduit, and the floating cabinet with wrapping shelf. 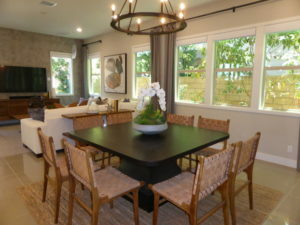 The dining area is an extension of the great room. 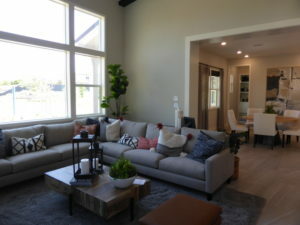 It can comfortably seat 6 – 8 people and would have room to expand when needed since it flows into the great room. 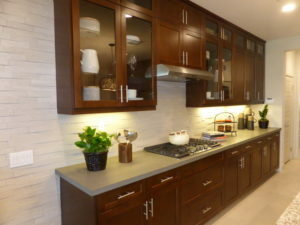 One wall is shown with optional built-in cabinets and mini recessed LED lights. 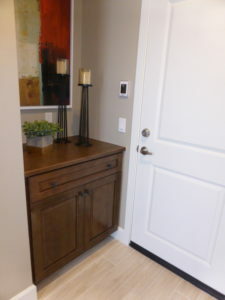 Without this built-in, there would be space for a freestanding hutch against the stairs. 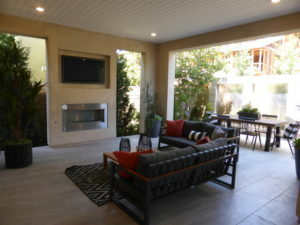 The opposite wall has sliding doors leading to the courtyard with an option for a 10’ slider. 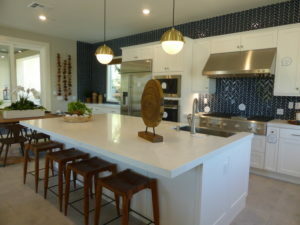 The kitchen is behind the great room. 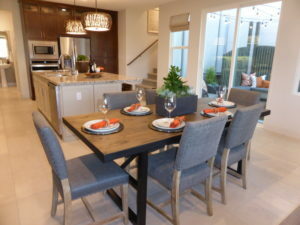 The large island can comfortably seat four people. 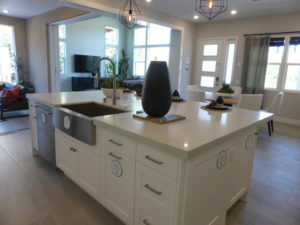 It has the sink and dishwasher on the other side. 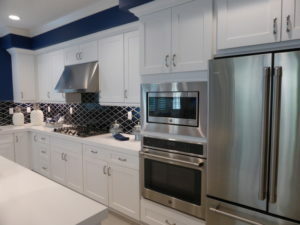 As in residence 1, one wall holds the cooktop and most cabinets while the other wall has the microwave, oven, fridge, and pantry-height cupboards. 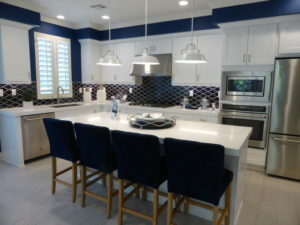 Upgrades in the kitchen include a KitchenAid stainless steel appliance package with second oven and French door refrigerator, soft close doors and drawers, countertop, tile splash, pendant lights and pre-wire, Sonetto stainless single basin sink, chrome pot filler, chrome InstaHot, garbage disposal, and switch for hot water recirculating pump. 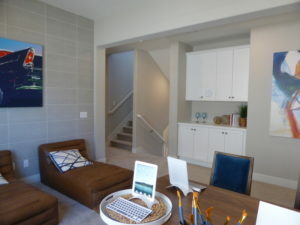 Direct access to the garage is in the back corner of the kitchen. 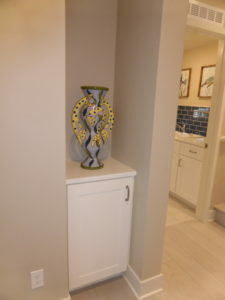 A doorway between the dining room and kitchen leads to the powder room and a storage closet. 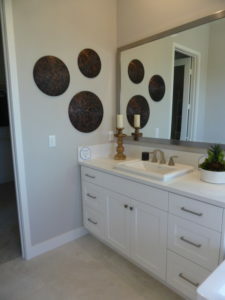 The powder room has a pedestal sink with an upgraded tile wall and inset mirror. 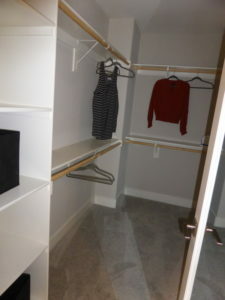 The closet is much bigger than in residence one, with storage that goes beneath the stairs. 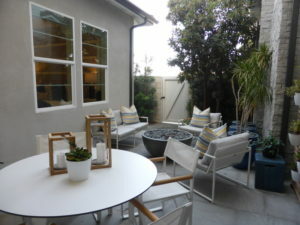 The courtyard is shown with a seating area and an upgraded, built-in barbecue. 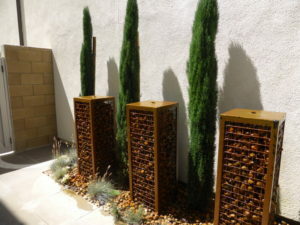 The fountains are also upgraded. 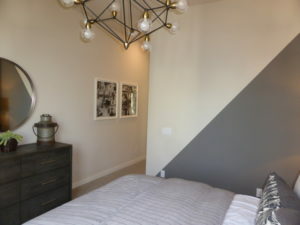 On the second floor, there is a loft at the top of the stairs. 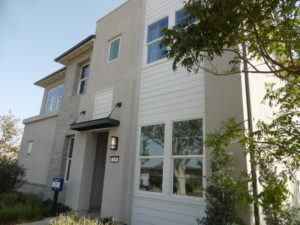 There is a single window facing the side of the house. 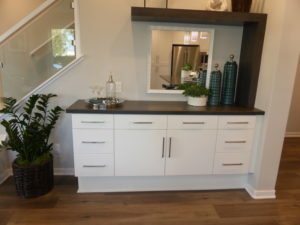 The model shows upgraded built-in cabinets and a floating shelf. 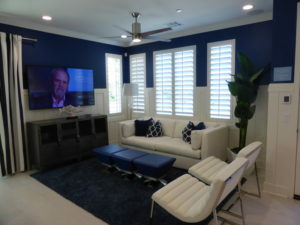 Additional upgrades include the flat screen TV outlet with conduit, ceiling fan and pre-wire, recessed LED lights, and the power screen shade. 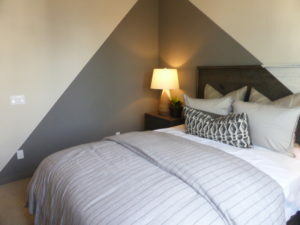 Both residences 2 and 2X have an option to convert the loft into a fourth bedroom. 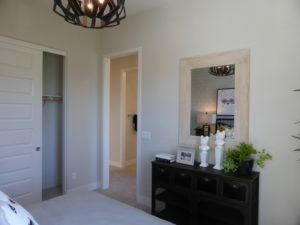 With that option, the closet would be along the new wall separating the bedroom from the hall. 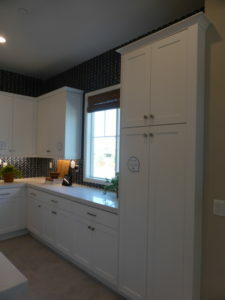 The linen cabinets between the two staircases are an upgrade only available in the 2X model. 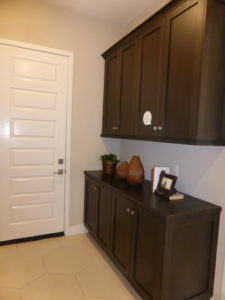 The linen cabinets at the end of the hallway are included in both models. 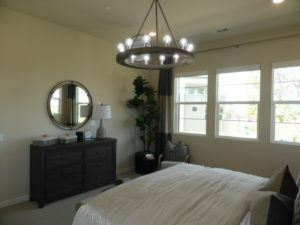 The master suite is at the front of the house. 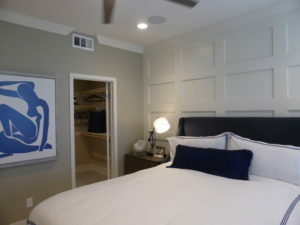 The bedroom is a good size and is shown with upgraded recessed LED lights, a hanging light fixture and pre-wire, and the tile wall. 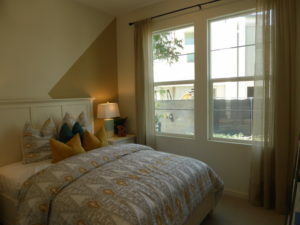 There are windows on each side of the bed and sliding doors leading to a small balcony overlooking the street. 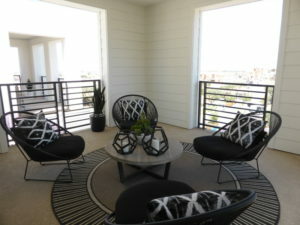 The balcony is much smaller than in residence 1. 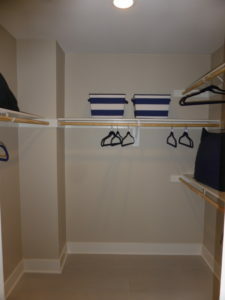 The walk-in closet is off the bedroom and is shown with upgraded organizers. 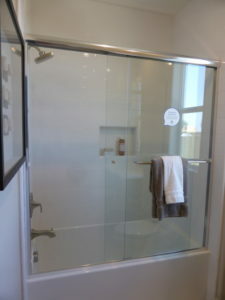 The model shows the optional barn door between the bedroom and bathroom, with an upgrade to a frosted glass door. 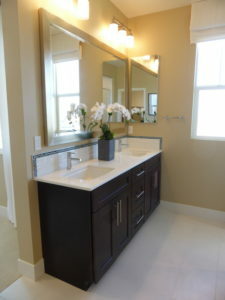 The vanity has dual sinks with two sets of cabinets and three drawers. 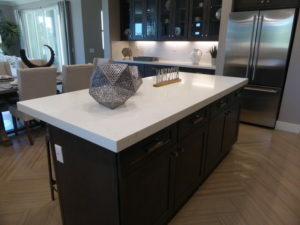 The quartz countertop with 6” splash and two framed mirrors are upgrades. 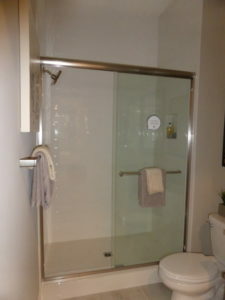 The shower is right next to the vanity and has a full seat. 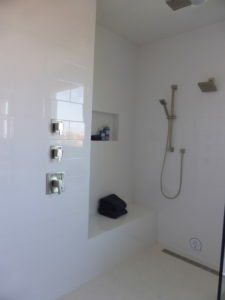 The Emerge angular shower column, tile surround, and quartz bench seat are upgrades. 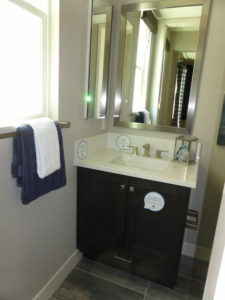 Additional upgrades in the bathroom include the Kohler bidet and the switch for recirculating pump. 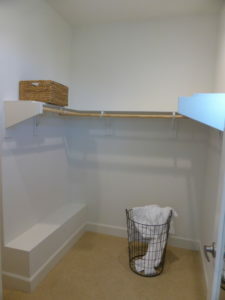 The laundry room is in the hall just past the stairs. 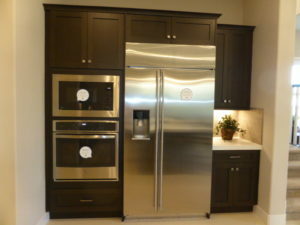 It has space for side-by-side machines and optional upper cabinets, as seen in the model. 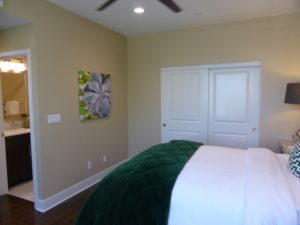 Bedroom 3 is across from the laundry room. 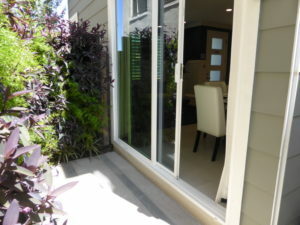 It has a window facing the side of the house and a standard bypass closet. 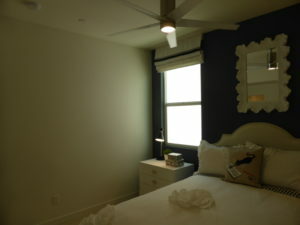 If the loft was converted to a bedroom, it would basically be a mirror image of bedroom 3. 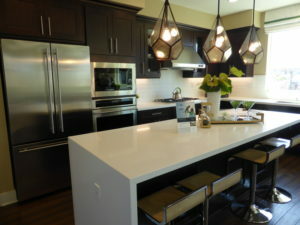 The recessed LED lights in the model are an upgrade. 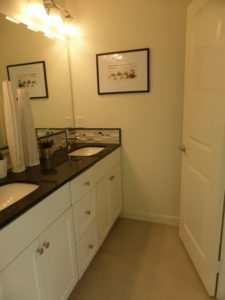 The secondary bathroom is next to the laundry room, across from the secondary bedrooms. 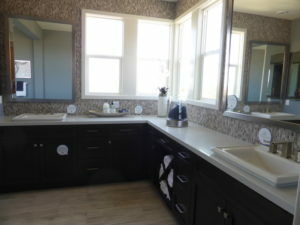 The vanity has two sinks, two sets of cabinets, and three drawers. 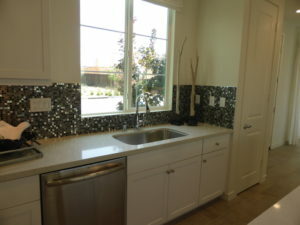 The quartz countertop and 6” tile splash are upgrades. 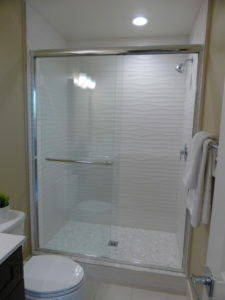 A separate door leads to the shower/tub combo, which has upgraded tile. 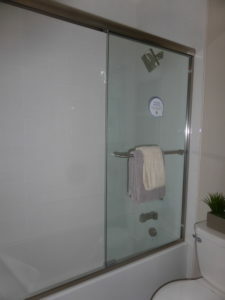 The switch for hot water recirculating pump is also an upgrade. 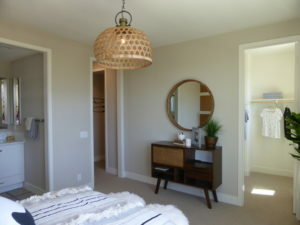 Bedroom 2 is at the end of the hall. 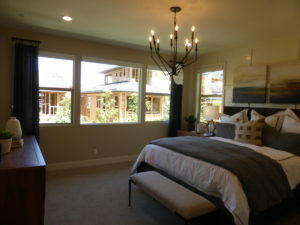 It is slightly larger than the other bedrooms and has windows facing both the back and side of the house. 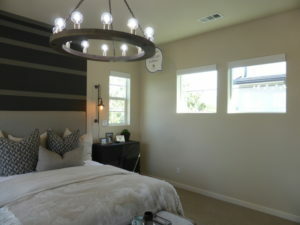 The recessed LED lights, hanging light, and pre-wire are all upgrades. 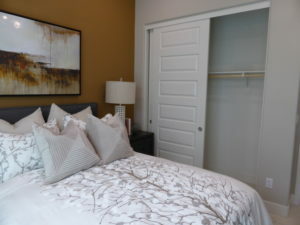 This is the only secondary bedroom in the Lyric collection to have a walk-in closet instead of a bypass. 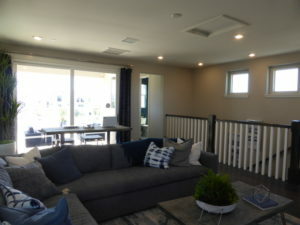 In the 2X model, there is a third-floor bonus room. 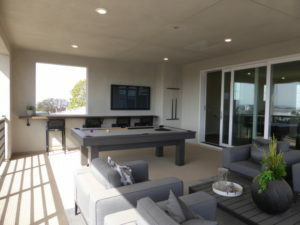 As in residence 1, the large room has windows on three walls and an optional built-in wetbar. 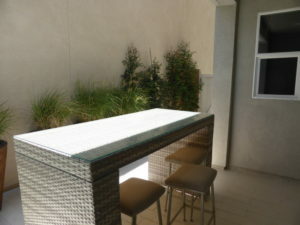 This bar is smaller and includes a sink and beverage fridge, with an upgraded quartz countertop and 6” splash. 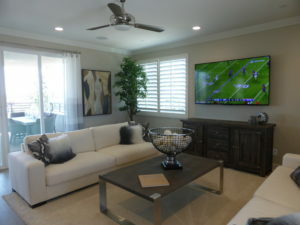 Additional upgrades in the model are the recessed LED lights, hanging light fixture and pre-wire, and flat screen TV outlet with conduit. 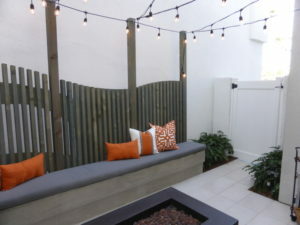 The covered deck is a good size and is shown with curtains for added privacy. 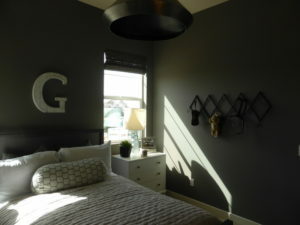 The ceiling fan and pre-wire are upgrades. 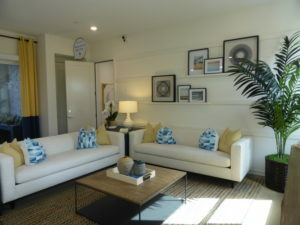 Residences 2 and 2X are laid out almost exactly the same on the on the first floor as the residence 1 and 1X models. 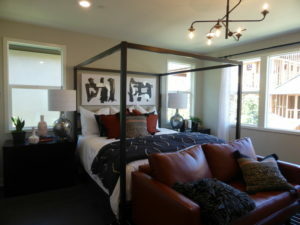 The second floor has a more linear layout in this model and has the addition of the loft/bedroom 4. 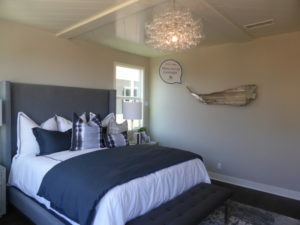 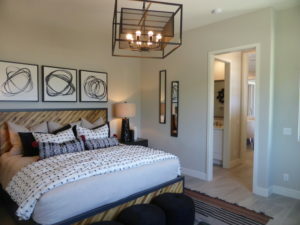 Though the Lyric collection is the first I’ve seen in Cadence Park by Tri Pointe Homes, it is remarkably similar to the homes designed by other builders. 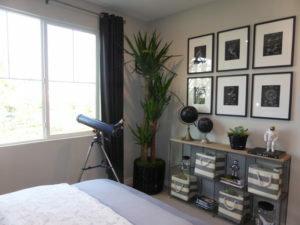 They are tall and narrow with a very boxy shape. 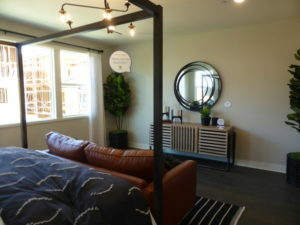 I was surprised to see that neither Lyric home offered a bedroom on the ground floor. 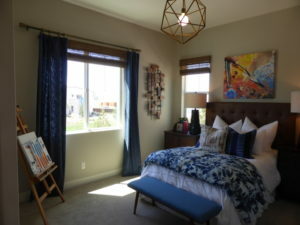 This entry was posted in New Homes on November 26, 2018 by Karen. 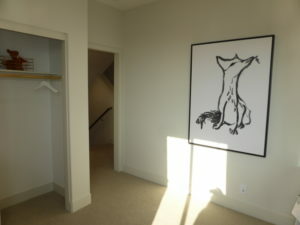 I recently visited the Chorus collection in Cadence Park. 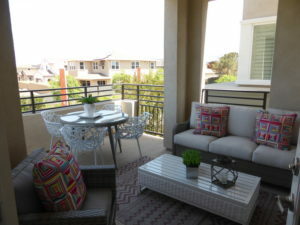 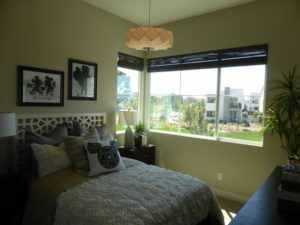 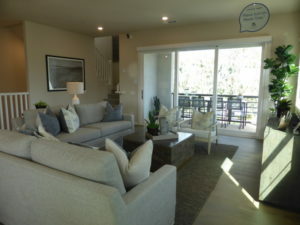 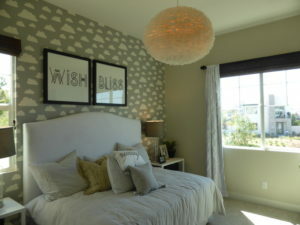 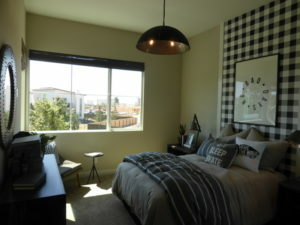 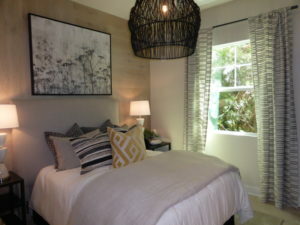 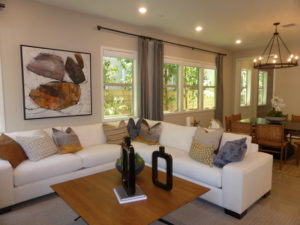 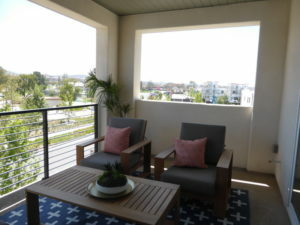 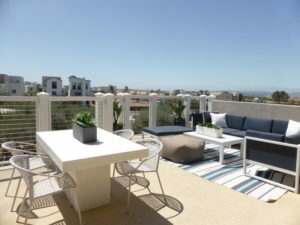 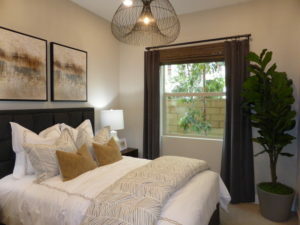 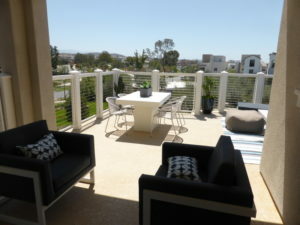 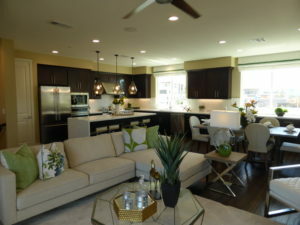 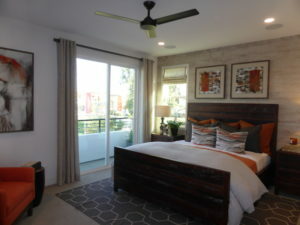 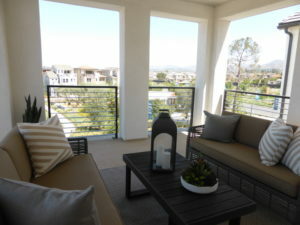 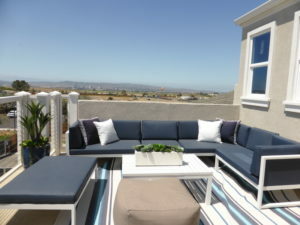 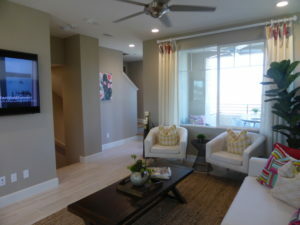 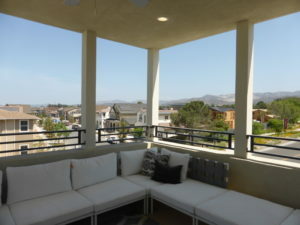 Built by Lennar, these attached condos have two floorplans. 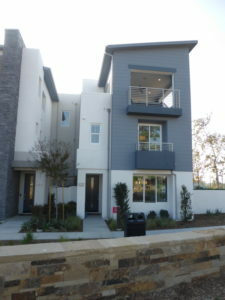 The smaller plan is a single-story unit while the larger is three stories. 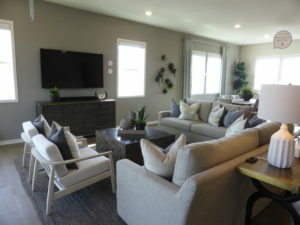 They range from 1,653 – 2,868 square feet with 2-3 bedrooms, 2-2.5 bathrooms, and a third-floor bonus room in the larger plan. 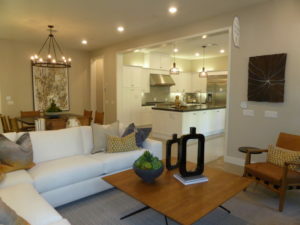 Each home has a private, two-car garage accessed from a shared motor court. 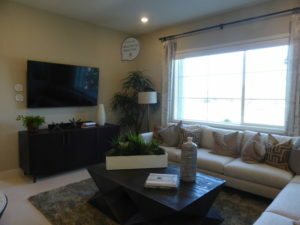 Chorus features Lennar’s “Everything’s Included” policy. 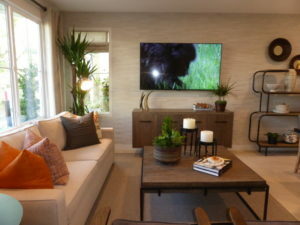 What you see in the models is primarily what you get and there aren’t many options to upgrade or customize the home. 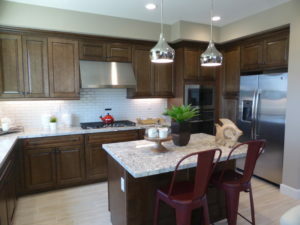 However, you can make changes to things like flooring, backsplashes, and paint. 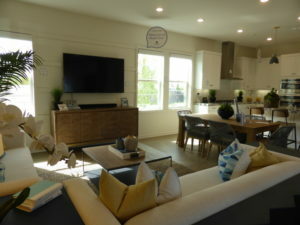 The homes come standard with smart products controlled by Amazon Alexa, including Echo Dot and Echo Show; Baldwin® Evolved smart lock; Honeywell Lyric round™ wi-fi thermostat; Leviton® Z-wave plug-in module; Lutron Caseta® wireless in-wall dimmer, Smart Bridge Pro, lamp module, and Pico remote with double stand; Ring® video doorbell pro; Samsung SmartThings® hub; and Sonos® PLAY:1 wireless speaker. 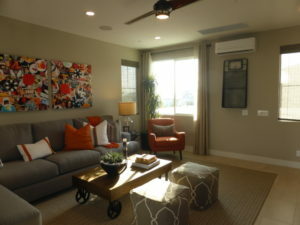 Efficiency features include energy-saving LED lights; radiant barrier roof sheathing; Sherwin-Williams® two-tone low-VOC interior paint; sealed heating and cooling ducts; dual-glazed windows with high performance low-E glass; full exterior door weather stripping; tankless water heater; smoke and carbon monoxide detectors; and pressure balanced valves in showers and tubs. 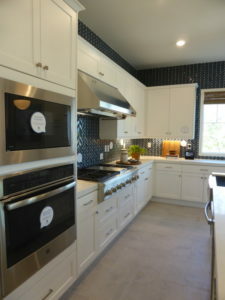 The kitchens have a GE stainless steel appliance package with Profile™ Series 5-burner gas cooktop, hood, built-in oven and convection microwave oven, dishwasher, and side-by-side refrigerator. 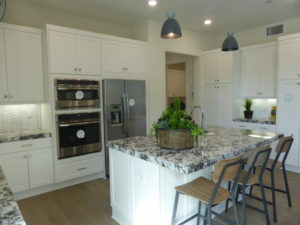 They have granite countertops with 6” backsplash and full-height splash at cooktop; Shaker-style cabinetry with soft-close hinges; under-cabinet task lighting; and roll-out shelf for trash and recycling. 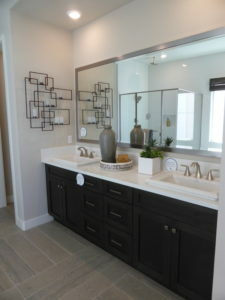 The bathrooms include Piedrafina™ countertops with 6” backsplash; Moen® bath accessories in chrome; frameless shower enclosure with ceramic tile surround and Moen® showerhead; and Shaker-style cabinetry with soft-close hinges in pre-selected colors. 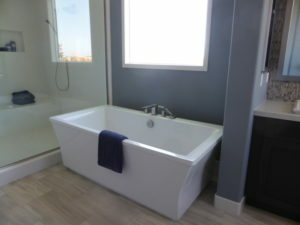 The master baths have undermount double sinks and a Fiber Care® deep soaking tub with tile surround and Piedrafina™ tub deck (per residence). 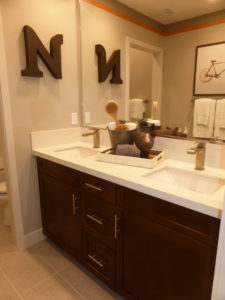 The laundry rooms have Piedrafina™ countertops with 4” backsplash; sink with Moen® pull-out faucet; and a vacancy switch. 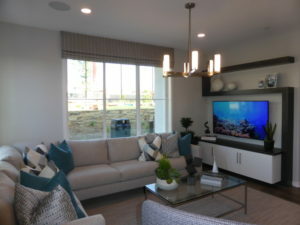 Additional features in the Chorus homes include Seagull® decorator-selected coach lights; Win-Dor stackable sliders with specialty casing for indoor/outdoor living; ThermaTru® insulated fiberglass 8’ entry door; Kwikset® satin nickel door levers; 4.5” baseboards; Daltile® glazed floor tile at entry, kitchen, baths, and laundry; plush wall-to-wall Mohawk® carpeting; USB outlets in kitchen and bedrooms; flat-screen TV blocking with smurf tubing to hide cables; rocker light switches; telephone jack in kitchen and master bedroom; and cable outlets in all bedrooms, living room, and den/bonus room. 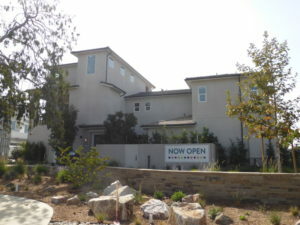 Chorus is part of the Irvine Unified School District. 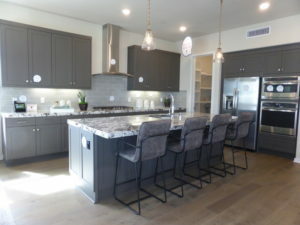 The brand new Cadence Park School serving grades K – 8 school opened in August 2018 with grades K – 6. 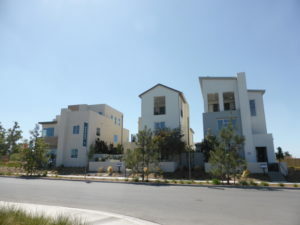 It will add 7th grade in 2019 and 8th grade in 2020. 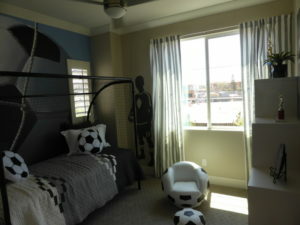 Until those grades are added, middle school students will attend Beacon Park School, which serves grades K – 8. 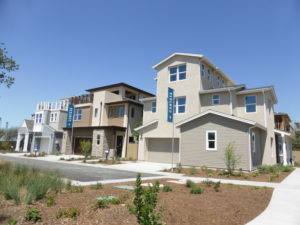 The neighborhood is served by Portola High School, which will have grades 9 – 11 in 2018-19 and will add 12th grade the following year. 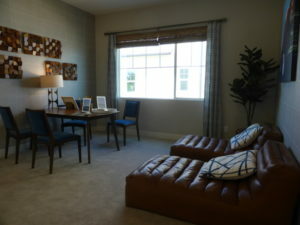 Seniors moving in this year will attend Northwood High School. 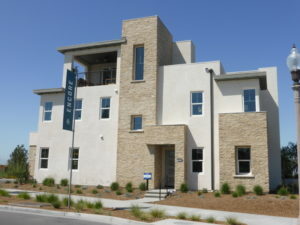 Residence 1 is a single-story unit on the ground floor. 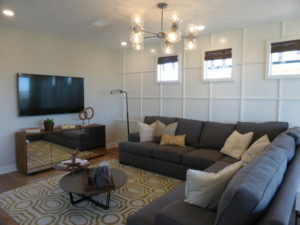 Wall treatments, flooring, lighting fixtures, window coverings, landscaping, ceiling treatments, crown moulding, and built-ins have been upgraded. 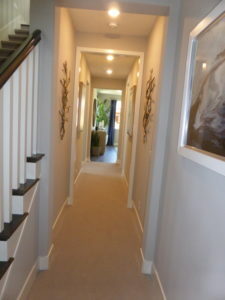 The foyer opens to a hallway that leads back to the main living areas of the home. 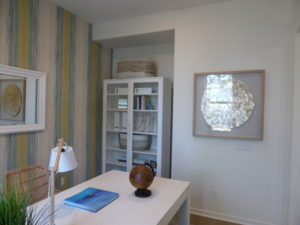 There is space along one wall for narrow table or bench. 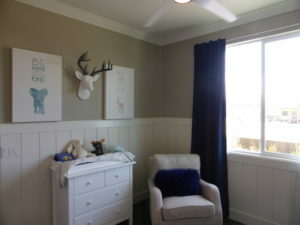 One wall of the foyer is fully open to the den. 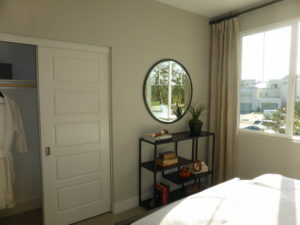 The 10’ x 12’ room has a single window facing the front walk. 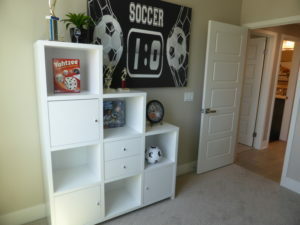 One corner could hold a built-in unit but is modeled with freestanding shelves. 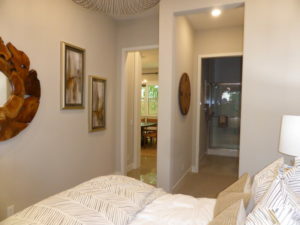 On the other side of the foyer, a short hall leads to a bathroom and bedroom 2. 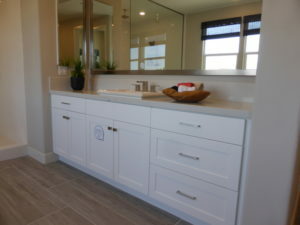 The bathroom has a single sink set into a large vanity, with two cabinets and six drawers. 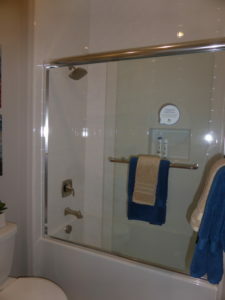 A separate door leads to the shower/tub combo. 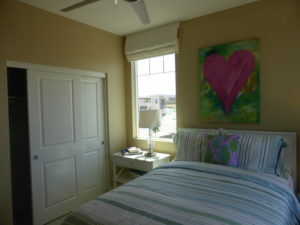 Bedroom 2 is 11’ x 10’ with two windows facing the front of the house. 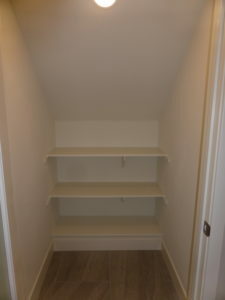 It has a standard bypass closet with a single shelf and pole. 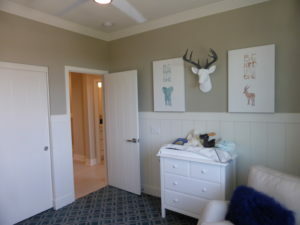 Just past the den, a hallway on one side leads to the laundry room and master suite. 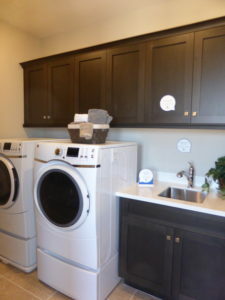 The laundry room features side-by-side machines with cabinets above them. 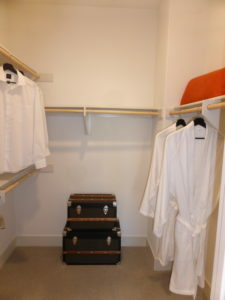 There are additional linen cabinets in the hall outside the room. 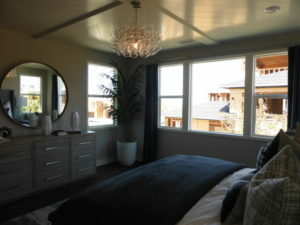 The master bedroom is 13’ x 15’ and has two small windows on the side of the house. 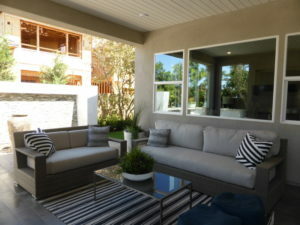 Two other windows face the home’s courtyard. 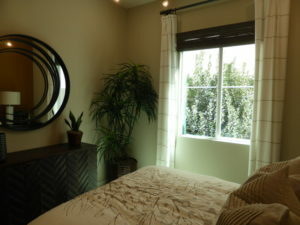 The room doesn’t border any other living areas or bedrooms, so it has a good amount of privacy. 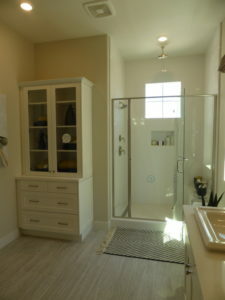 The master bathroom is through an open doorway. 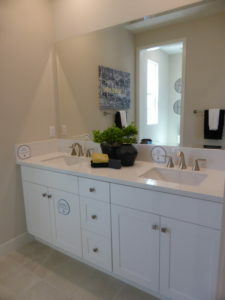 The two sinks are set into a large vanity, with two sets of cabinets and six large drawers. 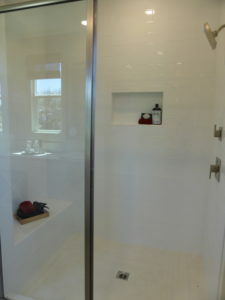 The shower is a good size and includes a shampoo niche and bench. 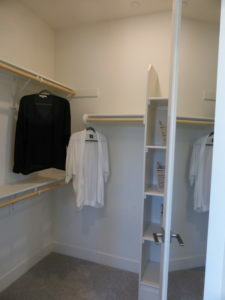 The walk-in closet includes two shelves and poles and a built-in shoe rack. 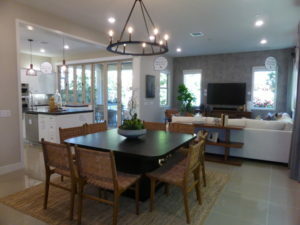 The main hall opens to the kitchen. 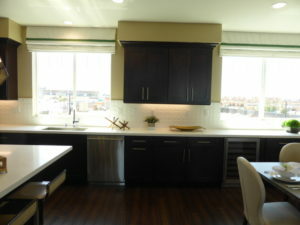 It is 18’ x 8’ with a center island that includes the sink, dishwasher, and seating for 2 – 3 people. 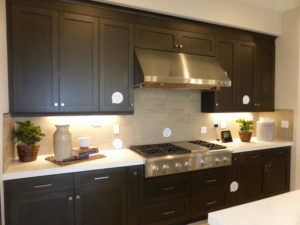 The L-shaped counters around it have the cooktop on one wall and the rest of the appliances on another. 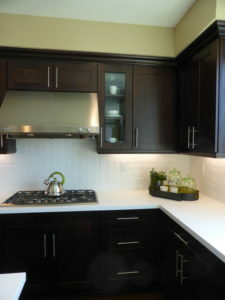 There are several upper and lower cabinets along with several drawers. 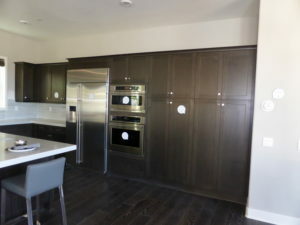 Another wall includes two sets of pantry-height cupboards and a short counter with another set of upper and lower cabinets. 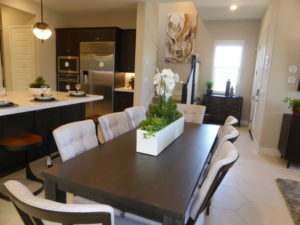 The dining area is just past the kitchen. 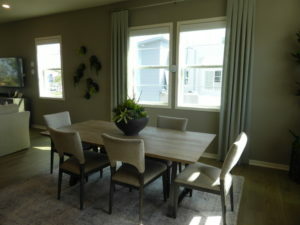 Two windows face the side of the home and it has space for a table that comfortably seats 6 – 8 people. 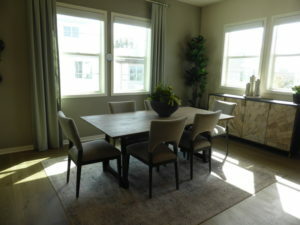 The living room is behind the dining room. 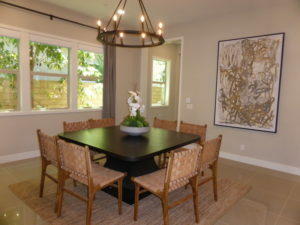 It is 18’ x 19’ but I think that measurement includes the dining area, too. 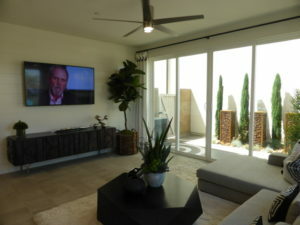 The living room has windows on one side and sliding doors opening to the courtyard on the opposite wall. 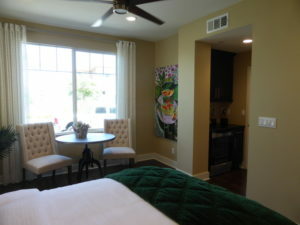 The room is a comfortable size and I like that it’s fully open to the kitchen and dining area. 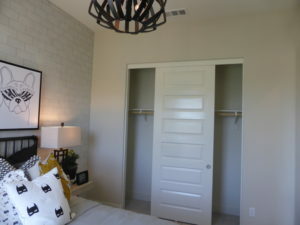 Along the back wall, there is a small coat closet and access to the garage. 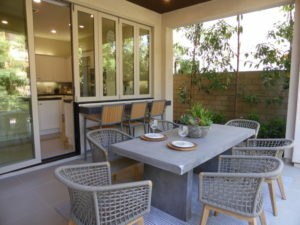 The courtyard has plenty of space for a grill, table, and separate seating area or garden. 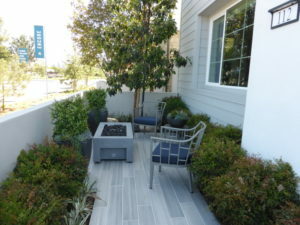 The model shows a fire pit for outdoor entertaining. 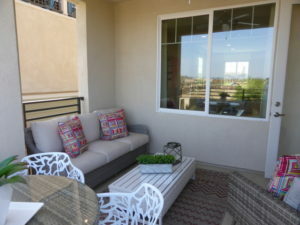 This home is laid out well and the outdoor space is a good size for a condo. 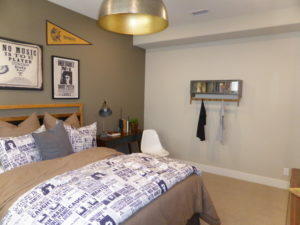 The den is a nice addition that adds flexibility to the space. 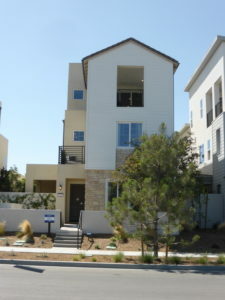 Residence 2 is a three-story unit but only the garage is on the first floor. 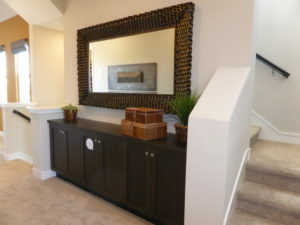 The small foyer doesn’t have much space for a table or anything. 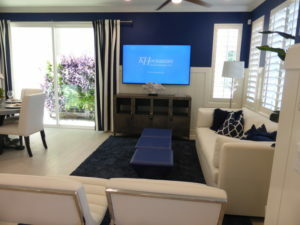 As in residence one, wall treatments, flooring, lighting fixtures, window coverings, landscaping, ceiling treatments, crown moulding, and built-ins have been upgraded. 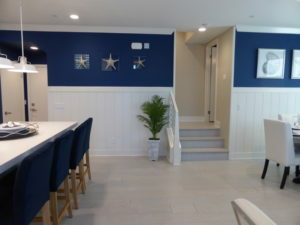 On the main floor, the stairs open to the 13’ x 13’ kitchen. 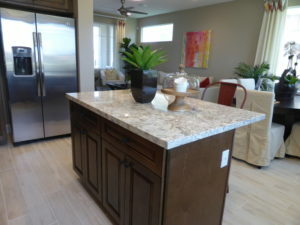 The island is a lot bigger than in residence one, with seating for four people, the sink, dishwasher, and several cabinets and drawers. 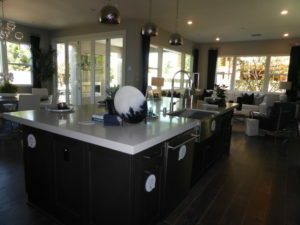 There is a long counter behind the island with the cooktop in the middle and a lot of cabinets and drawers. 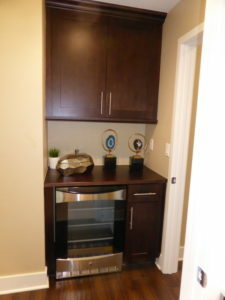 The shorter wall has the fridge, oven, and microwave. 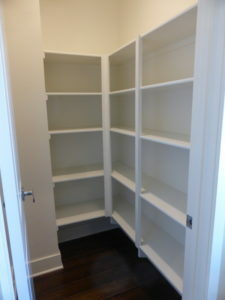 One corner of the kitchen has a walk-in pantry with shelves lining two walls and an obscure lass door. 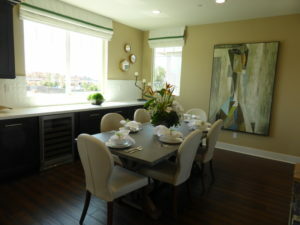 The dining room is next to the kitchen. 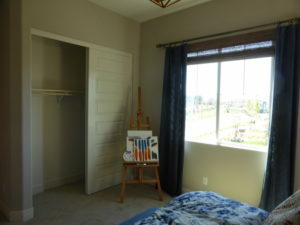 It is 13’ x 12’ and has two windows facing the back and two more on the side. 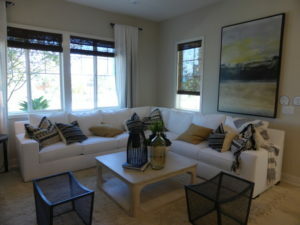 It can comfortably seat 6 – 8 people and has space to expand into the living area if needed. 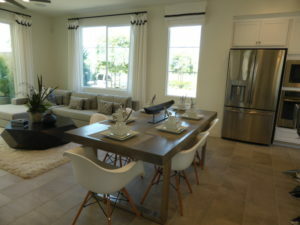 The living room is 20’ x 21’ and open to both the kitchen and dining room. 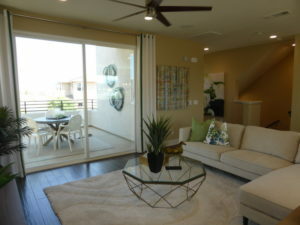 There are two windows facing the motor court and sliding doors leading to a deck on one side. 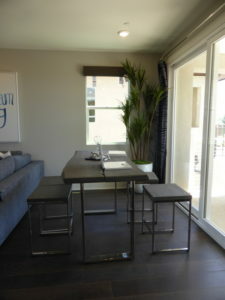 The long deck is shown with a narrow table and high chairs. 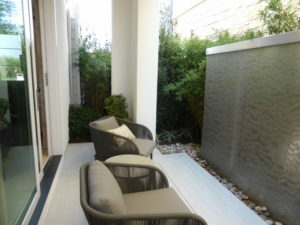 It overlooks the motor court and is open on two sides. 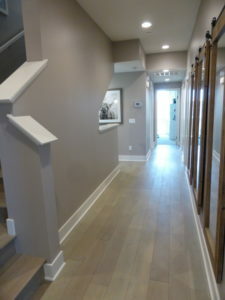 A long hallway between the kitchen and the stairs leads to the bedrooms and bathrooms. 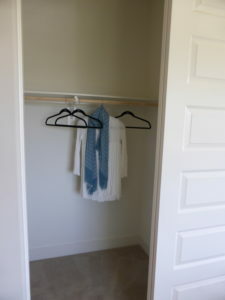 The first offshoot of the hall has a small coat closet, powder room, and the laundry room. 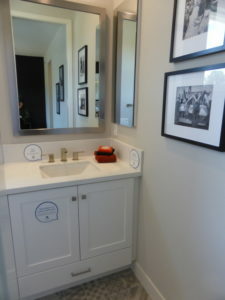 The powder room includes a single sink set into a small vanity. 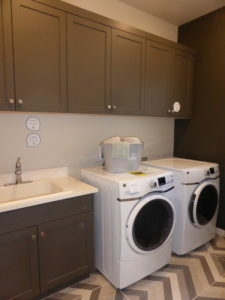 The laundry room has side-by-side machines a sink, and upper cabinets. 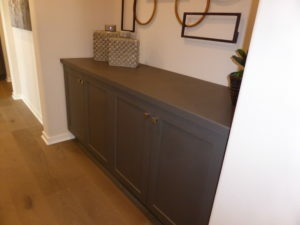 There are additional base cabinets in the hall just past the laundry room. 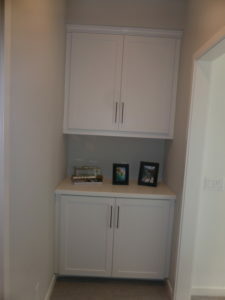 Another set of upper and lower cabinets is at the end of the hall. 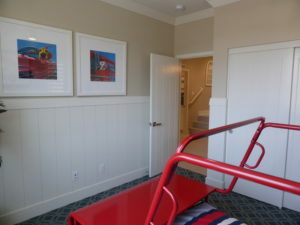 Bedroom 2 is on the other side of the hall. 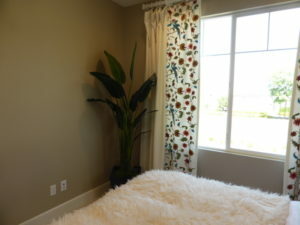 It is 12’ x 12’ with two windows facing the side of the house. 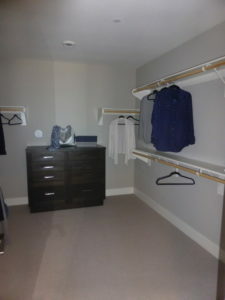 The walk-in closet includes shelves and poles on two walls. 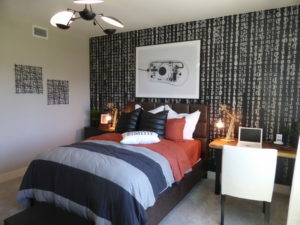 Bedroom 3 is just past bedroom 2. 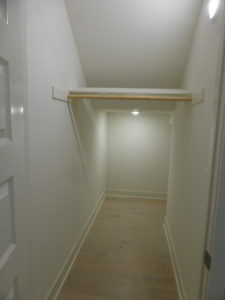 It is also 12’ x 12’ but also has an entry hall that includes a bypass closet. 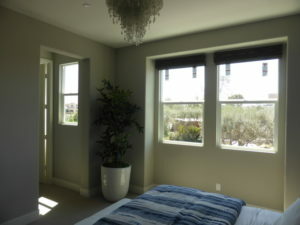 The room has two windows facing the front of the house. 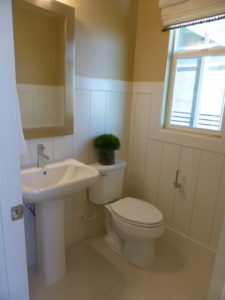 Bathroom 2 sits between the two bedrooms. 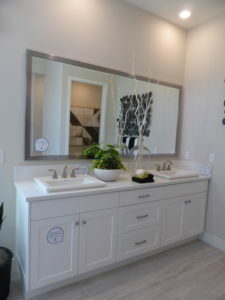 It has two sinks set into a shared vanity, with two sets of cabinets and six drawers. 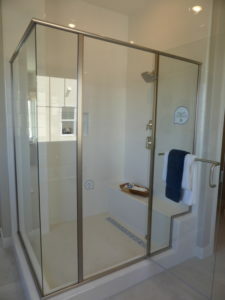 The shower/tub combo is through a separate door. 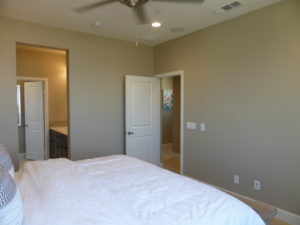 The master suite is across the hall from the secondary bedrooms. 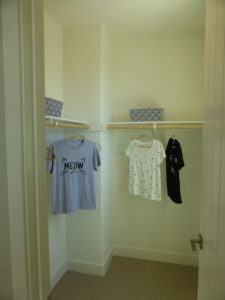 When you enter the suite, the walk-in closet is on one side and the bathroom is on the other. 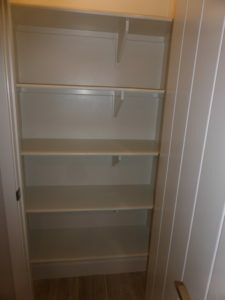 The closet is a good size, with several shelves and poles throughout and a built-in shoe rack. 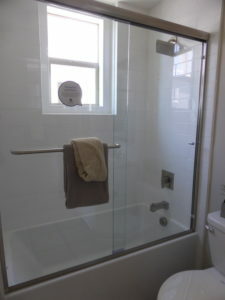 The bathroom has a free-standing tub across from the door. 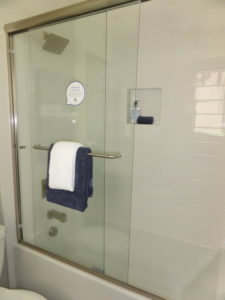 The adjacent shower has a seat on one side. 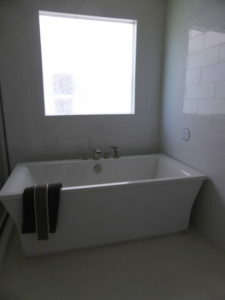 Both the shower and tub have windows that face the street. 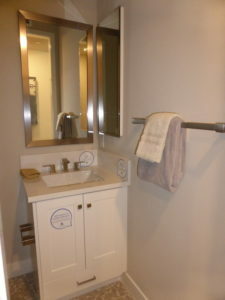 The vanity is across from the shower. 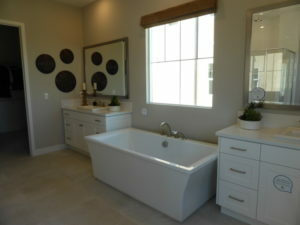 Like the secondary bath, it has two sinks, two sets of cabinets, and six drawers. 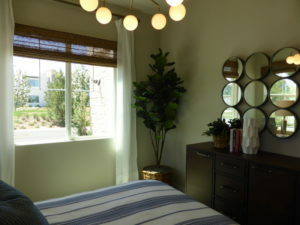 The master bedroom is 14’ x 16’ and has windows on three walls, though some are quite small. 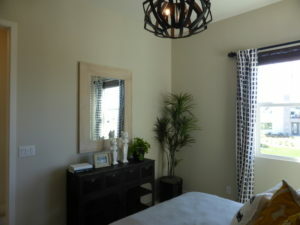 The room itself feels bright and spacious. 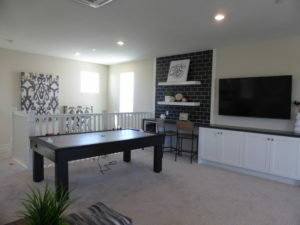 The third floor has a 14’ x 21’ bonus room. 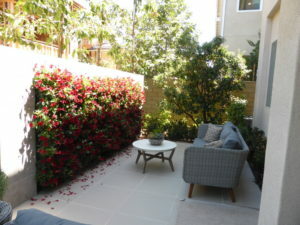 It is long enough to be split into a couple of distinct spaces. 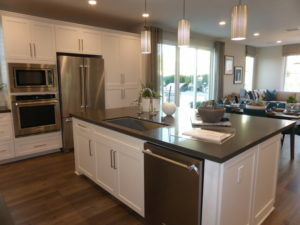 The model shows a built-in unit with base cabinets and an under-counter fridge. 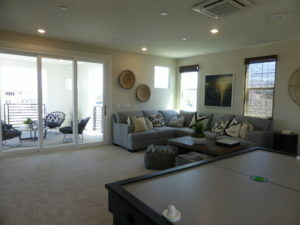 The bonus room has windows on three walls and sliding doors leading to a large deck on the other. 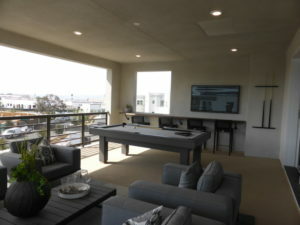 The deck is actually bigger than the bonus room. 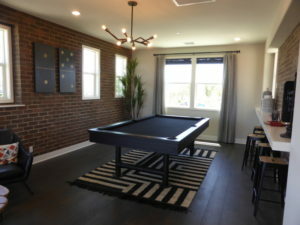 The covered space is shown with a pool table, bar stools on one wall, and plenty of comfortable seating. 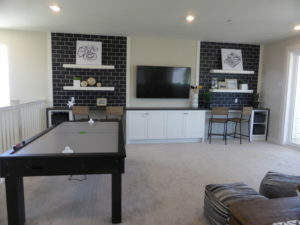 I would have liked to see a bigger bonus room and smaller deck, since I think the inside room will get more use than the outside space. 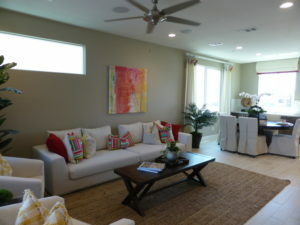 Otherwise, the home has a good layout. 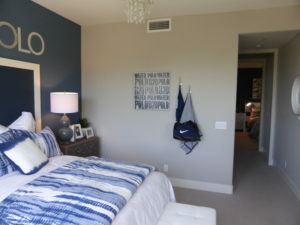 Each bedroom is offered some privacy, as they only share walls with closets and bathrooms, rather than bedrooms or living areas. 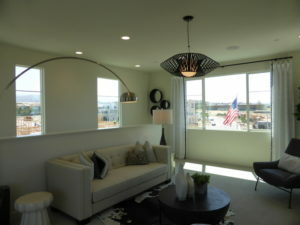 The two floorplans of the Chorus collection offer good layouts and flexibility. 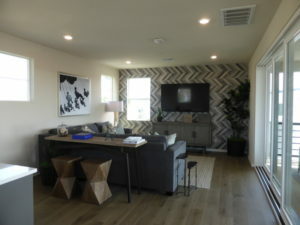 I can see the smaller, single story unit being quite popular, as there aren’t many options like that in Irvine right now. 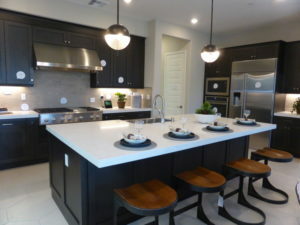 This entry was posted in New Homes on October 24, 2018 by Karen. 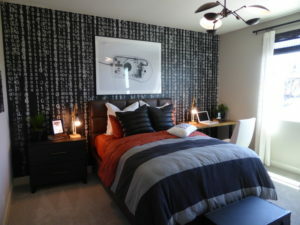 Last month, I saw the Deco collection at Cadence Park. 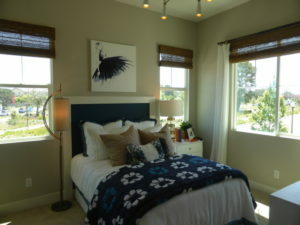 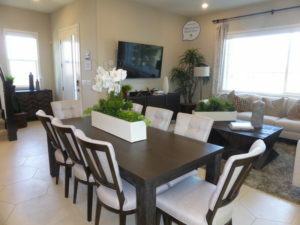 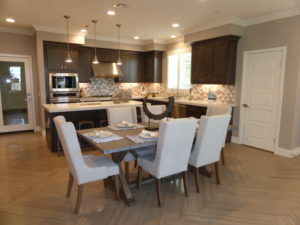 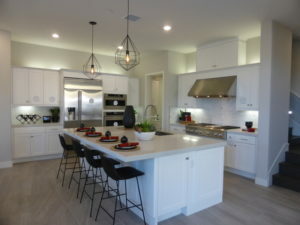 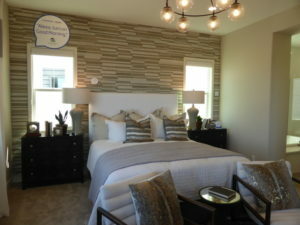 Built by K. Hovnanian Homes, the collection will have 93 homes with six different floorplans. 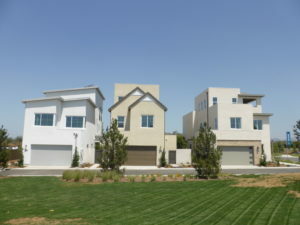 The homes sit on both sides of Cultivate near the northeast section of Cadence Park. 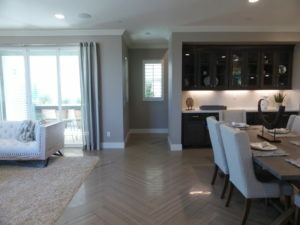 Deco homes range from 1,616 – 2,300 square feet, with 2 – 4 bedrooms and 2.5 – 3.5 bathrooms. 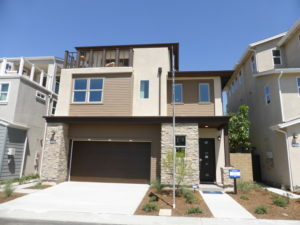 All homes are three stories with 2-car garages and some models have a bonus room. 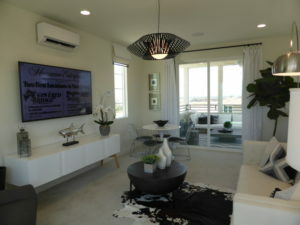 Deco homes come standard with energy-efficient, dual-pane, low-E windows; LP Tech Shield ® radiant barrier roof sheathing; heat and air conditioning with programmable digital thermostat; MERV 8 filters for dust, mold, and allergens; low VOC paint; LED recessed can lights; tankless water heater; Uponor-PEX plumbing; pre-wire for telephone in kitchen and master suite; pre-wire for cable/phone combo in great room and master suite; pre-wire for ceiling fan J-box in great room and master suite; and fire sprinklers. 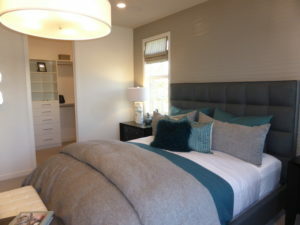 Deco homes also have energy-efficient, 8-foot, insulated fiberglass entry door with Kwikset® chrome handle set; ceramic tile flooring at entry, kitchen, baths, and laundry; carpet at great room, dining, stairs, bedroom, and bonus room; Progress® designer lighting including Oasis Collection chrome fixtures; base moulding; 6’8” interior doors per plan; Kwikset® chrome lever interior door hardware; and fully finished and textured garages. 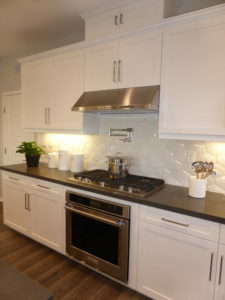 The Deco kitchens include quartz slab countertops in two colors; European-style white thermofoil cabinetry with recessed panels, hidden hinges, and brushed nickel knobs; stainless steel single compartment under-mount sink with waste disposal system; Moen® kitchen faucet with pull-out spray; GE® Energy Star stainless steel appliances, including 36” cooktop with hood, built-in oven, built-in microwave, and dishwasher; refrigerator space pre-plumbed for ice maker; recessed can LED lights; and pantries with painted shelves per plan. 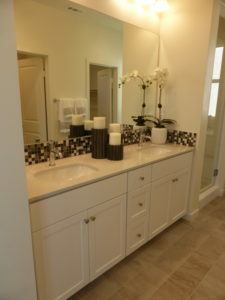 The bathrooms come standard with Moen® designer chrome fixtures; shower with subway tile surround in master suite; executive height white thermofoil cabinetry with dual sink vanities and quartz countertop; plate glass mirrors, Progress® Oasis Collection light fixtures; powder baths with pedestal sinks and square mirrors (per plan); single handle faucets throughout; and mirrored medicine cabinets at master suite. 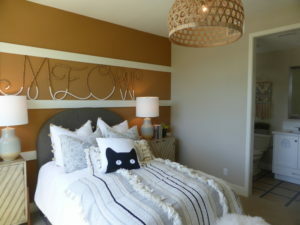 Deco is part of the Irvine Unified School District. 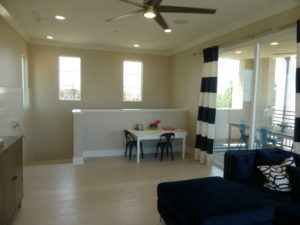 The brand new Cadence Park School serving grades K – 8 school opened in August 2018 with grades K – 6. 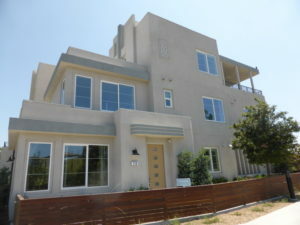 It will add 7th grade in 2019 and 8th grade in 2020. 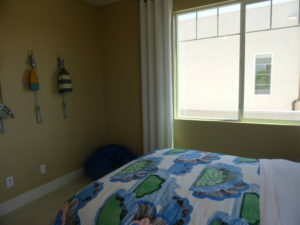 Until those grades are added, middle school students will attend Beacon Park School, which serves grades K – 8. 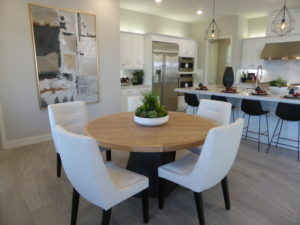 The neighborhood is served by Portola High School, which will have grades 9 – 11 in 2018-19 and will add 12th grade the following year. 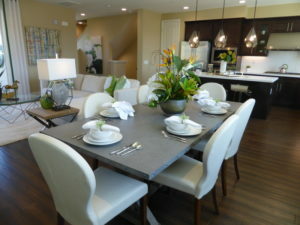 Seniors moving in this year will attend Northwood High School. 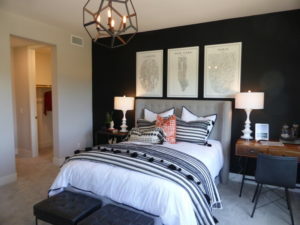 Pontiac is modeled in the Mid-Century Modern elevation, with Contemporary Spanish and Abstract Traditional options also available. 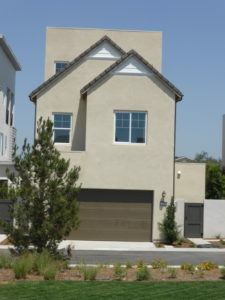 The front door is on one side of the house and the garage is on another. 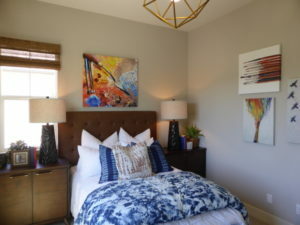 Upgrades found throughout the home include flooring, window and wall treatments, paint, ceiling fans, lighting, and all decorator’s items. 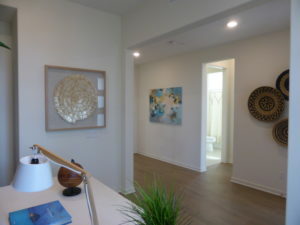 Inside, the home lacks a true foyer. 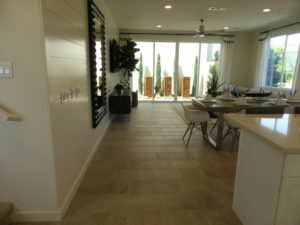 The kitchen is immediately on the right, the stairs are in front of the door, and a narrow hallway on the left leads to the powder room and garage. 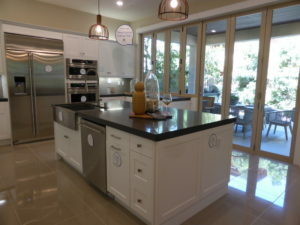 The kitchen is a good size. 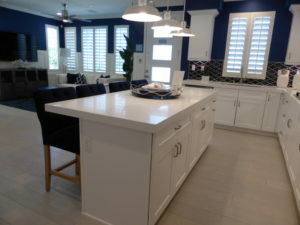 The long island has cabinets and drawers on one side and seating for four on the other. 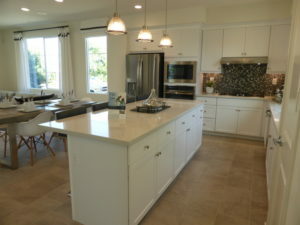 One side of the kitchen has the sink and dishwasher beneath a window facing the front walk. 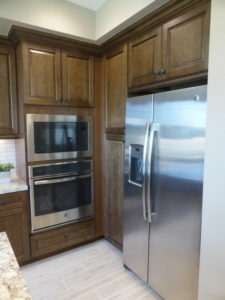 The other wall has the stove, oven, microwave, and fridge. 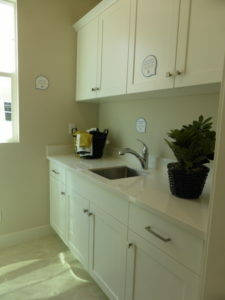 The pantry is next to the sink and includes four shelves. 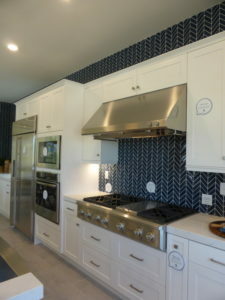 The tile backsplash is upgraded. 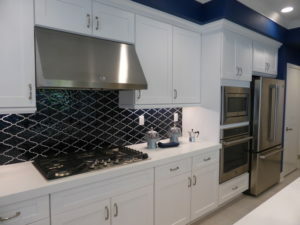 Many of the upper cabinets are small and too high to reach for everyday use and there aren’t any large drawers, so storage may be a bit tight even though the kitchen is a good size overall (12’9” x 14’6”). 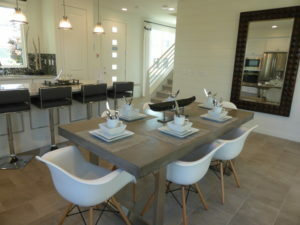 The dining room is behind the kitchen. 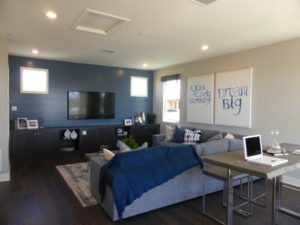 It’s an undefined space within the 16’6” x 16’8” great room. 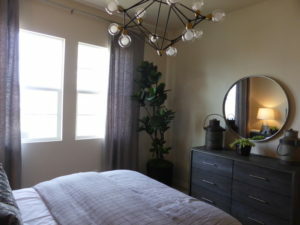 One wall has space for a china hutch and the other has a window facing the side of the house. 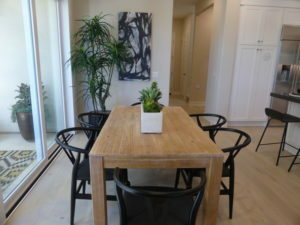 The space can comfortably seat 6 people and there is space for a larger table if needed. 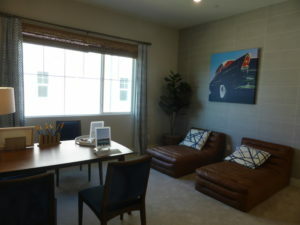 The great room is at the bag of the house. 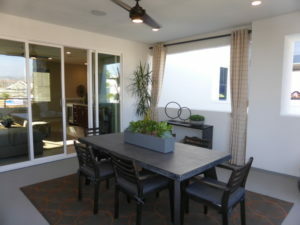 It has a large window on one wall and sliding doors leading to a private courtyard on another. 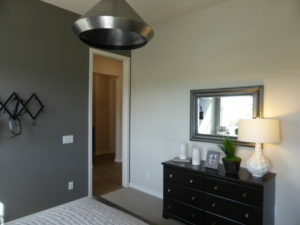 The model shows the optional center meet door instead of a standard slider. 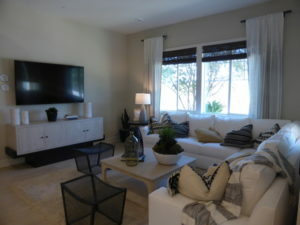 The setup of the room doesn’t leave a lot of options for arranging the furniture. 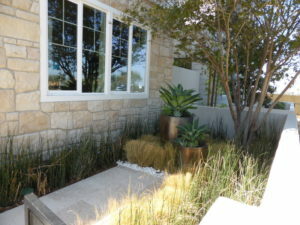 The courtyard is modeled with a fountain and rock bed. 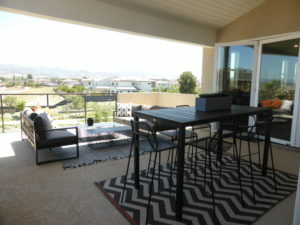 The area has enough space for a grill and a small table and chairs. 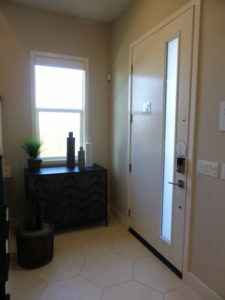 The long hall off the foyer leads to a small powder room. 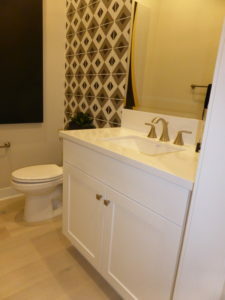 It has the standard pedestal sink and single-handle faucet but is shown with upgraded floor tile. 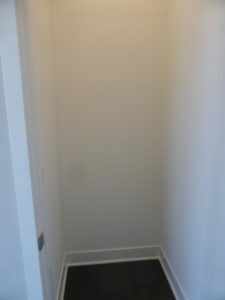 Access to the garage is just outside the bathroom, as is a closet beneath the stairs. 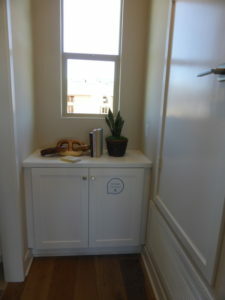 The second floor has a set of linen cabinets at the top of the stairs. 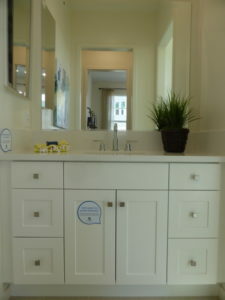 The model shows the optional upper cabinets, too. 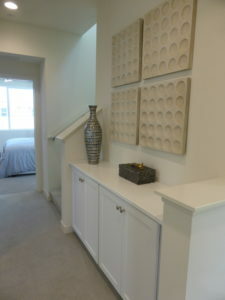 A second set of base linen cabinets sits between the two staircases. 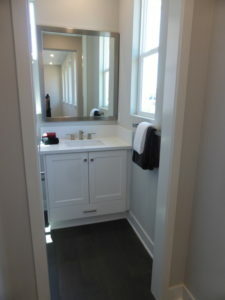 The secondary bathroom is at the end of the hall. 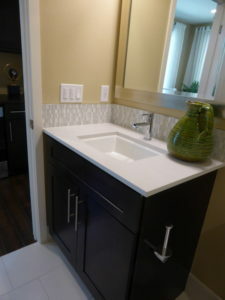 It has two sinks and an upgraded backsplash. 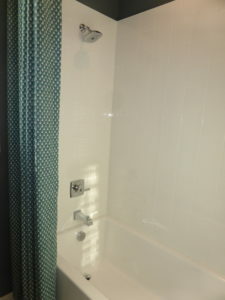 The shower/tub combo is through a separate door and also has upgraded tile. 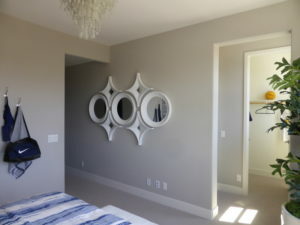 Bedroom 2 is at the end of the hall. 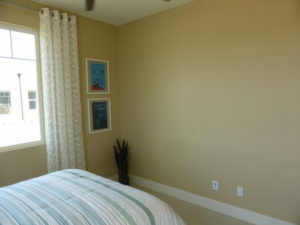 It is 10’11” x 11’7” with windows on two walls. 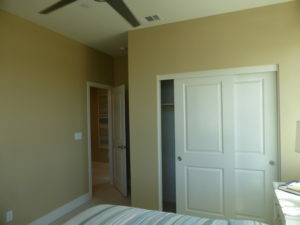 The room has a standard bypass closet and an upgraded ceiling fan. 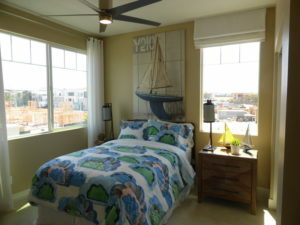 Bedroom 3 is adjacent to bedroom 2. 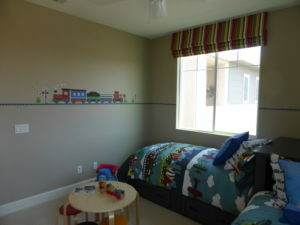 This smaller room is 10’9” x 11’3” and has just one small window on the side. 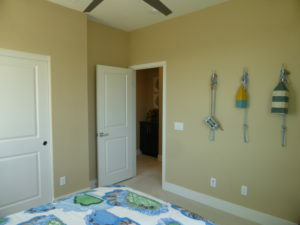 Like the first room, this one has an upgraded ceiling fan and a bypass closet. 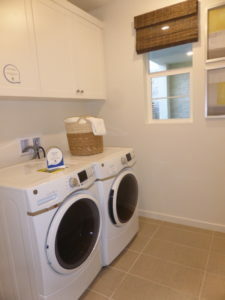 The laundry room is outside the bedrooms. 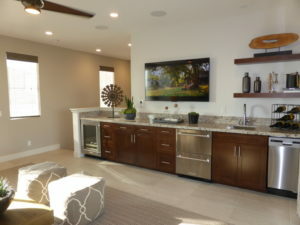 It has space for side-by-side machines and a shelf above them. 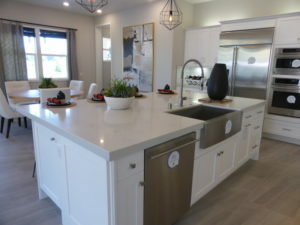 The room does not have a sink, counter, or any cabinets. 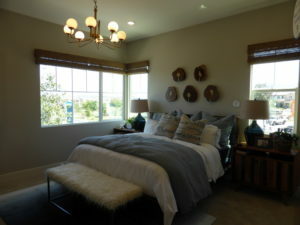 The master suite is at the front of the house. 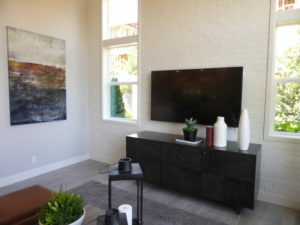 It measures 13’1” x 13’5” and has windows on two walls. 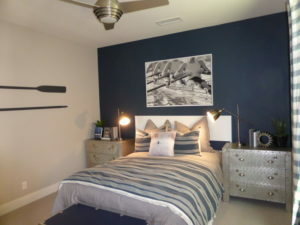 The model shows an upgraded ceiling fan. 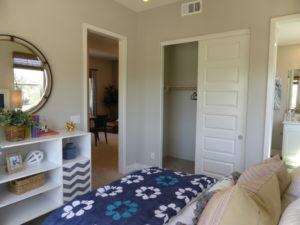 There doesn’t appear to be an option for a door separating the bedroom from the bathroom. 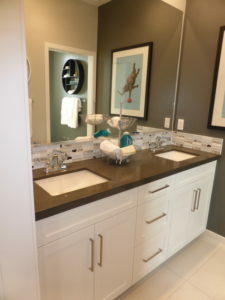 The master bathroom has dual sinks set into a shared vanity. 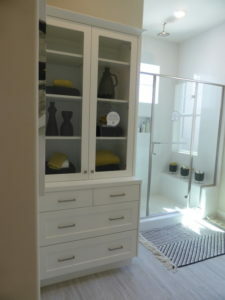 It has two sets of cabinets and three small drawers. 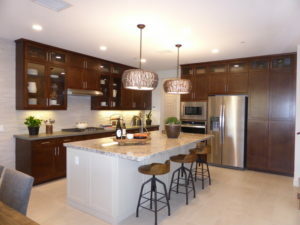 There is a set of base cabinets at the end of the room, too. 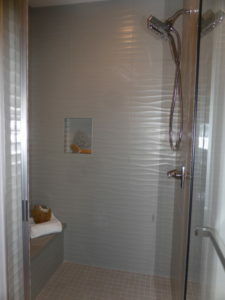 The shower is a square stall with a narrow bench on one side and upgraded tile throughout. 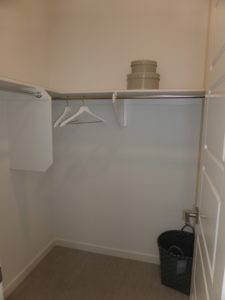 The walk-in closet is across from the shower. 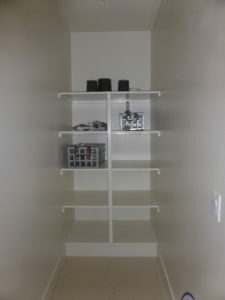 It has shelves and poles along three walls. 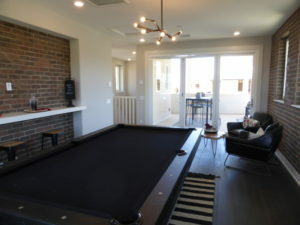 The third floor of this home is a 12’6” x 20’5” bonus room. 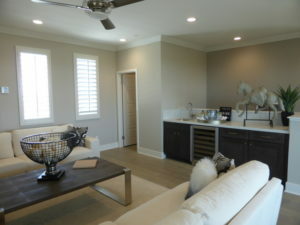 There is an option for built-in cabinets along the staircase, though they aren’t shown in the model. 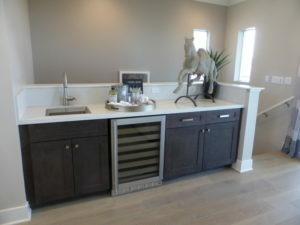 It also has an option for a wet bar at the end of the row of cabinets. 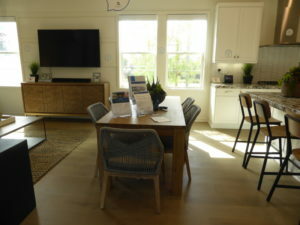 The room would probably feel quite narrow if the cabinets were included and it wouldn’t leave much space for a couch. 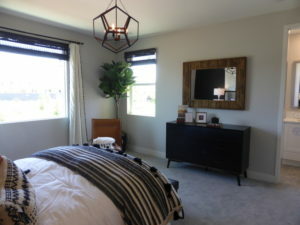 Every wall has windows, so the room gets a lot of light. 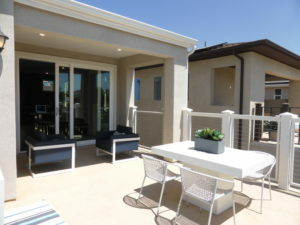 One wall has sliding doors leading to a large, covered deck. 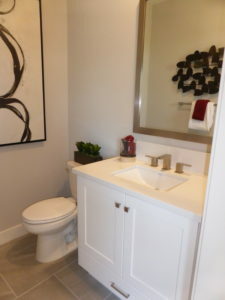 Though the model doesn’t show it, there is an option for a powder room in one corner, which would include a pedestal sink. 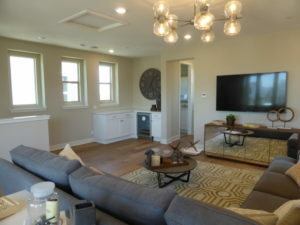 This home has a similar layout to other homes found throughout Cadence Park. 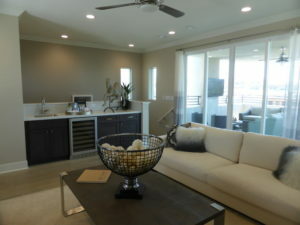 It has a good amount of storage throughout the house. 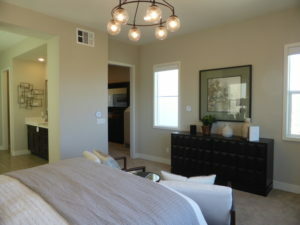 It lacks a downstairs bedroom but has the flexible space in the third-floor bonus room. 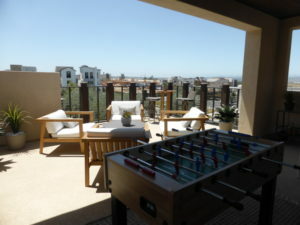 Metropolis is modeled in the Contemporary Spanish elevation, with Mid-Century Modern and Abstract Traditional options also available. 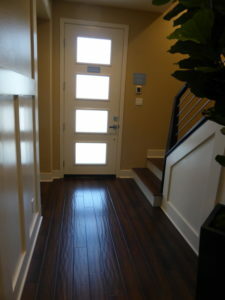 It has several steps leading up to the front door. 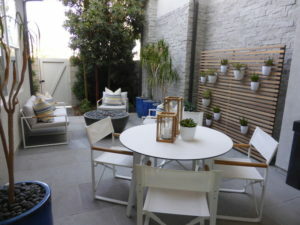 The garage is at the back of the house. 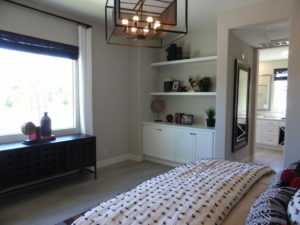 Upgrades found throughout the home include flooring, window and wall treatments, cabinetry, paint, ceiling fans, lighting, and all decorator’s items. 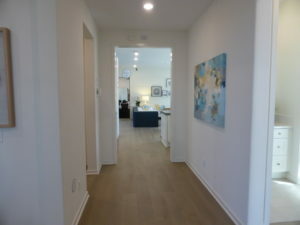 The home has a foyer with upgraded paneled walls. 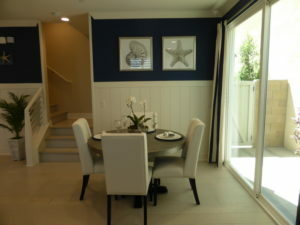 It has space for a narrow table or bench along the stairs on one wall. 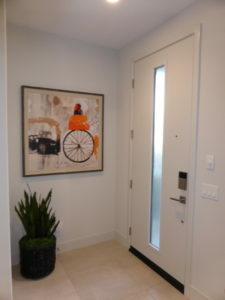 The door to the garage is directly across from the front door. 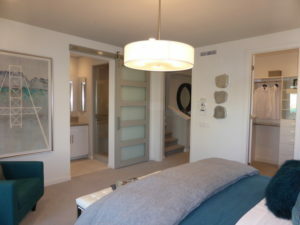 A doorway on the right leads to the ground-floor bedroom suite. 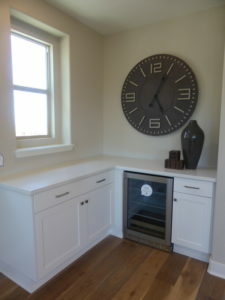 Just inside the doorway, the model shows the optional wine refrigerator and upper cabinets in lieu of the standard base linen cabinets. 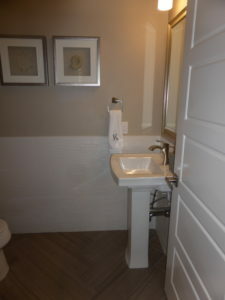 The bathroom is across from the bar. 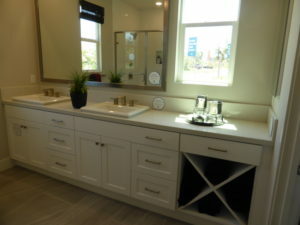 It has a vanity with a single sink and one set of cabinets. 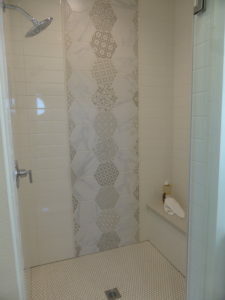 There is a shower with upgraded tile throughout but no seat or shampoo niche. 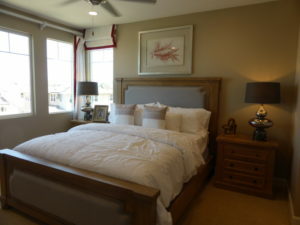 Bedroom 4 is 10’9” x 15’7” and has windows facing the front and side of the house. 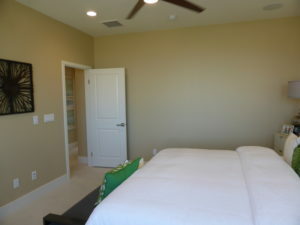 The large room has space for a seating area and a lot of privacy, as it is the only room on the first floor. 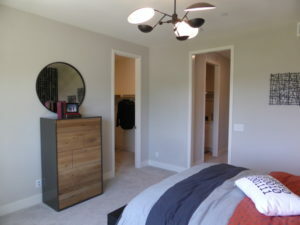 The bypass closet extends the full width of the room, though the doors are standard size. 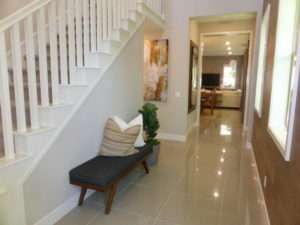 On the second floor, the stairs open into the great room. 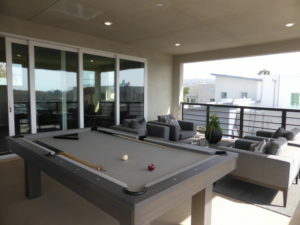 It measures 17’3” x 13’3” so it is much more spacious than in residence 1. 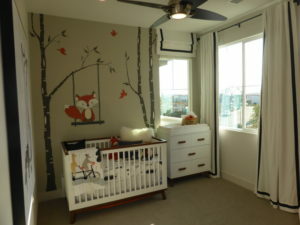 There are two windows facing the side of the house and sliding doors leading to a deck overlooking the street. 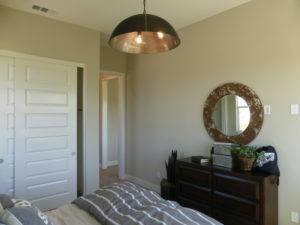 The room has recessed lights and an upgraded ceiling fan. 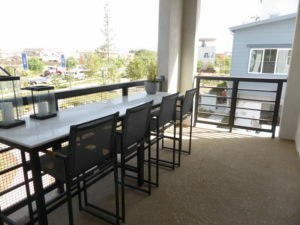 The deck is a good size, with space for a table and chairs and a barbecue. 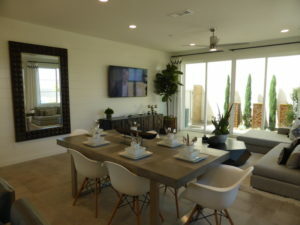 The dining area is behind the great room. 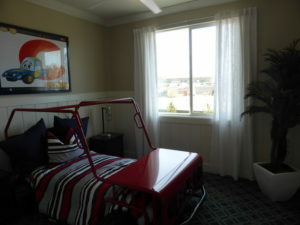 It is 12’8” x 12’2” and can comfortably seat 6 – 8 people. 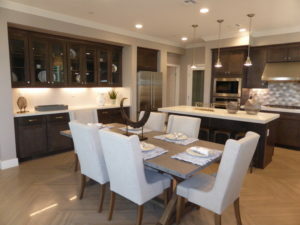 The model shows the optional cabinets extending from the kitchen into the dining room. 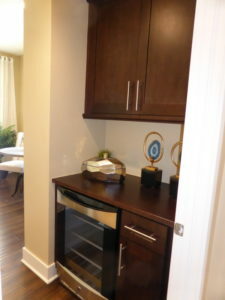 It also includes the optional wine fridge within the extended cabinets. 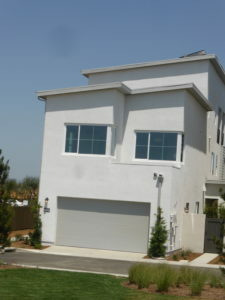 Windows face the back and side of the home. 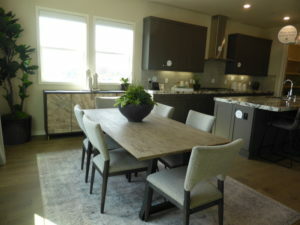 The kitchen is 13’4” x 15’5” and is next to the dining area. 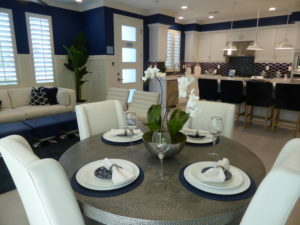 The island can seat 4 – 5 people and is shown with an upgraded waterfall side. 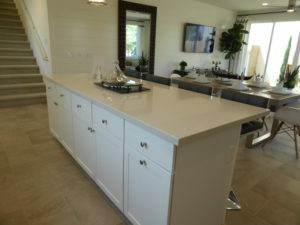 The other side of the island includes cabinets and drawers. 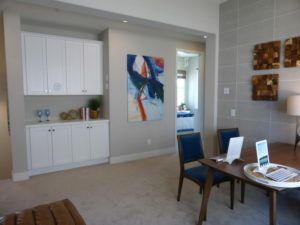 One wall has a narrow pantry, refrigerator, built-in oven and microwave, and the cooktop. 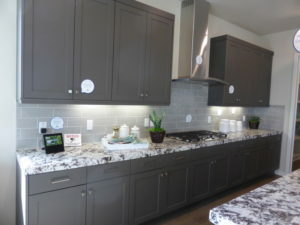 The other wall has the sink and dishwasher. 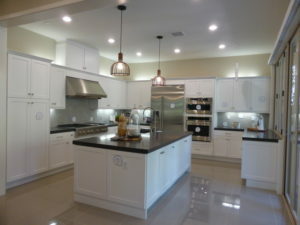 Overall, this kitchen has more cabinets than in residence 1 but the pantry is a lot smaller. 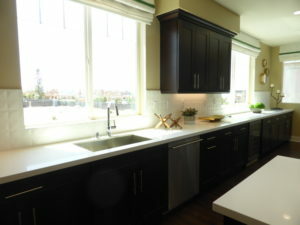 A big window above the sink lets in a lot of light. 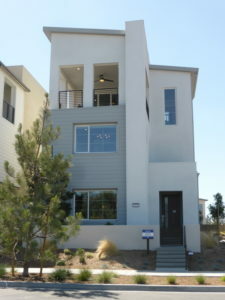 The stairs are tucked into the corner of the second story. 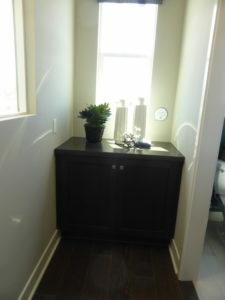 At the bottom of the stairs, I found a powder room and storage closet. 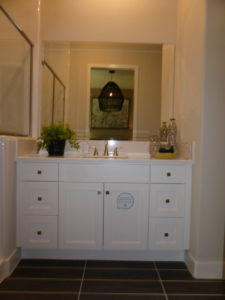 The powder room has the standard pedestal sink but the mirror and walls are upgraded. 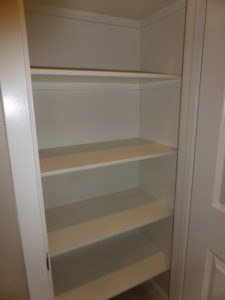 The closet is a good size and includes shelving on two walls. 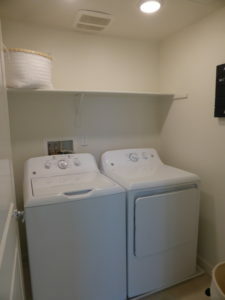 The laundry room is at the top of the stairs on the third floor. 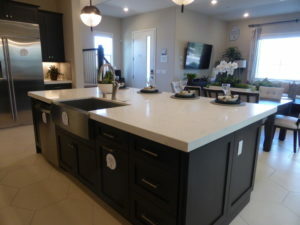 It has side-by-side machines on one side and an optional sink on the other. 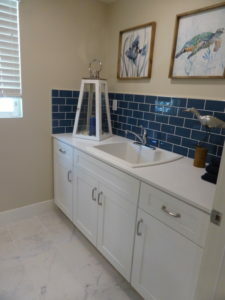 The sink has base cabinets but no counter. 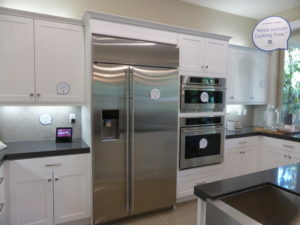 The room has a shelf above the machines but no upper cabinets. 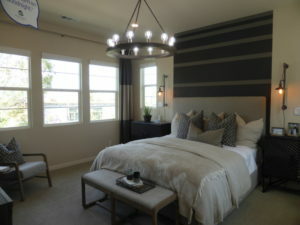 The master suite is at the front of the house. 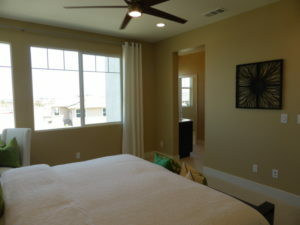 The bedroom is 12’11” x 14’10” and has windows facing the front and side of the house. 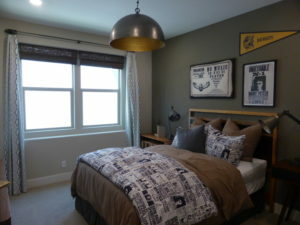 The room includes recessed lights and has an upgraded ceiling fan. 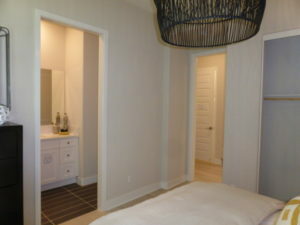 The master bathroom is through an open doorway. 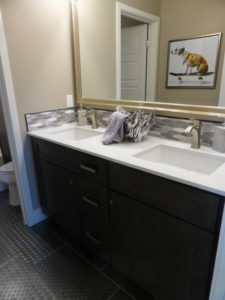 The vanity has two sinks, two sets of cabinets, and three drawers. 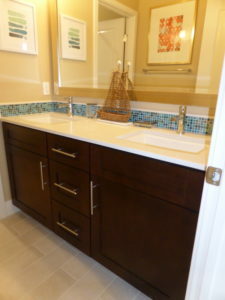 It has a shorter counter than in many other master bathrooms. 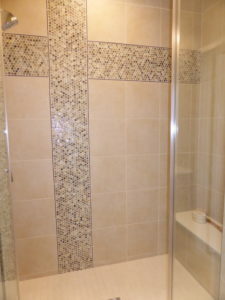 The shower is also on the smaller side, with a full bench and upgraded tile. 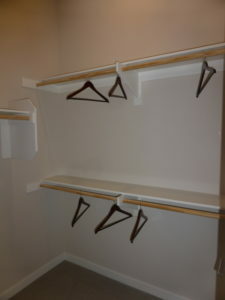 The walk-in closet is shown with the standard shelves and poles. 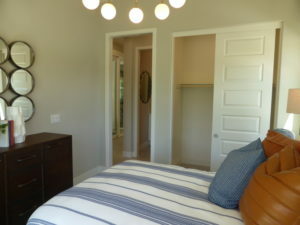 Bedroom 2 is the smallest secondary room. 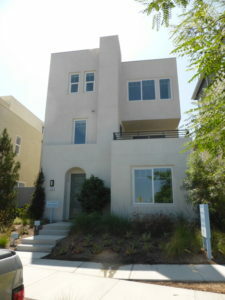 It is 10’5” x 10’11” and has windows facing the back and side of the house. 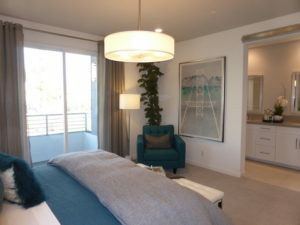 The large windows and standard bypass closet don’t leave a lot of options for arranging the furniture. 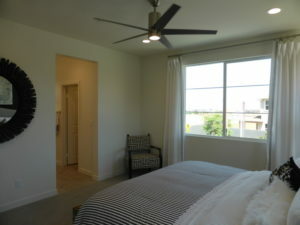 The room is shown with an upgraded ceiling fan. 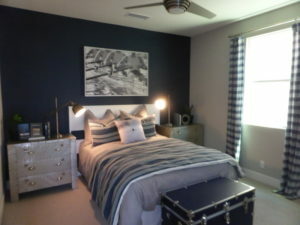 Bedroom 3 is next to bedroom 2. 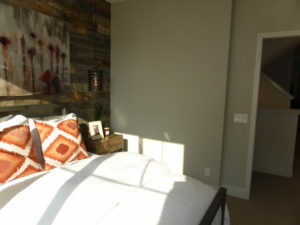 It is slightly larger, measuring 10’7” x 10’11” and has windows facing the back and side. 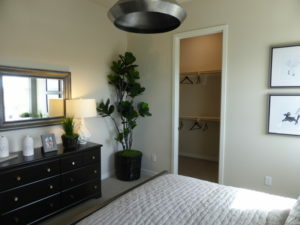 The closet is also a little bigger in this room than in bedroom 2. 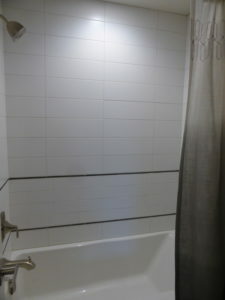 Both secondary rooms share a bathroom in the hallway. 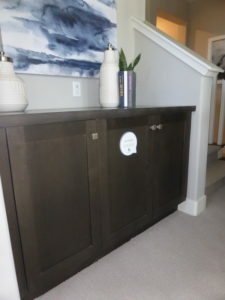 It has a set of base linen cabinets just outside it with an option for upper cabinets. 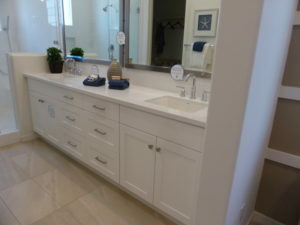 The vanity has two sinks, two cabinets, and three drawers. 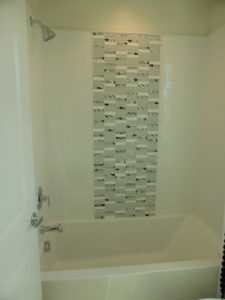 The backsplash is upgraded, as is the tile in the shower/tub combo. 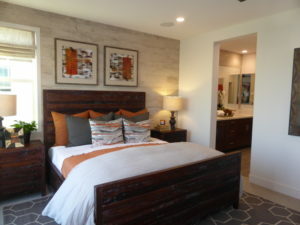 This home lacks a bonus room and has smaller bedrooms than we saw in residence 1. 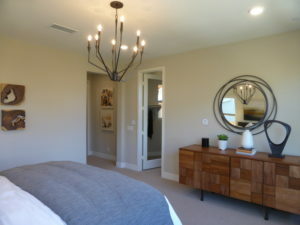 I do like the layout of the common areas more and I think the large bedroom on the first-floor will make it a popular model. 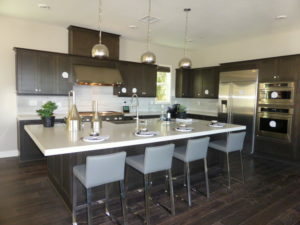 The price on this home is also more reasonable than a lot of the other homes in Cadence Park. 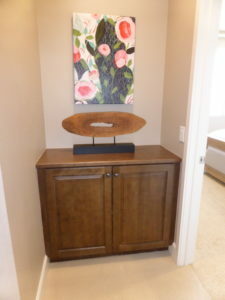 Bellerose is modeled in the Abstract Traditional elevation. 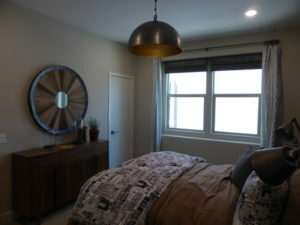 Upgrades found throughout the home include flooring, window and wall treatments, cabinetry, paint, ceiling fans, lighting, and all decorator’s items. 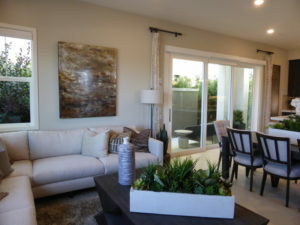 The home doesn’t have a foyer or entry area of any kind. 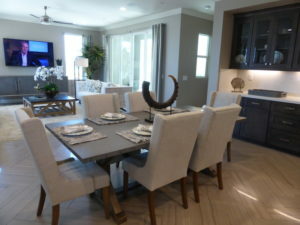 When you go inside, the kitchen is immediately on the left and the great room and dining area are on the right. 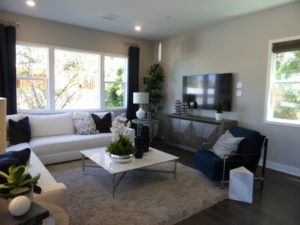 There isn’t any space for an entry console. 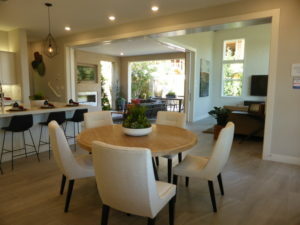 The great room and dining room are combined in a 17’ x 18’8” space. 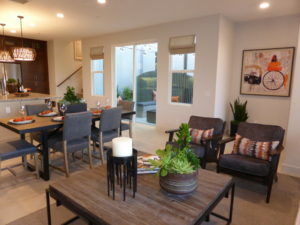 The model shows the great room at the front of the house, with several windows facing the street and another on the side. 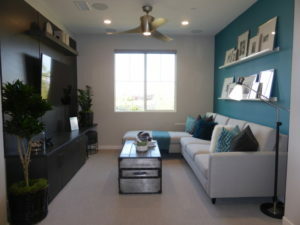 The sitting area doesn’t have much space and has just one small wall for mounting a TV. 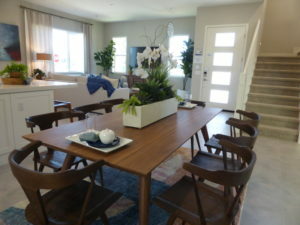 The dining area behind the great room can only comfortably seat 4 – 6 people. 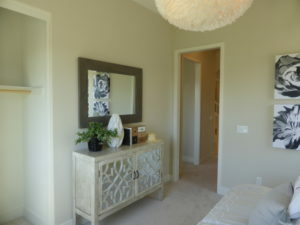 One wall could hold a china hutch, but anything too large would make the room feel very cramped. 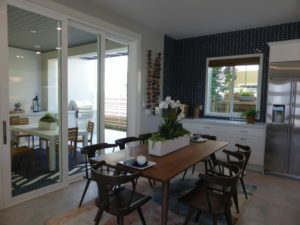 The dining area has sliding doors leading to a courtyard on the side of the home. 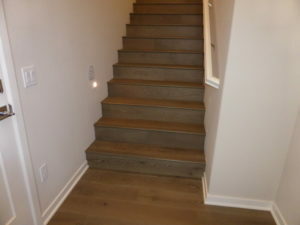 The staircase is also as the back of the room. 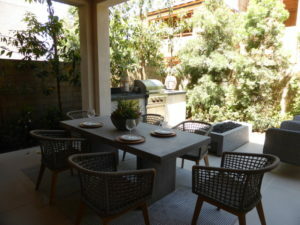 The courtyard is smaller than in residence 1 but could still hold a grill and small table. 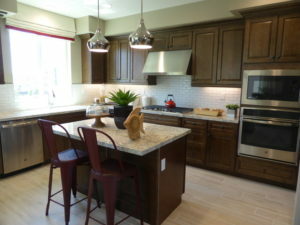 The kitchen is 9’ x 16’10” with a center island that can seat up to four people. 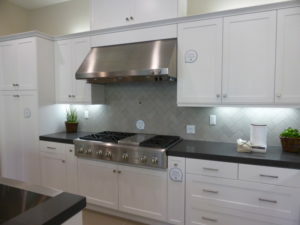 The sink and dishwasher are on one wall and the stove, microwave, oven, and fridge are on another. 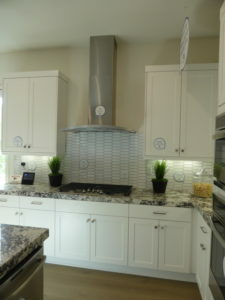 One small window above the sink overlooks the front walk. 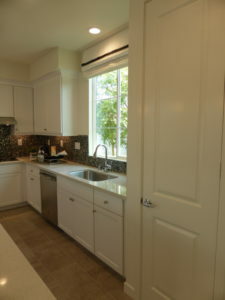 A nook in the back corner of the kitchen holds a pantry, storage closet, and access to the garage. 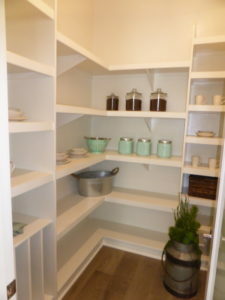 The pantry includes shelves on one wall and the closet has some storage under the stairs. 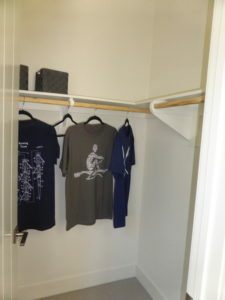 The setup in the nook is cramped, so only one door can be open at a time. 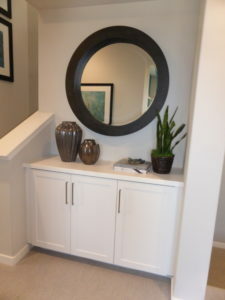 The powder room is off the first landing of the staircase. 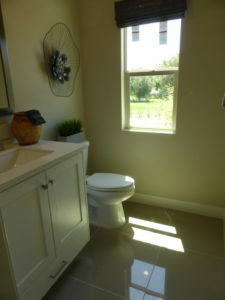 It has a pedestal sink and a window facing the courtyard. 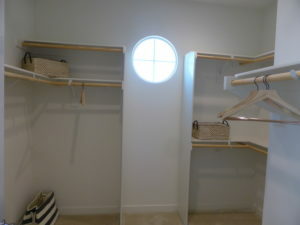 The second floor has a linen closet with built-in shelves at the top of the stairs. 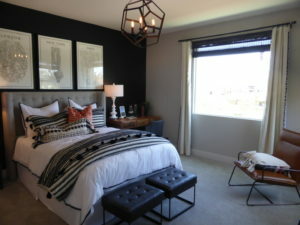 The master suite is at the front of the house. 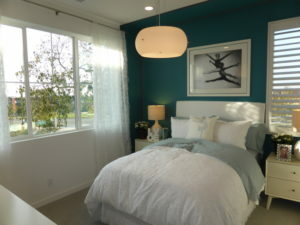 The bedroom is 13’7” x 13’ and has windows facing the front and side of the home. 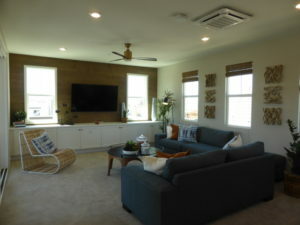 The model shows an upgraded ceiling fan and wall paneling, along with recessed lights. 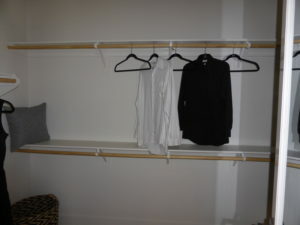 The walk-in closet is in a corner of the bedroom and has shelves on three walls. 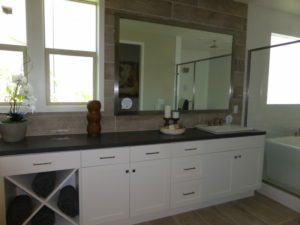 The master bathroom has a smaller vanity like the one in residence 2. 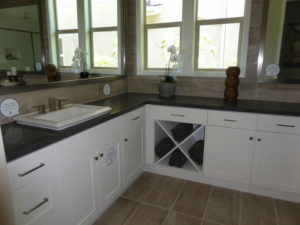 There are two sinks, two sets of cabinets, and three narrow drawers. 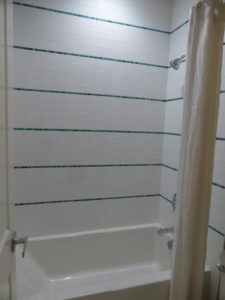 The shower is long and narrow, with a bench at the far end. 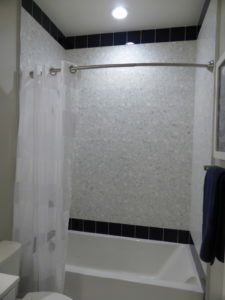 The showerhead sits on one of the longer walls, which makes it feel smaller inside. 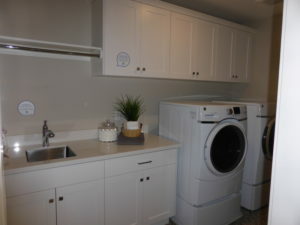 The laundry room is a good size. 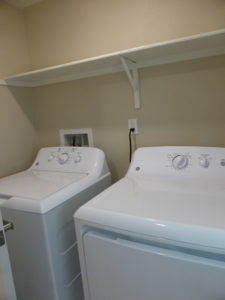 One side has side-by-side machines with a shelf above them. 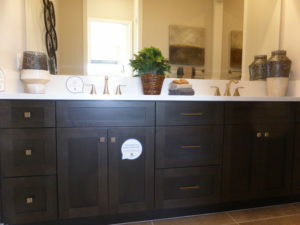 The other shows the optional sink, with four base cabinets and two drawers. 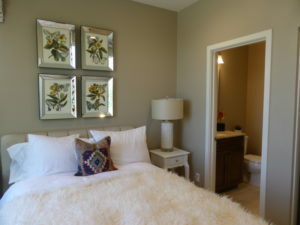 The secondary bathroom and bedrooms are at the back of the house. 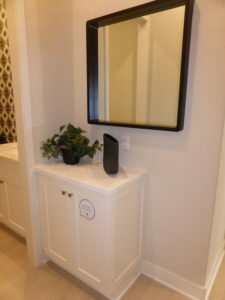 There is a single base cabinet just outside the bathroom. 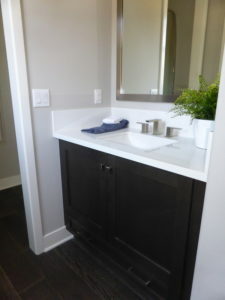 Inside, the vanity has one set of cabinets, three drawers, and one sink. 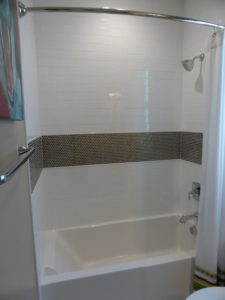 The shower/tub combo is shown with upgraded tile. 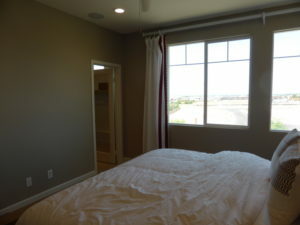 Bedroom 3 is 11’2” x 10’11” and has a single window facing the back of the house. 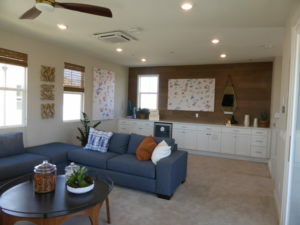 The model shows upgraded carpet, wall paneling, and a ceiling fan. 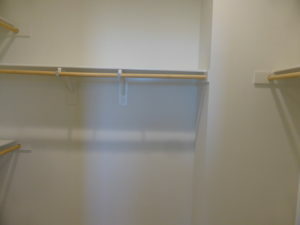 The room has a standard bypass closet. 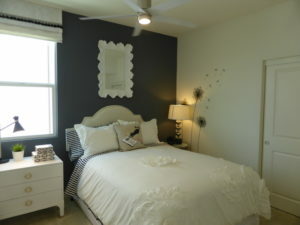 Bedroom 2 is next to bedroom 3. 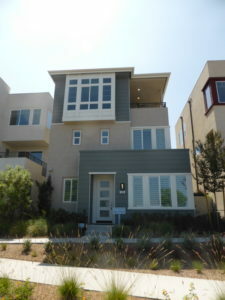 It is 10’11” x 10’11” and has windows at the back and side of the home. 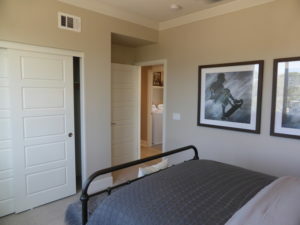 This room also has a bypass closet. 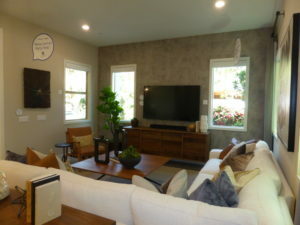 The Bellerose home has a third-story bonus room like we saw in residence 1. 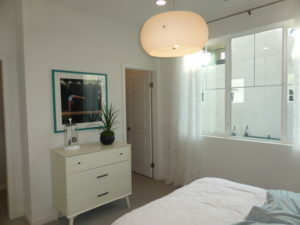 The room is 12’8” x 16’10” and has windows on every wall to let in a lot of light. 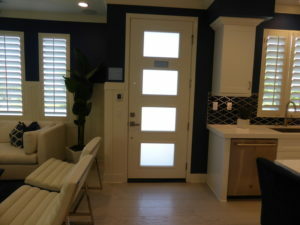 This room does not have an option for a powder room. 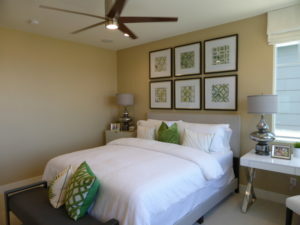 The model shows an upgraded ceiling fan and wall paneling. 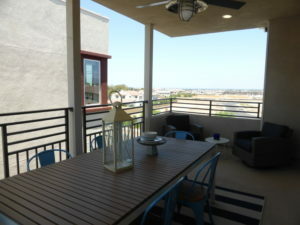 The large deck runs the full length of the room but mostly has a view of the house next door. 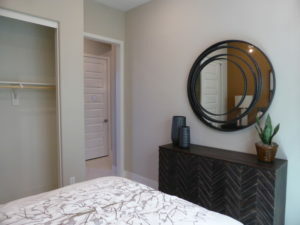 For a smaller home, Bellerose has a good amount of storage. 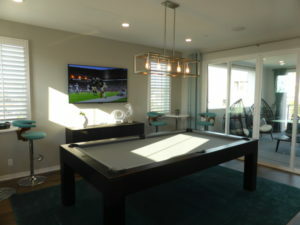 The bonus room is a great addition to the house and makes it feel a lot bigger. 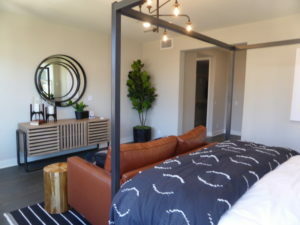 Baron is the second smallest home in Deco. 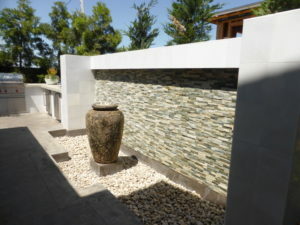 It is modeled in the Contemporary Spanish elevation, which looks quite similar to the Mid-Century Modern and Abstract Traditional elevations. 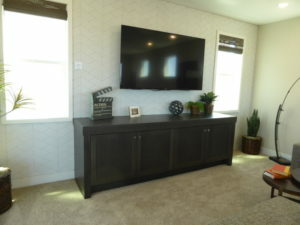 Upgrades found throughout the home include flooring, window and wall treatments, cabinetry, paint, ceiling fans, lighting, and all decorator’s items. 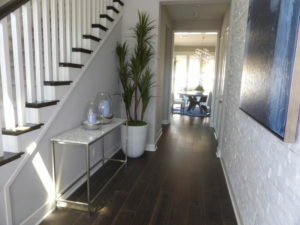 Inside, the home has a foyer with space for a console along the stairs. 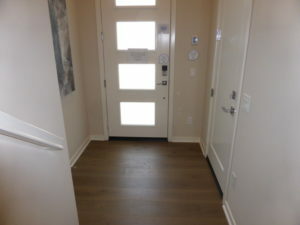 The door to the garage is directly across from the front door. 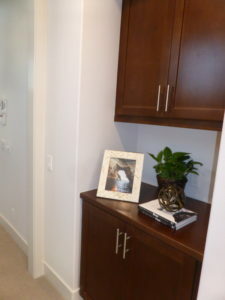 There are base linen cabinets next to the garage door with an option for upper cabinets, too. 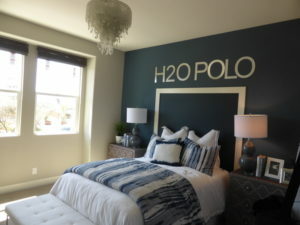 This creates a nice drop zone not seen in any other Deco home. 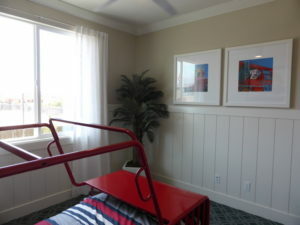 As in residence 2, this house has a bedroom on the first floor. 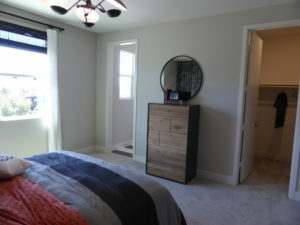 The room is a lot smaller, measuring only 10’5” x 9’11” but it still has a lot of privacy. 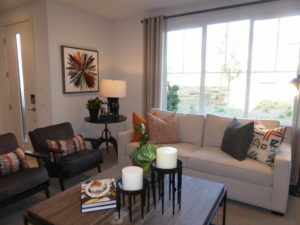 Windows face the front and side of the home. 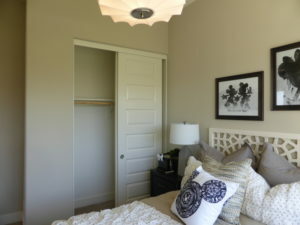 There is a standard bypass closet, but the door to the bedroom must be shut to fully access it. 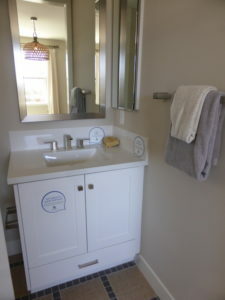 The en-suite bathroom has a vanity with a single sink and one set of cabinets. 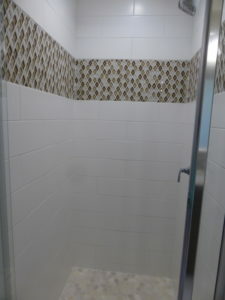 The shower is a smaller stall with no seat or shampoo niche and modeled with upgraded tile. 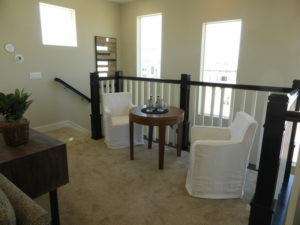 There is a powder room off the top landing of the staircase, just a couple steps below the great room. 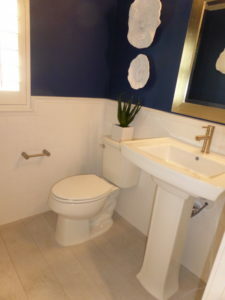 It has a pedestal sink and upgraded wall paneling. 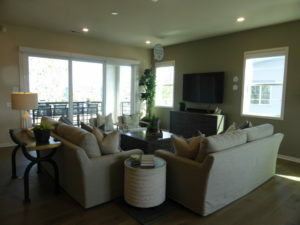 The great room is 12’5” x 14’0 with one long, high window facing the side of the house and bigger windows facing the deck at the front of the house. 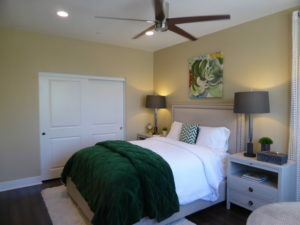 The room has included recessed lights and an upgraded ceiling fan. 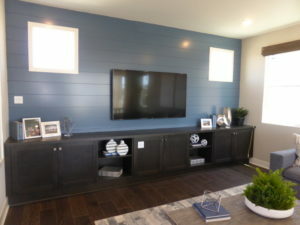 The space next to the stairs works well for a wall-mounted TV but wouldn’t fit an entertainment unit. 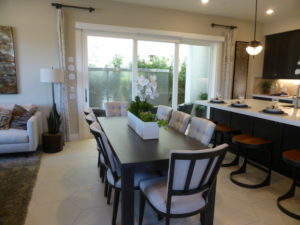 The dining area is behind the great room and is more defined than in some of the other Deco models. 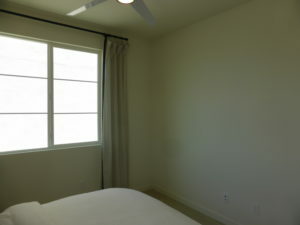 It is 11’6” x 13’6: and has windows facing the back and side of the home. 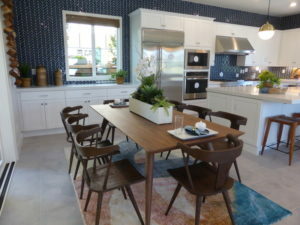 It can comfortably seat 6 – 8 people and is shown with the optional cabinets extended from the kitchen. 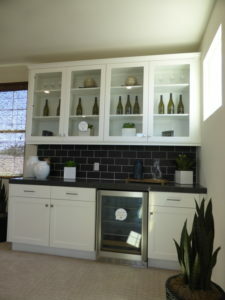 This one does not have an option for a wine fridge. 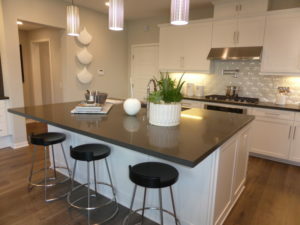 The kitchen is smaller than in other Deco homes. 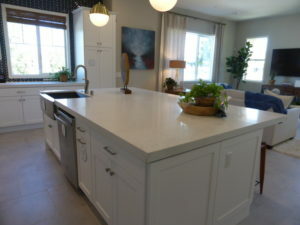 It measures just 8’6” x 13’6” and the island can only seat two people. 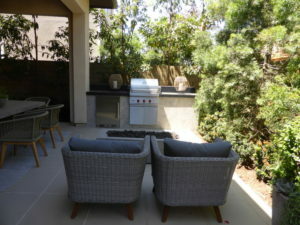 The dishwasher and sink sit beneath a window at the back of the house. 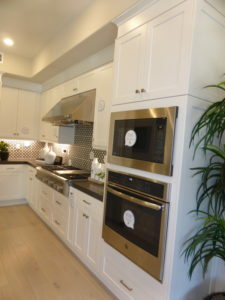 The cooktop, oven, and microwave sit on the second wall and the fridge and pantry-height cupboards are on the third. 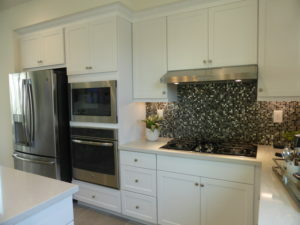 The cabinets and backsplash are upgraded. 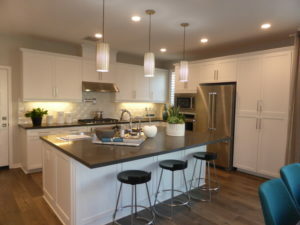 For a smaller room, the kitchen makes good use of the space. 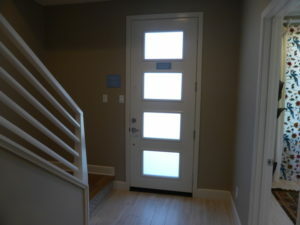 The deck is accessed from a single French door near the base of the stairs to the third floor. 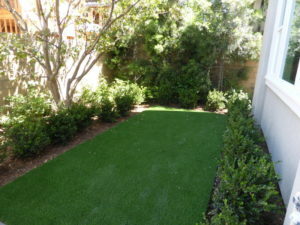 It is a good size and has both covered and uncovered areas. 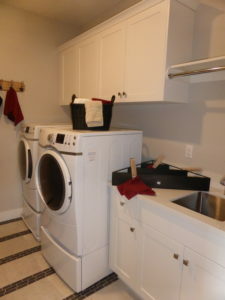 The laundry room is at the top of the stairs on the third floor. 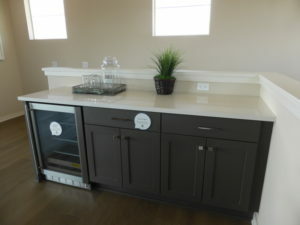 It has side-by-side machines with a shelf above them and an optional sink and cabinets. 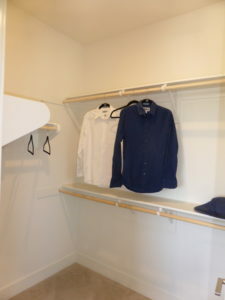 There is a linen closet with built-in shelves outside the room. 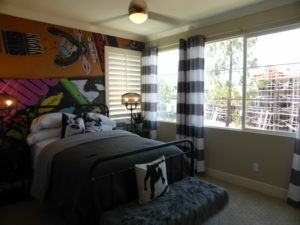 Bedroom 2 is at the back of the house. 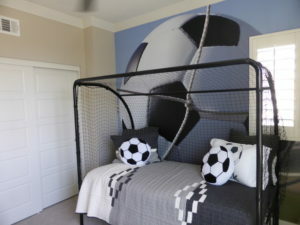 Because it’s the only secondary bedroom on the floor, it measures a spacious 12’2” x 11’10” and has windows on two walls. 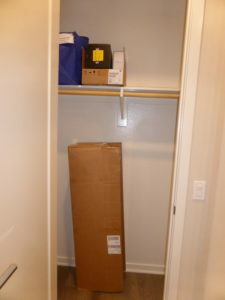 There is a small bypass closet in one corner. 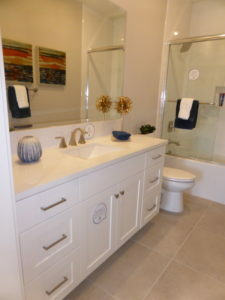 The en-suite bathroom includes a single sink with two cabinets, three big drawers, and a good amount of counter space. 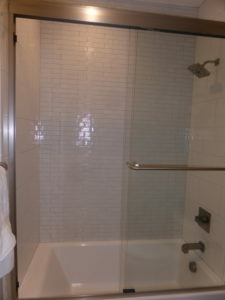 The shower/tub combo has upgraded tile. 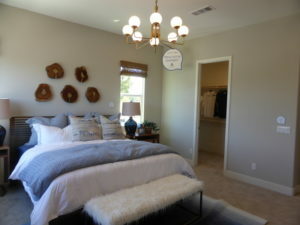 The master suite is at the front of the house. 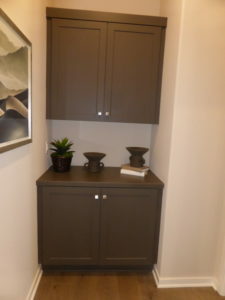 There are base linen cabinets just outside it with an option to add uppers. 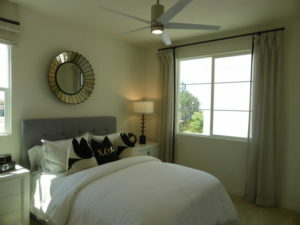 The bedroom is 11’11” x 13’7” and has windows facing the front and side of the home. 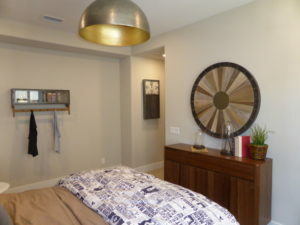 The model shows an upgraded ceiling fan. 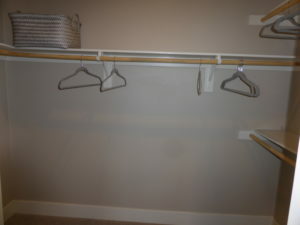 The walk-in closet is in a front corner of the room and is a small, L-shape with a few shelves and poles. 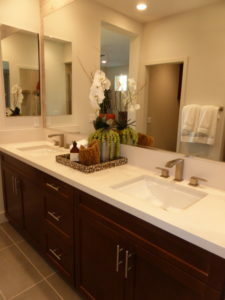 The master bathroom has two sinks set into a shared vanity, with two sets of cabinets and three drawers. 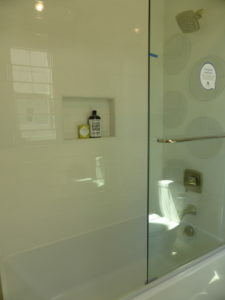 The shower is a good size and includes a full bench. 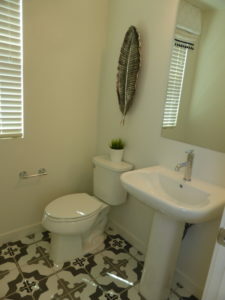 The model shows upgraded tile throughout the bathroom. 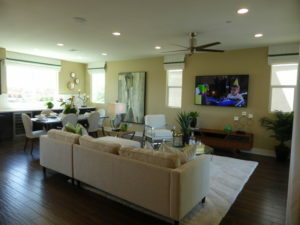 Although the home lacks a bonus room, it does have bigger common areas and a big secondary room on the top floor. 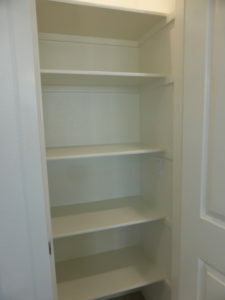 There are numerous linen cabinets and closets throughout the house but no true hall closets anywhere. 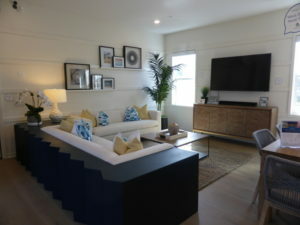 Bambino is the smallest Deco home and they did not build a model for it. 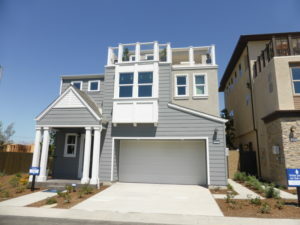 The house has the same elevation options as the other homes. 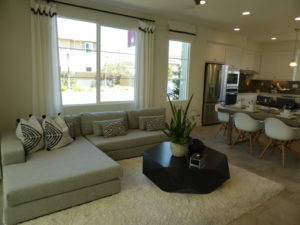 The floorplan is quite similar to the Baron model. 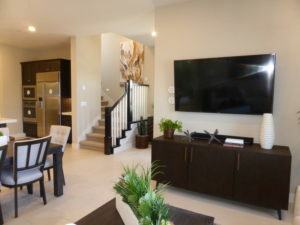 Inside, the first floor has a foyer, with space for a console on the left side along the stairs. 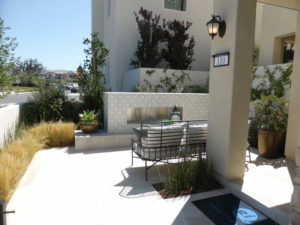 Access to the garage is directly across from the front door. 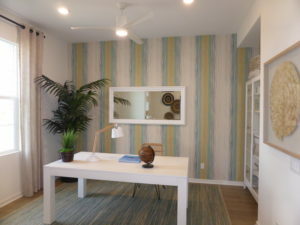 There is a home office on the first floor. 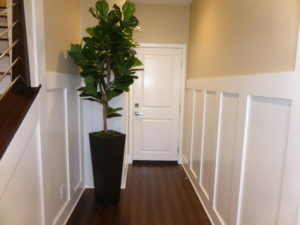 It is 10’3” x 9’11” and is fully open to the foyer. 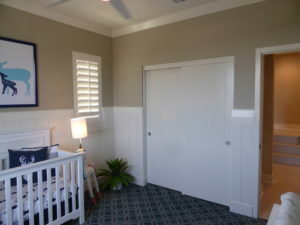 Because it’s the only room downstairs, it would still have privacy and be pretty quiet. 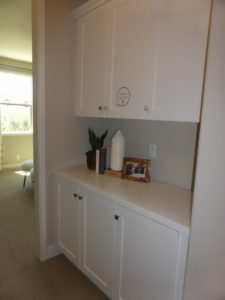 There are base linen cabinets in a corner of the room and an option for uppers. 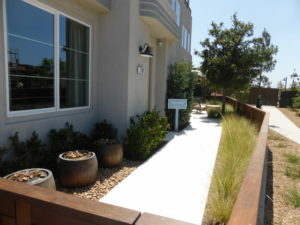 There is a single window facing the street. 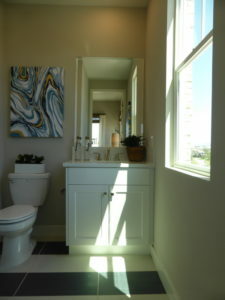 The powder room is on a landing near the top of the stairs. 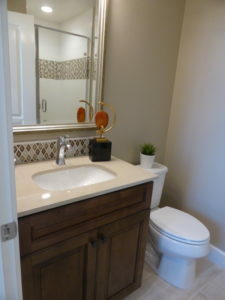 It has a pedestal sink. 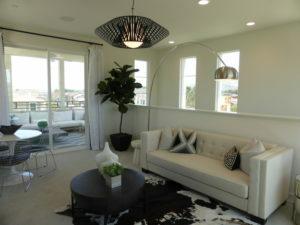 The great room is at the top of the stairs. 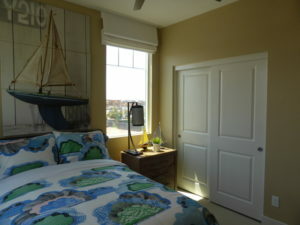 It is 12’5” x 14’ and has a window facing the side of the home and another facing the front deck. 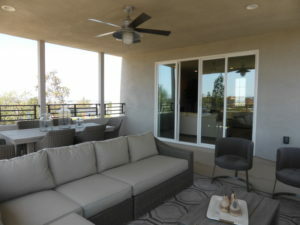 Like in residence 4, the deck is accessed from a single French door. 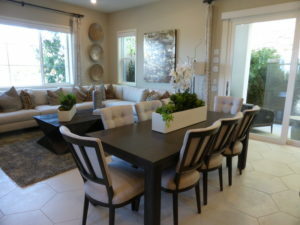 The dining area is behind the great room. 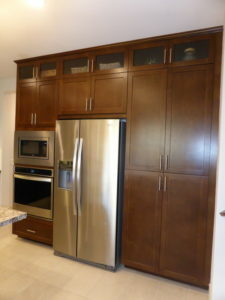 It is 11’6” x 13’6” and has an option for extended kitchen cabinets. 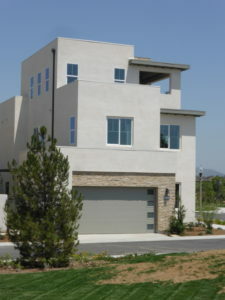 Windows face the back and side of the home. 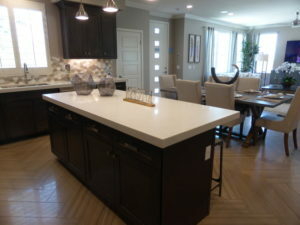 The kitchen is next to the dining room. 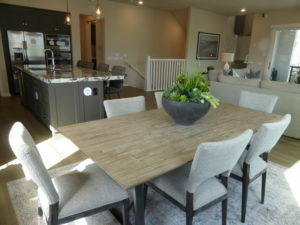 It is 8’6” x 13’6” with a small island that can probably seat two people. 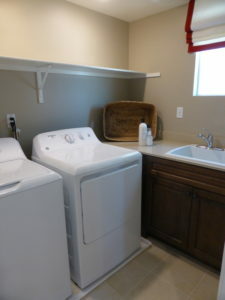 The sink and dishwasher sit beneath a window at the back of the house. 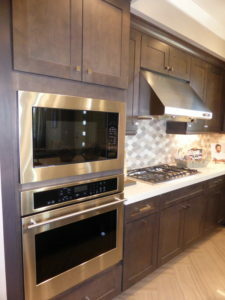 The longer wall on the side holds the cooktop, oven, and microwave. 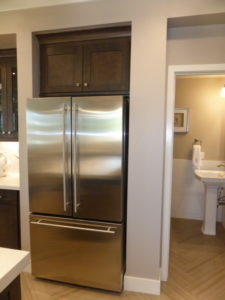 The shorter wall toward the front of the kitchen has the fridge and pantry. 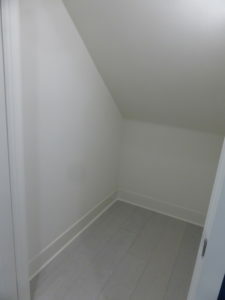 The third floor has a laundry room at the top of the stairs. 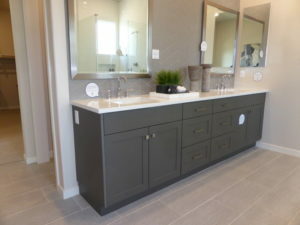 It has side-by-side machines and an option for a sink with base cabinets. 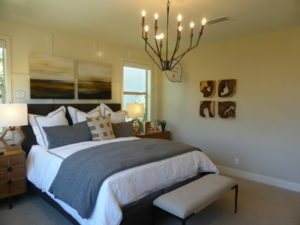 The master suite is at the front of the house. 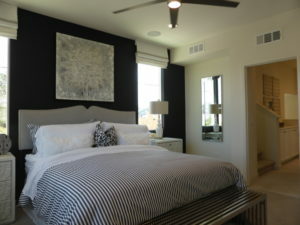 The bedroom is 11’11” x 13’7” and has windows facing the front and side. 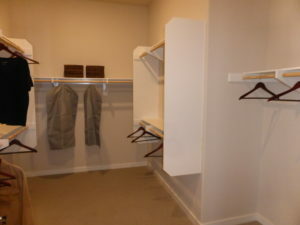 The walk-in closet is in the front corner and is laid out the same as in Baron. 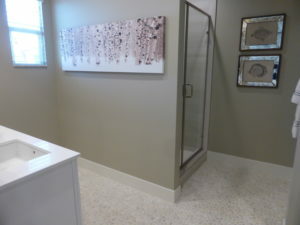 The master bath has dual sinks set into a shared vanity and a stall shower with a seat. 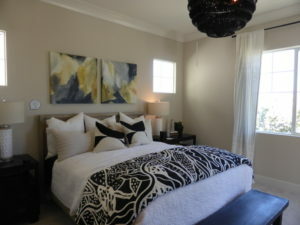 Bedroom 2 is at the back of the house. 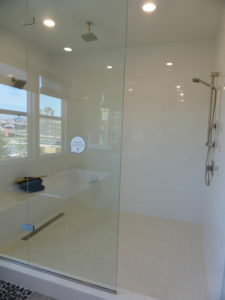 It is 12’2” x 11’10” with windows facing the back and side. 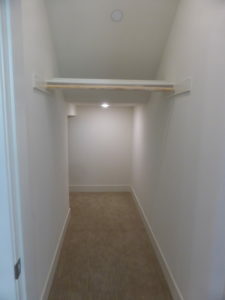 The bypass closet is small. 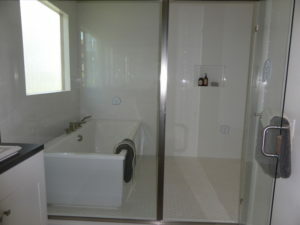 The en-suite bathroom includes a single sink and a shower/tub combo. 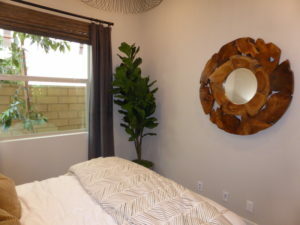 The key difference between Baron and Bambino is that Baron has a bedroom suite on the first floor and Bambino has an office without a bathroom. 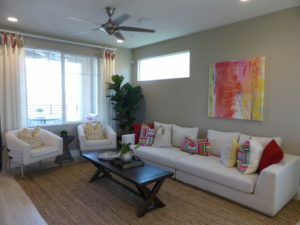 The homes are otherwise mirror images of each other. 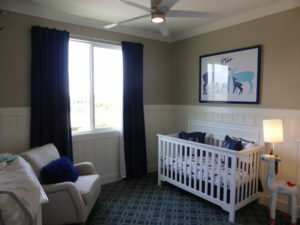 Waverly is the largest home in the Deco collection. 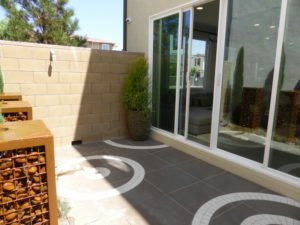 It has a large, gated patio at the front of the house. 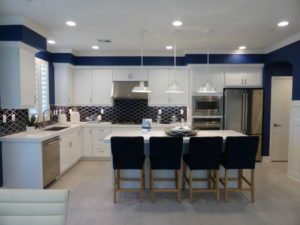 Upgrades found throughout the home include flooring, window and wall treatments, cabinetry, paint, ceiling fans, lighting, and all decorator’s items. 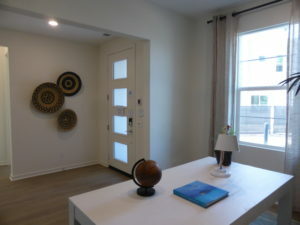 Inside, the house lacks a foyer but could have a very small table on one side of the door. 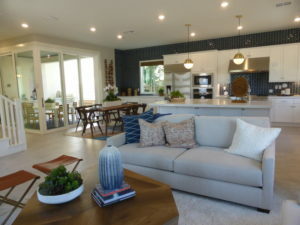 The great room is on the left and the dining area on the right when you enter the house. 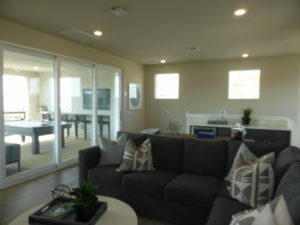 The great room is 16’8” x 14’5” and has windows facing the front and side of the home. 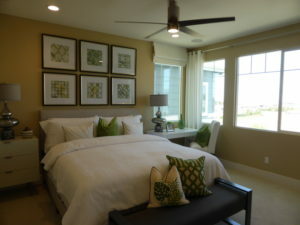 The model shows an upgraded ceiling fan and the included recessed lights. 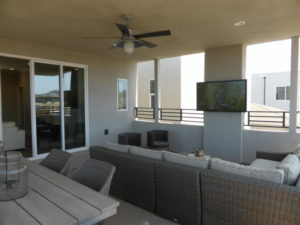 The back wall has sliding doors leading to a covered patio, modeled with the upgraded center-meet sliders. 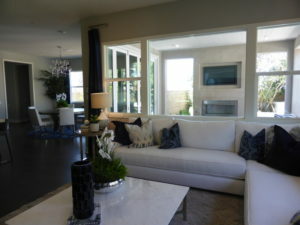 The great room is spacious and has more flexibility with the layout than the other Deco homes. 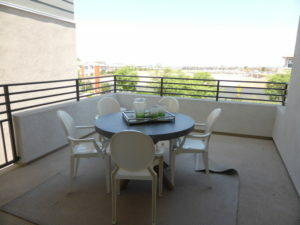 The back patio is small but has space for a table and a grill. 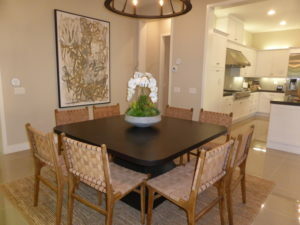 The dining area is 18’2” x 9’2 and can easily fit a large table. 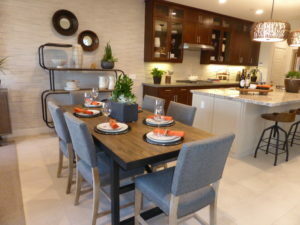 The model shows the optional upper and lower cabinets at the back side of the dining area. 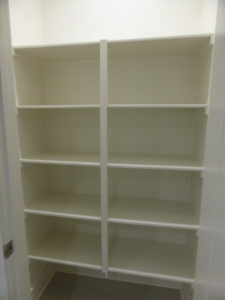 Without these, there would be plenty of space for a freestanding hutch. 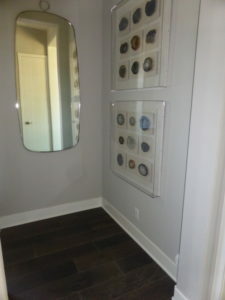 The glass-fronted uppers create a nice display area. 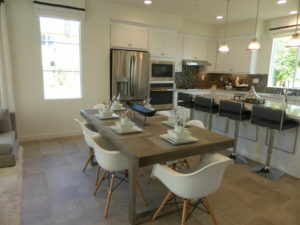 The kitchen is next to the dining area. 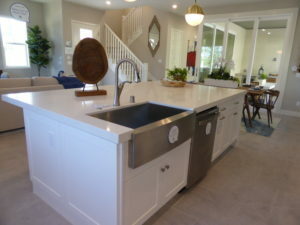 It has an island that can seat up to four people with cabinets and drawers on the other side. 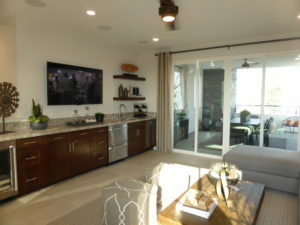 One wall has the fridge, another has the oven, microwave, and cooktop, and the third wall has the sink and dishwasher. 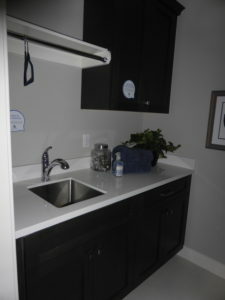 There is a window above the sink. 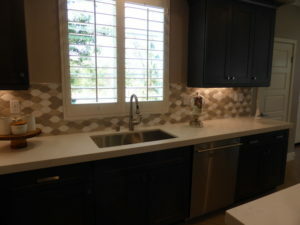 The backsplash and cabinets are upgraded. 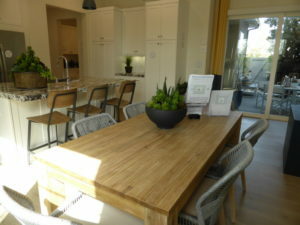 There is a pantry next to the front door, making it more in the dining area than the kitchen itself. 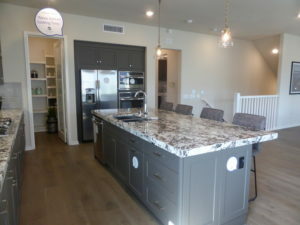 Access to the two-car garage is in the back corner of the kitchen. 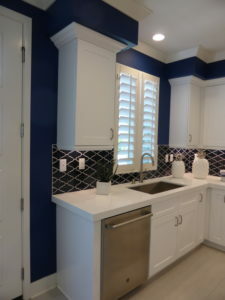 The powder room is right between the refrigerator and the oven. 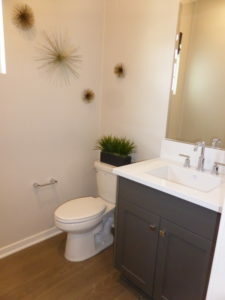 I really hate having a bathroom directly off the kitchen and don’t know why the architects put it there. 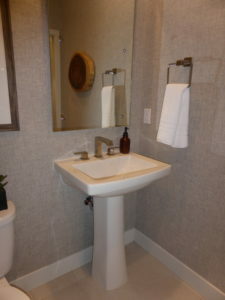 This bathroom has a pedestal sink and has upgraded wall décor. 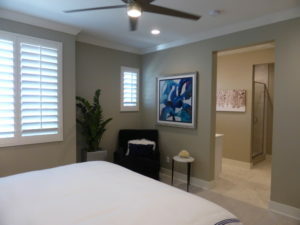 There are three secondary rooms on the second floor of the house. 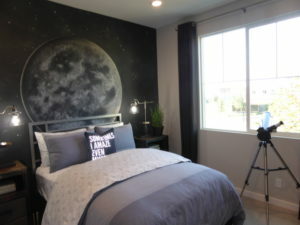 Bedroom 4 is 10’8” x 11’9” and has more privacy than the others because it doesn’t share walls with another bedroom. 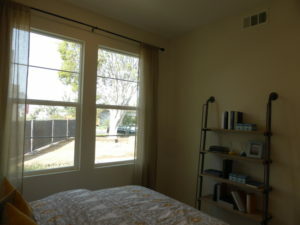 There is a big window facing the side of the house and a bypass closet. 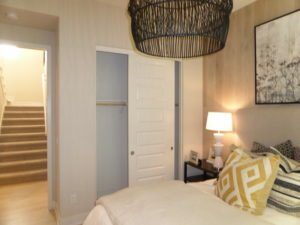 All three bedrooms share a bathroom in the hallway. 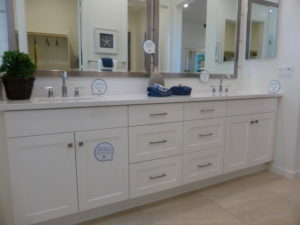 The vanity has two sinks with two large cabinets and three drawers. 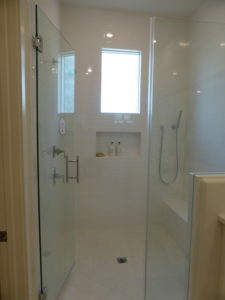 The shower/tub combo is through a separate door and has upgraded tile. 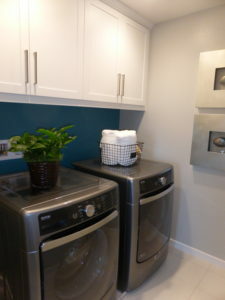 The laundry room is across from the bathroom. 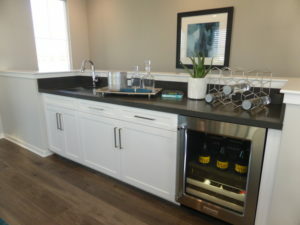 It has side-by-side machines with a shelf above them and no option for a sink. 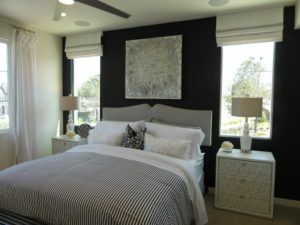 Bedroom 2 is 11’1” x 11’10” with windows facing the back and side of the house. 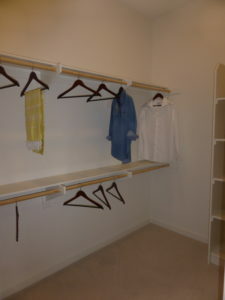 It is the biggest of the secondary rooms and its closet is slightly bigger, too. 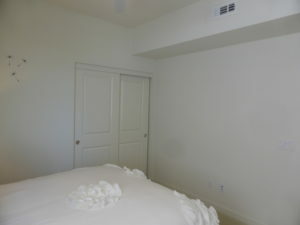 Bedroom 3 is 10’6” x 10’11” and is the smallest room in the house. 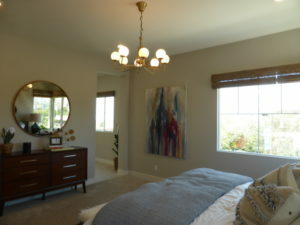 It has a big window facing the back of the home and a small bypass closet. 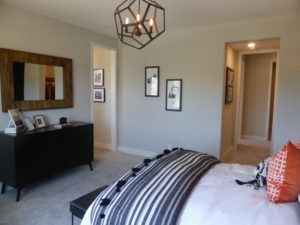 A long hallway leads to the master suite at the front of the house. 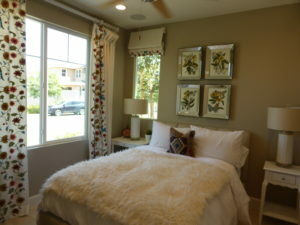 The bedroom is 15’4” x 13’2” and has windows facing the front and side of the home. 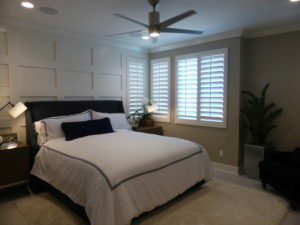 The model shows an upgraded ceiling fan and wall paneling. 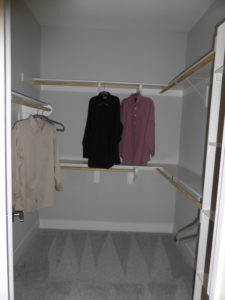 The walk-in closet is off the bedroom and has shelves on three walls. 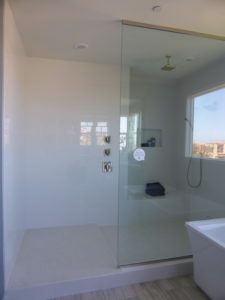 The master bathroom is through an open doorway. 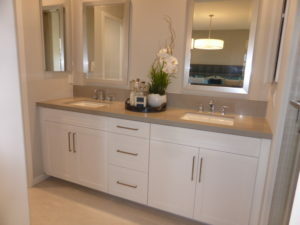 The sinks are in a shared vanity much like the one in the secondary bathroom. 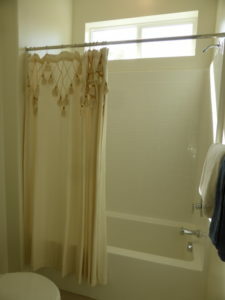 The shower has a full bench but no shampoo niche. 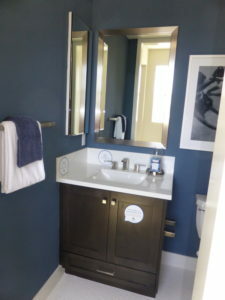 Overall, this bathroom is smaller than in some of the Deco homes. 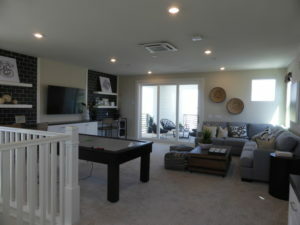 The third floor has an 18’2” x 17’9” bonus room. 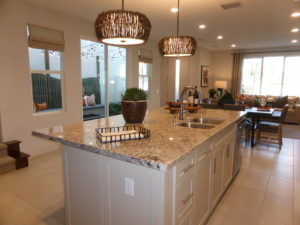 This large space has windows on every wall and is shown with the optional cabinets and wet bar. 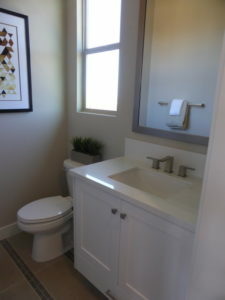 The model also includes the optional powder room with a pedestal sink. 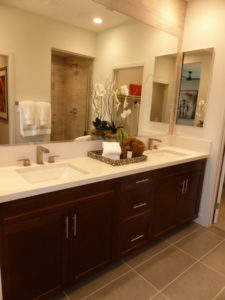 Including the bathroom shortens the space for the cabinets and wet bar in the room. 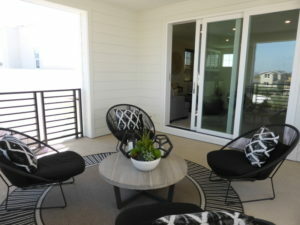 Sliding doors lead to the huge covered deck, which takes up more space than the room itself. 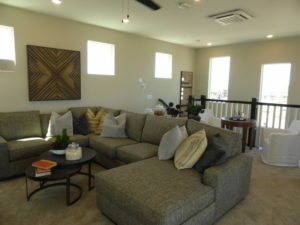 Waverly is a spacious home with big common rooms. 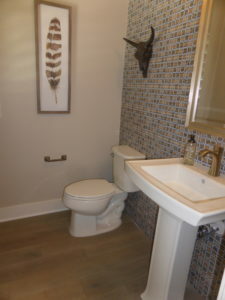 I really dislike the location of the powder room on the first floor and the lack of a hall closet downstairs, but think it is laid out well otherwise. 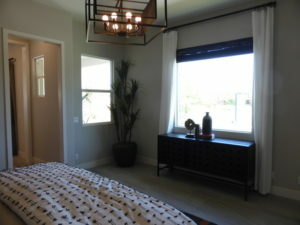 Every Deco home has either a private room on the first floor or a bonus room on the third floor. 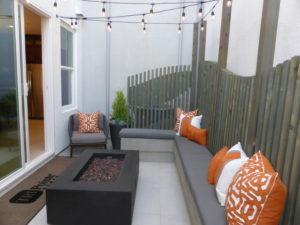 All homes have a small patio at the back but no real yard. 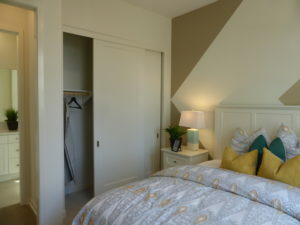 Most have a fair amount of storage but smaller closets in the bedrooms. 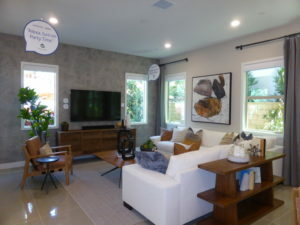 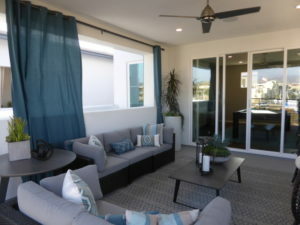 The prices seem a lot more reasonable than the Lennar homes, but that is partly attributed to Lennar’s “Everything’s Included” policy that puts nicer features in their base models. 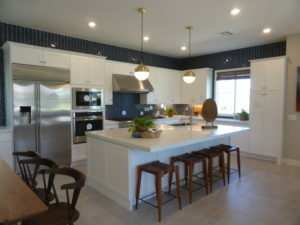 This entry was posted in New Homes on September 20, 2018 by Karen. 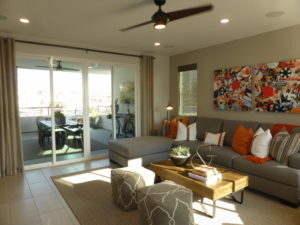 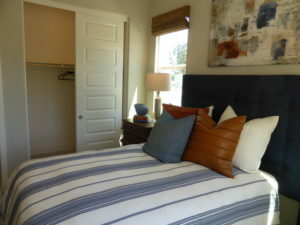 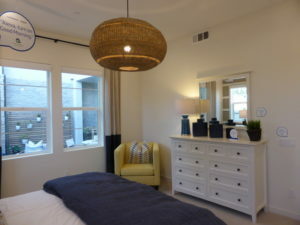 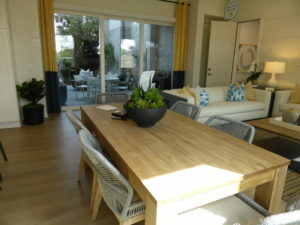 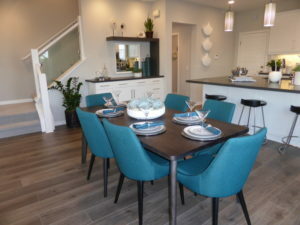 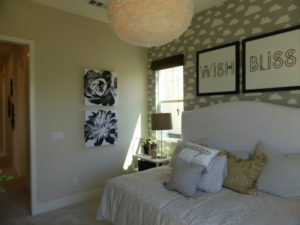 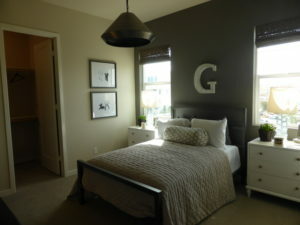 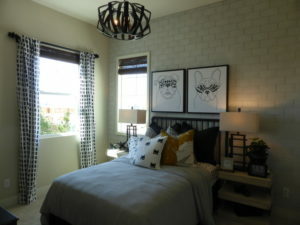 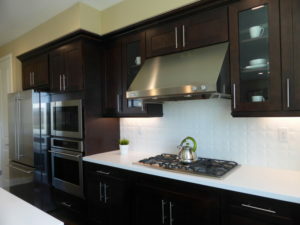 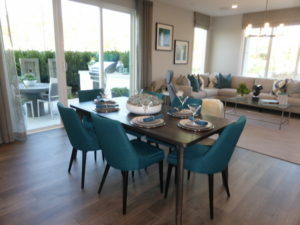 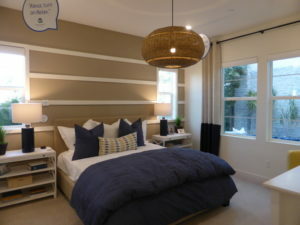 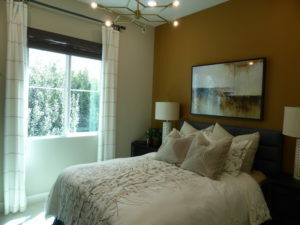 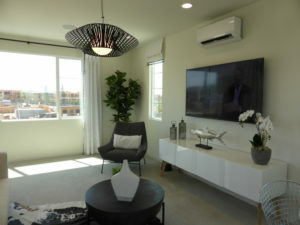 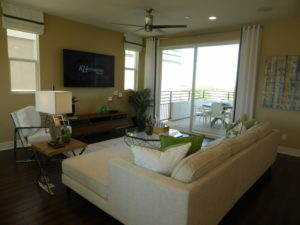 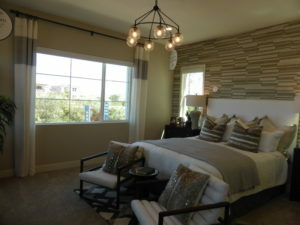 I recently visited the Encore collection in Cadence Park. 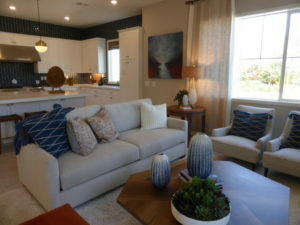 Built by Lennar, Encore will have 106 detached homes with three different floorplans. 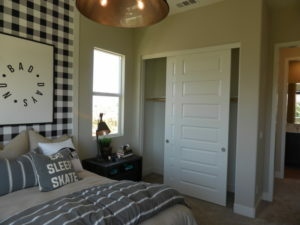 The homes are located in the southwest corner of Cadence Park and will be within walking distance to the new K-8 school and the neighborhood parks. 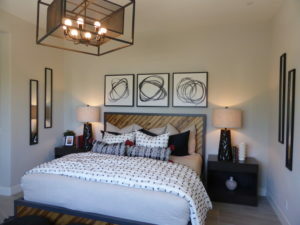 Encore homes range from 2,826 – 3,16 square feet, with 4 bedrooms and 3 – 4 bathrooms. 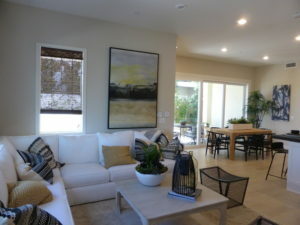 Each home has a private, 2-car garage accessed from a shared motor court. 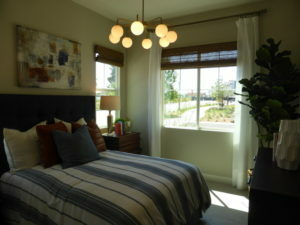 Encore is built by Lennar, which is known for its “Everything’s Included” policy. 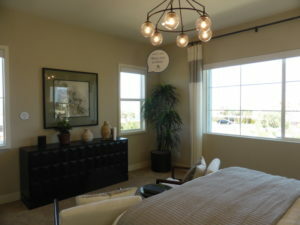 What you see in the models is primarily what you get and there aren’t many options to upgrade or customize the home. 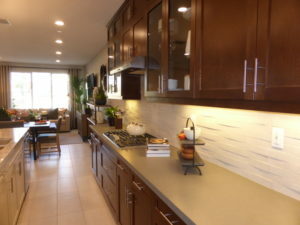 However, you can make changes to things like flooring, backsplashes, and paint. 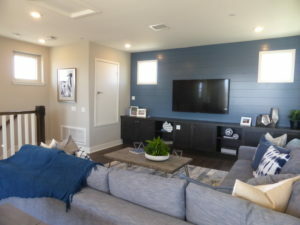 The homes come standard with smart products controlled by Amazon Alexa, including Echo Dot and Echo Show; Baldwin® Evolved smart lock; Honeywell Lyric round™ wi-fi thermostat; Leviton® Z-wave plug-in module; Lutron Caseta® wireless in-wall dimmer, Smart Bridge Pro, lamp module, and Pico remote with double stand; Ring® video doorbell pro; Samsung SmartThings® hub; and Sonos® PLAY:1 wireless speaker. 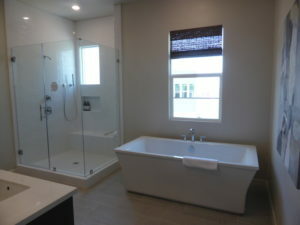 Efficiency features include energy-saving LED lights; radiant barrier roof sheathing; Sherwin-Williams® two-tone low-VOC interior paint; sealed heating and cooling ducts; dual-glazed windows with high performance low-E glass; full exterior door weather stripping; tankless water heater; smoke and carbon monoxide detectors; and pressure balanced valves in showers and tubs. 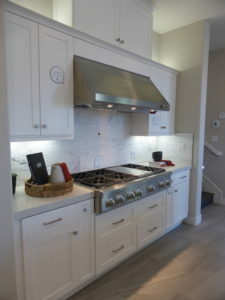 The kitchens have a GE stainless steel appliance package with Monogram® Professional Series 6-burner gas range cooktop, hood, refrigerator, and freezer; and Profile® single wall convection oven, microwave oven, and built-in dishwasher. 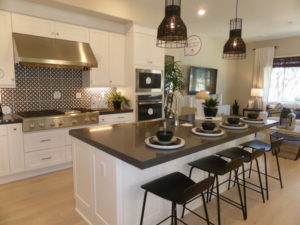 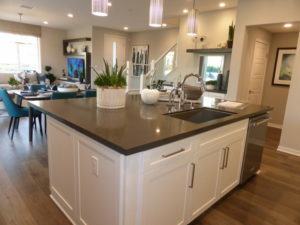 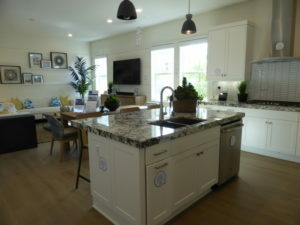 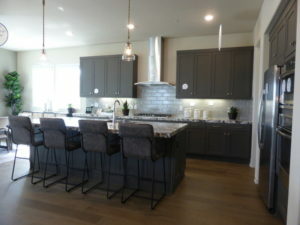 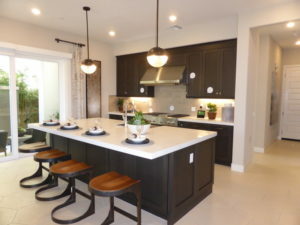 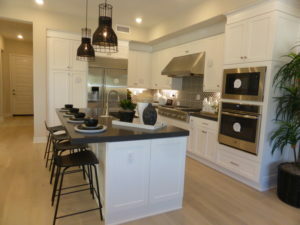 They have a large farm-style sink with designer Moen® faucet; quartz countertops with 6” backsplash and full-height splash at cooktop; Shaker-style cabinetry with soft-close hinges; under and over cabinet task lighting; built-in tray rack; and roll-out shelf for trash and recycling. 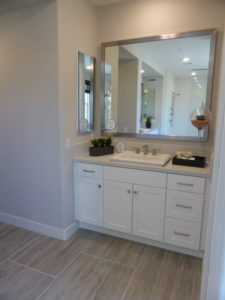 The bathrooms include Piedrafina™ countertops with 6” backsplash; Moen® bath accessories in brushed nickel; frameless shower enclosure with ceramic tile surround; Fiber Care® soaking tub with tile surround and Piedrafina deck; and Shaker-style cabinetry with soft-close hinges in pre-selected colors. 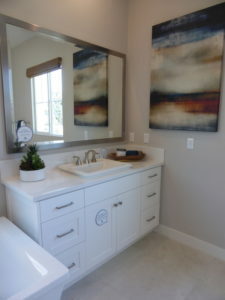 The master baths have top-mount double sinks. 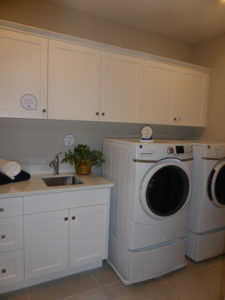 The laundry rooms have Piedrafina™ countertops with 4” backsplash; sink with Moen® pull-out faucet; and a vacancy switch. 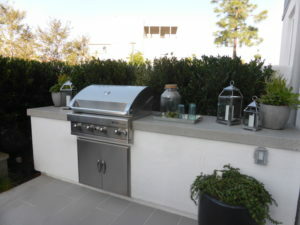 Additional features in the Encore homes include barbecue stub; Seagull® decorator-selected coach lights; Win-Dor stackable sliders with specialty casing for indoor/outdoor living; ThermaTru® insulated fiberglass 8’ entry door; Kwikset® satin nickel door levers; 5.5” baseboards; Daltile® glazed floor tile at entry, kitchen, baths, and laundry; plush wall-to-wall Mohawk® carpeting; USB outlets in kitchen and bedrooms; flat-screen TV blocking with smurf tubing to hide cables; rocker light switches; telephone jack in kitchen and master bedroom; and cable outlets in all bedrooms, living room, and den/bonus room. 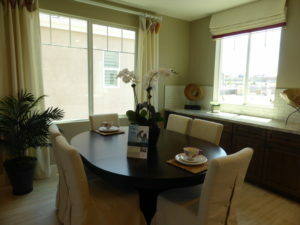 Encore is part of the Irvine Unified School District. 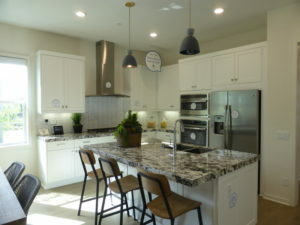 The new Cadence Park School serving grades K – 8 school is scheduled to open in August 2018 with grades K – 6. 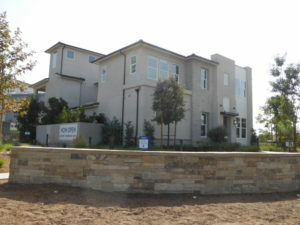 It will add 7th grade in 2019 and 8th grade in 2020. 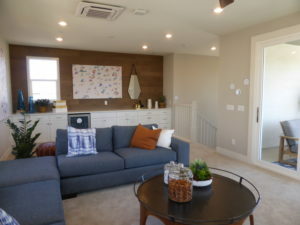 Until those grades are added, middle school students will attend Beacon Park School, which will serve grades K – 8 in 2018-19. 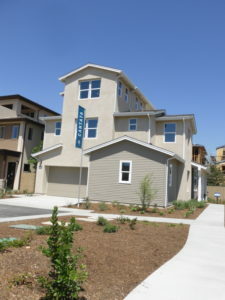 The neighborhood is served by Portola High School, which will have grades 9 – 11 in 2018-19 and will add 12th grade the following year. 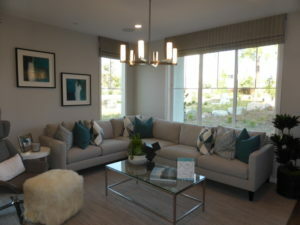 Seniors moving in this year will attend Northwood High School. 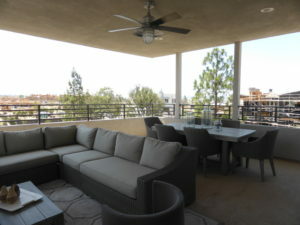 Residence 1 is tall and narrow, with a front patio facing the common walkway and front-facing decks on the second and third floors. 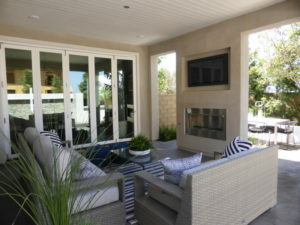 The front patio is a good size and is shown with a built-in fireplace. 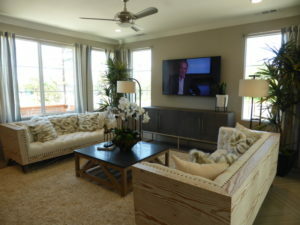 Upgrades found throughout the model include wall treatments, flooring, lighting fixtures, window coverings, landscaping, ceiling treatments, crown moulding, and built-in units. 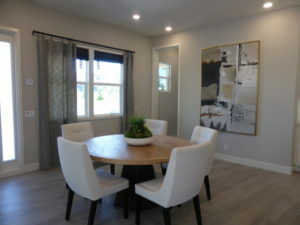 The front door opens directly into the dining room, so there isn’t a place to put an entry table or bench. 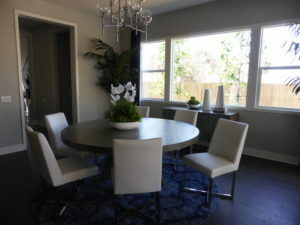 The dining room measures 11’ x 16’ and can comfortably seat 6 – 8 people. 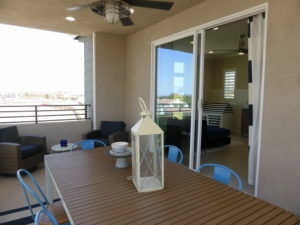 It has sliding doors on the left leading to a covered patio. 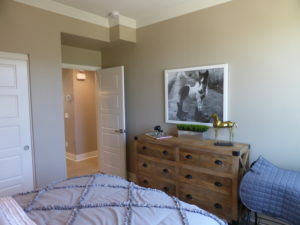 There is a short wall at the far end that could hold a small hutch, but it doesn’t really have much space for one. 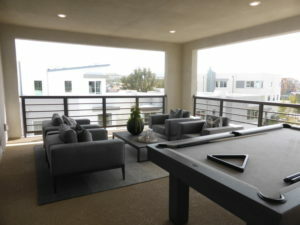 The great room is on the right. 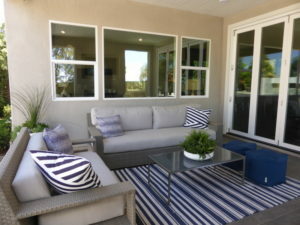 It measures 15’ x 13’ and has two windows facing the front of the house and one facing the front door. 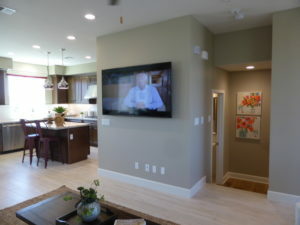 One wall shows an upgraded built-in unit with the wall-mounted TV above it. 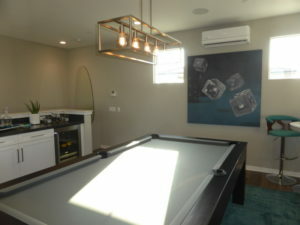 The room includes recessed lighting. 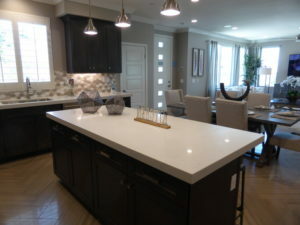 The kitchen is behind the great room and next to the dining room. 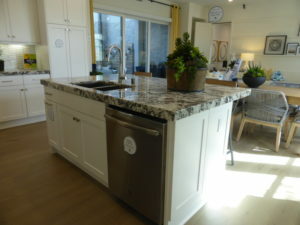 The island has seating for four on one side and the sink and dishwasher on the other. 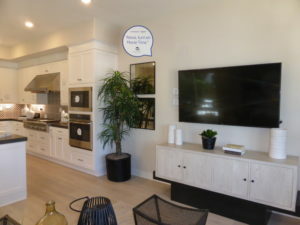 The rest of the kitchen is an L-shape, with one wall holding the built-in microwave, oven, and cooktop and the other holding the refrigerator. 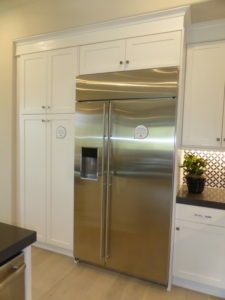 There are two pantry-height cupboards next to the fridge. 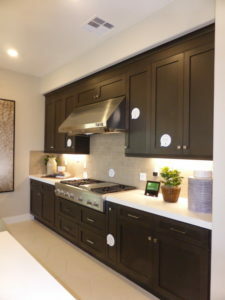 The kitchen makes good use of the space, with numerous cabinets and drawers and counter space on each side of the cooktop. 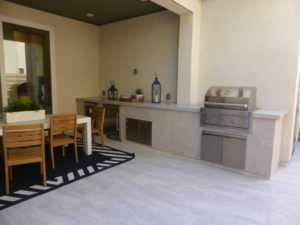 The covered patio has space for a table and chairs or other outdoor seating. 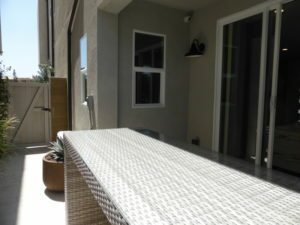 There isn’t much of a yard beyond it. 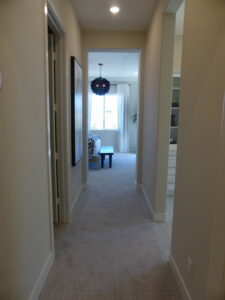 A hallway behind the dining room leads to the powder room, garage, and first-floor bedroom. 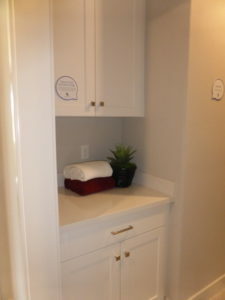 There is a set of base linen cabinets just outside the powder room. 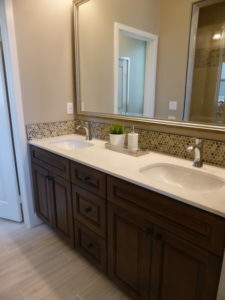 The bathroom has a vanity with one set of cabinets. 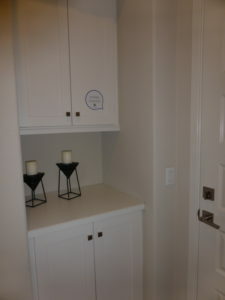 There are additional upper and lower cabinets next to the garage door and a large closet under the stairs. 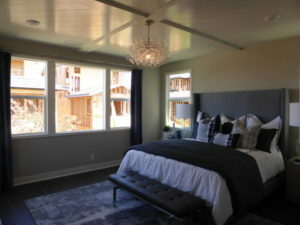 The first-floor bedroom is the biggest secondary room at 11’ x 12’ and has just one small window facing the side of the house. 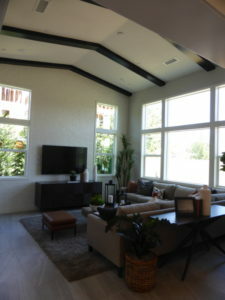 The floorplan shows an additional window facing the covered patio, so it’s possible that other elevations have this extra window. 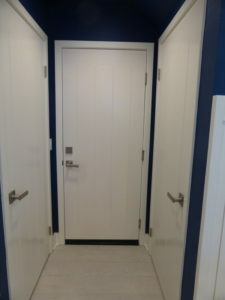 There is a bypass closet with narrow doors along one wall. 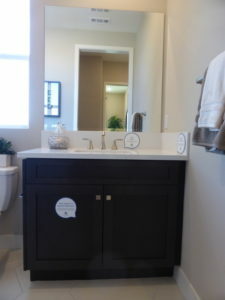 The en-suite bathroom has a large vanity with one sink, two cabinets, and six drawers. 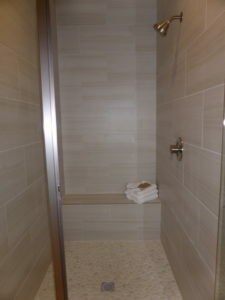 The shower is a good size and includes a shampoo niche and full seat at the back. 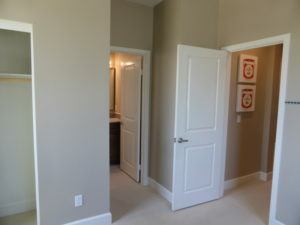 On the second floor, the bathroom and secondary bedrooms are down the hall towards the back of the house. 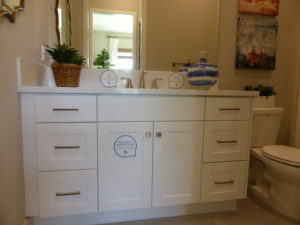 The bathroom has two sinks set into a shared vanity with two sets of cabinets and three drawers. 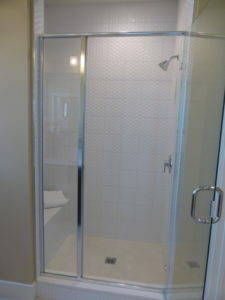 There is a shower/tub combo through a separate door. 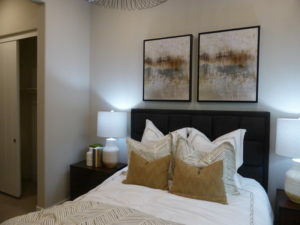 Bedroom 3 is on the right. 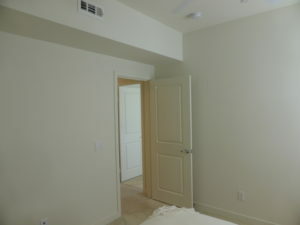 It is only 10’ x 12’ so it is the smallest of the secondary bedrooms. 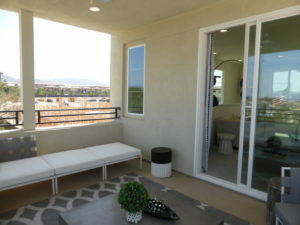 There is one window facing the back and a smaller one on the side. 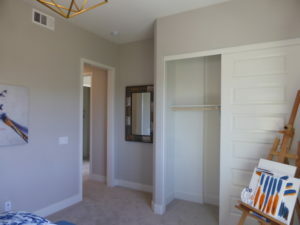 The bypass closet looks small from the outside but stretches past the doors along the full length of the wall. 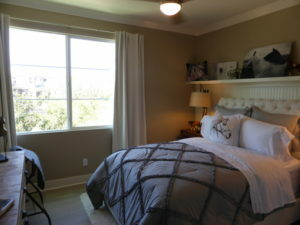 Bedroom 2 is 10’ x 13’ with a window facing the back of the house and a smaller one on the left side. 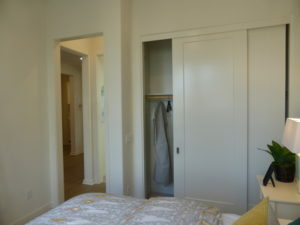 The closet is quite small and, unlike the one in bedroom 3, it doesn’t stretch at all beyond the width of the doors. 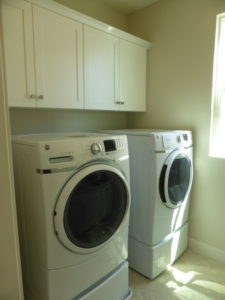 The laundry room is next to the secondary bathroom. 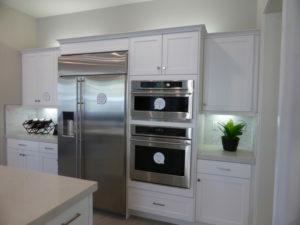 It has space for side-by-side machines with cabinets above them. 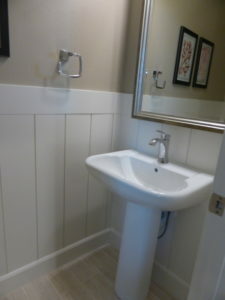 The opposite wall has a sink with a long counter, more cabinets, and two drawers. 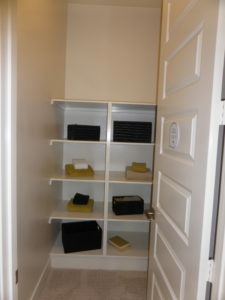 A linen closet across from the laundry room has built-in shelving but could make better use of the space. 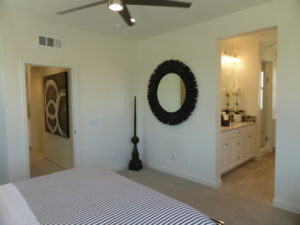 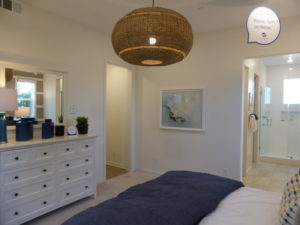 The master suite has a long entry hall, with the walk-in closet on one side and bathroom on the other. 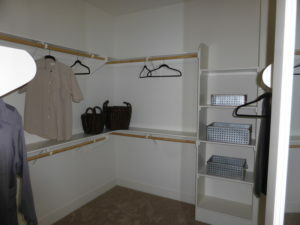 The closet is shown with the standard shelves and poles. 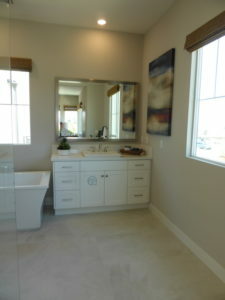 The bathroom has linen cabinets just left of the doorway, shown in the model with an upgraded highboy unit. 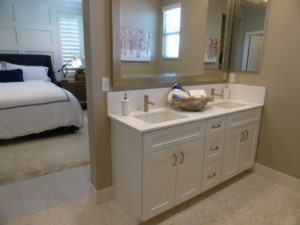 The vanity has two sinks, two cabinets, and three drawers. 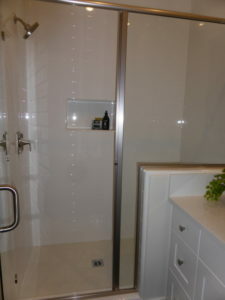 The shower is an average size, with a shampoo niche and full seat across the end. 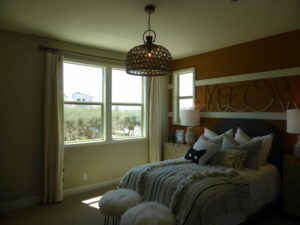 The master bedroom is 15’ x 15’ with a big window facing the front and two smaller ones high up on the side wall. 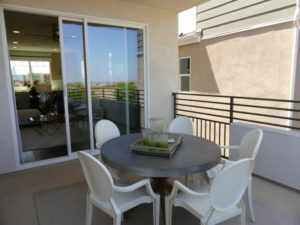 The third wall has a single French door leading to a deck that faces the street. 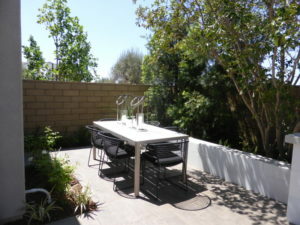 The deck has space for a couple of chairs and small table. 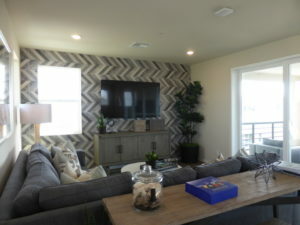 There is a third floor with a bonus room. 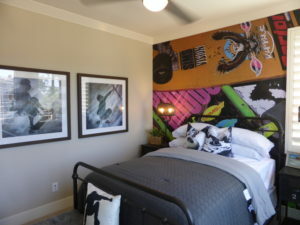 The room is 21’ x 20’ and has windows on three walls. 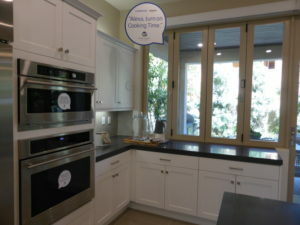 The kitchenette across from the staircase is an upgrade from the standard linen cabinets; it is shown with a mini-fridge and glass upper cabinets. 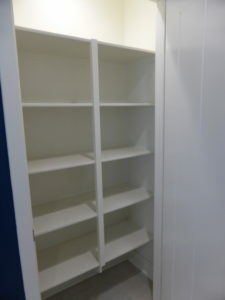 The model also shows an upgraded built-in unit along one wall, with cabinets in the middle and work stations on the ends. 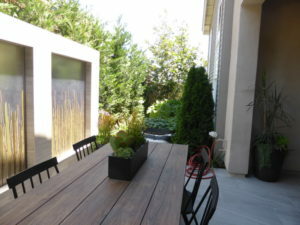 The room has sliding doors leading to a 14’ x 15’ deck that overlooks the street. 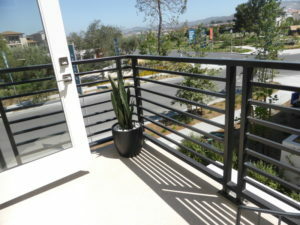 It also looks directly into the deck of the house next door. 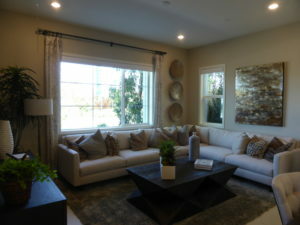 Residence 1 is just like all the other Lennar homes I have seen recently. 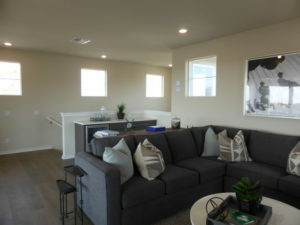 The living area on the first floor is pretty small and the overall layout is the same as most models. 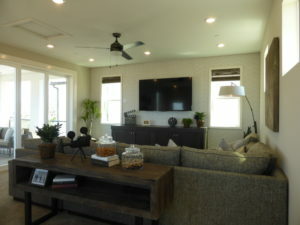 The bonus room is a great addition to the home but being on the third floor makes it a little less convenient. 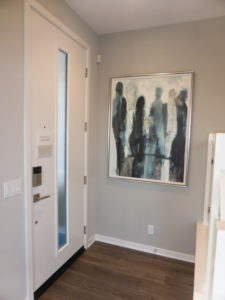 Residence 2 is another tall, narrow home with a similar layout to residence 1. 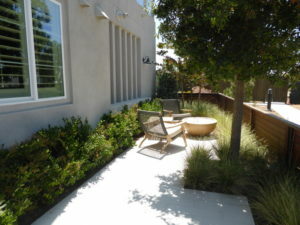 This home has a front patio, though smaller than in residence 1. 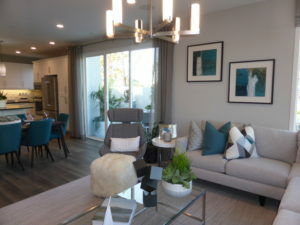 As in the first model, upgrades found throughout the home include wall treatments, flooring, lighting fixtures, window coverings, landscaping, ceiling treatments, crown moulding, and built-in units. 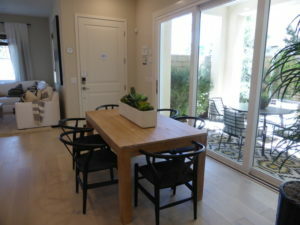 This house has a small entryway with space for a little table next to the front door. 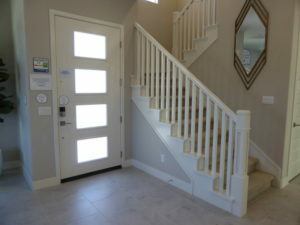 The stairs are just inside the door as well. 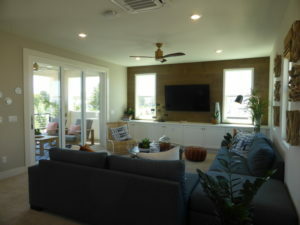 The great room is the first room on the left. 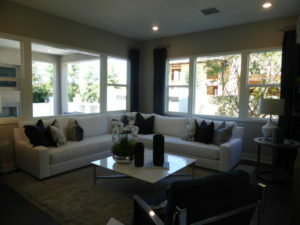 It is 16’ x 10’ with windows facing the front and side of the house. 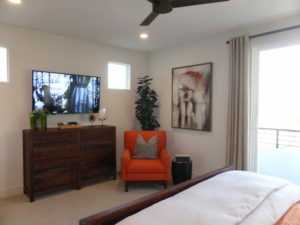 The room feels cramped and doesn’t leave a lot of options for arranging the furniture. 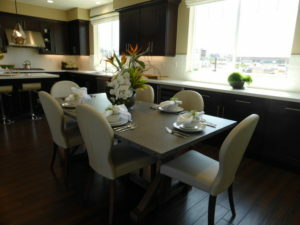 The dining room is 18’ x 10’ and is sandwiched between the great room and the kitchen. 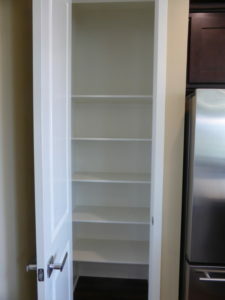 It doesn’t have any walls so there isn’t anywhere to put a china hutch. 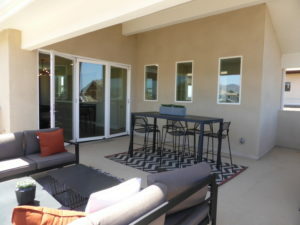 There are sliding door leading to a covered patio on one side of the room. 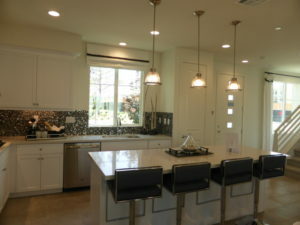 The kitchen is 21’ x 10’ and directly behind the dining room. 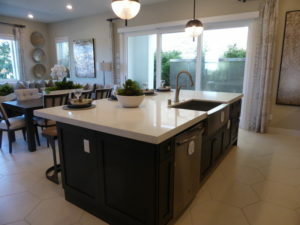 The island seats four on one side and holds the sink and dishwasher on the other. 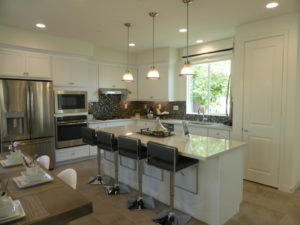 The cooktop is behind the island, set into a long counter with several cabinets and drawers. 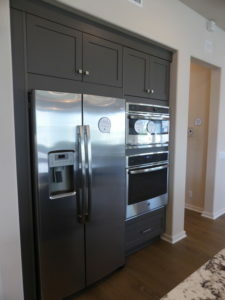 The built-in oven, microwave, and refrigerator are along another wall. 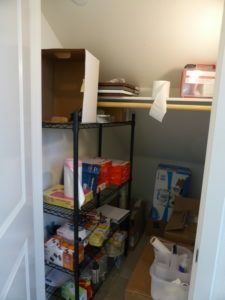 There is a walk-in pantry just behind the kitchen; however, the shelving is poorly arranged and wastes a lot of space. 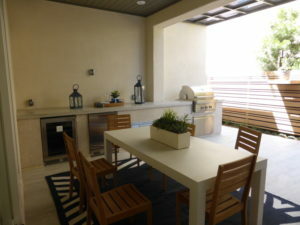 The covered patio off the dining room is quite narrow and doesn’t really have much yard beyond it. 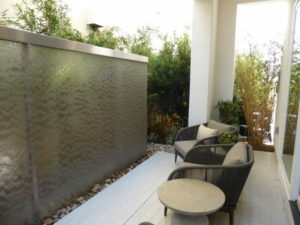 The model shows a large fountain occupying any extra space there might have been. 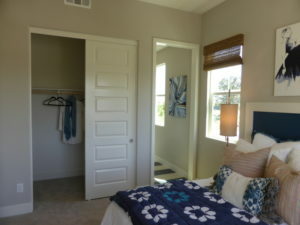 The doorway off the back of the kitchen leads to the garage, secondary bathroom, and bedroom 4. 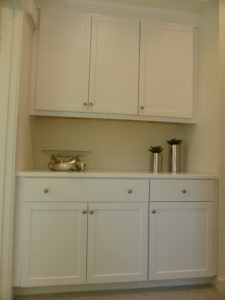 There are four upper and four lower cabinets by the garage, creating a great drop zone. 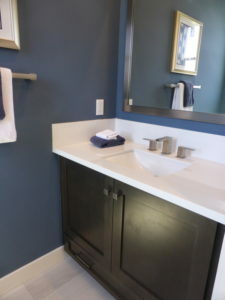 The secondary bathroom includes a vanity with a single sink and two cabinets. 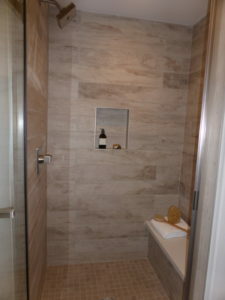 There is a shower/tub combo with a shampoo niche. 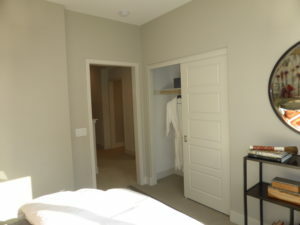 Bedroom 4 is across the hall from the bathroom. 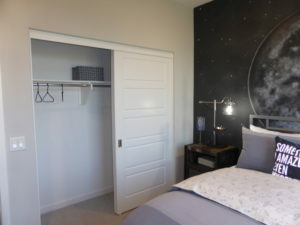 It is 11’ x 11’ and is the smallest bedroom in the house. 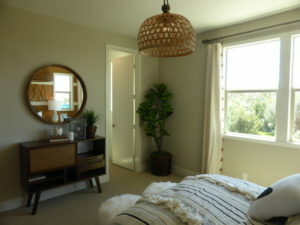 There is one window on the side and a bypass closet. 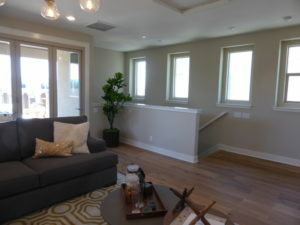 The second floor has a long hallway with several windows facing the side of the house. 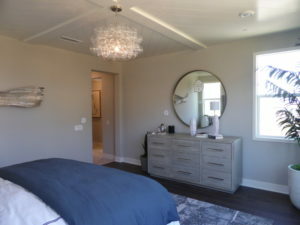 The secondary bedrooms and bathroom are towards the back of the house and the master suite is at the front of the house. 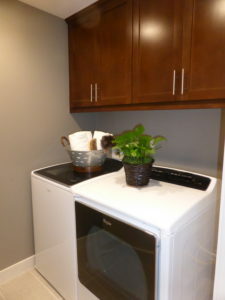 The laundry room is across from the stairs. 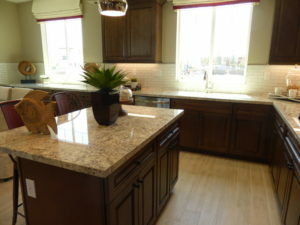 It has side-by-side machines and a sink with a short counter and two lower cabinets. 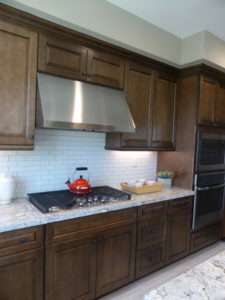 There are also six upper cabinets. 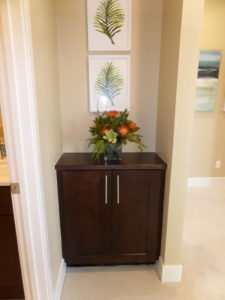 There are also several base linen cabinets in the hallway outside the master suite, nestled between the two staircases. 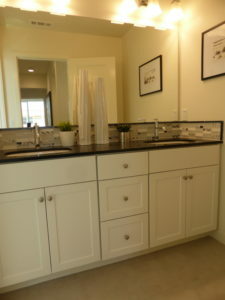 The secondary bathroom has two sinks in a shared vanity with two sets of cabinets and six drawers. 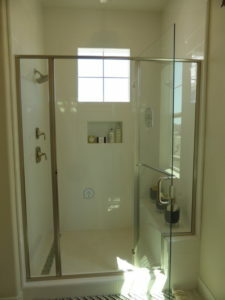 The shower/tub combo is through a separate door. 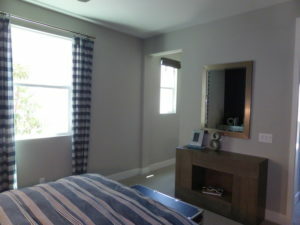 Bedroom 2 is 10’ x 13’ with windows facing the back and side of the house. 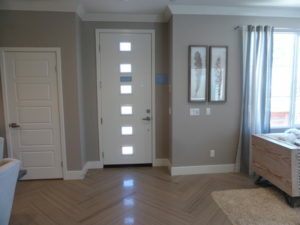 The bypass closet is small and doesn’t extend past the doors at all. 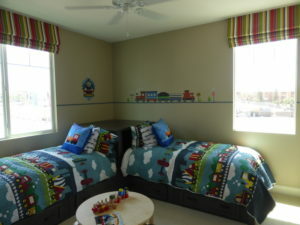 Bedroom 3 is next to bedroom 2. 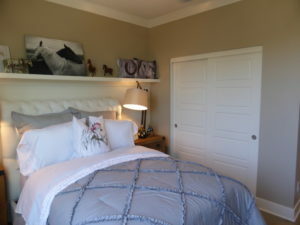 At 11’ x 13’ it is the largest secondary bedroom. 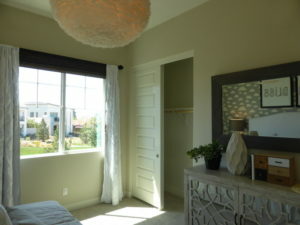 It has windows on three walls and a slightly larger bypass closet than in bedroom 2. 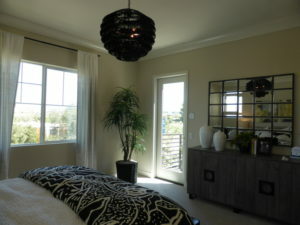 The master suite is at the front of the house. 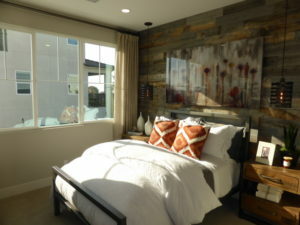 The bedroom is 16’ x 14’ and has windows on three walls. 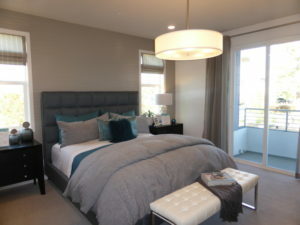 Unlike residence 1, the master bedroom in this home doesn’t have a balcony. 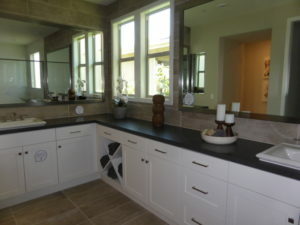 The master bathroom has one vanity with two sinks, two sets of cabinets, and six drawers. 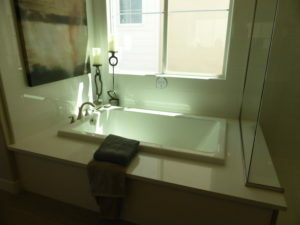 The bathtub and shower sit side-by-side across from the vanity. 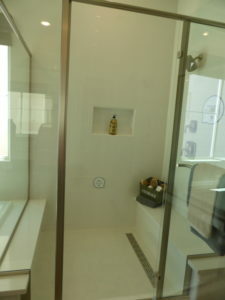 The tub deck forms a wide ledge in the shower, which also has a full seat on the other side. 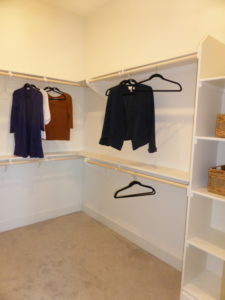 The walk-in closet has shelves and poles on three walls and a built-in shoe rack. 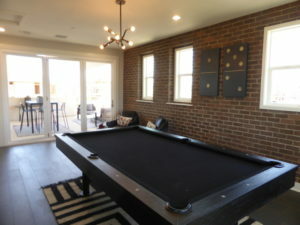 The third floor of the home is a 21’ x 17’ bonus room. 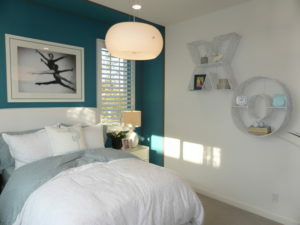 It has windows on every wall, so it will get light throughout the day. 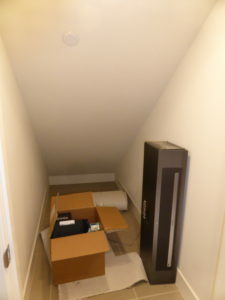 There is an attic space accessed from the middle of the ceiling. 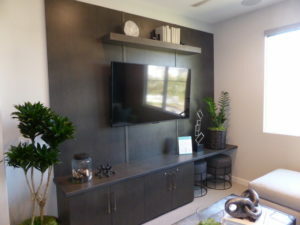 The model shows an upgraded built-in unit under the TV. 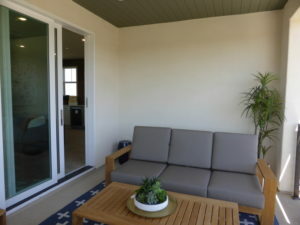 One wall has sliding doors leading to a 17’ x 16’ deck, which looks directly onto the deck next door. 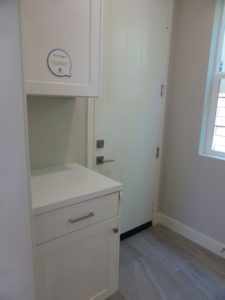 This home has a lot of cabinet storage but lacks a hall closet on the first floor (though the pantry could serve as a closet). 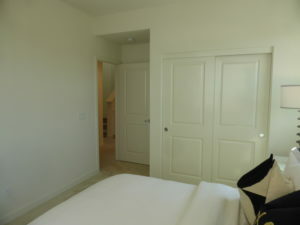 The bedrooms are an average size, but their closets are quite small. 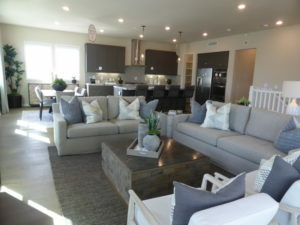 Overall, I don’t think this home is laid out as well as residence 1. 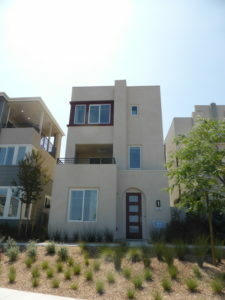 Residence 3 has its entrance on the side of the home, so it will likely always be a corner unit. 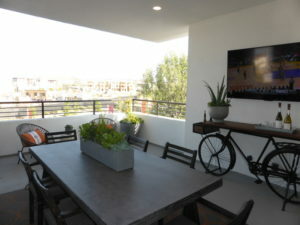 The garage is still off the shared motor court at the back. 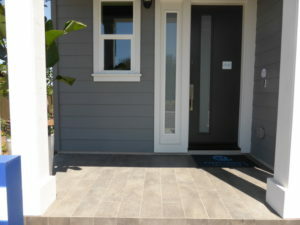 Unlike the other Encore homes, this house doesn’t have a front porch. 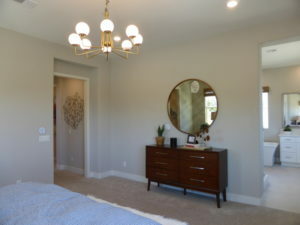 Upgrades found throughout the home include wall treatments, flooring, lighting fixtures, window coverings, landscaping, ceiling treatments, crown moulding, and built-in units. 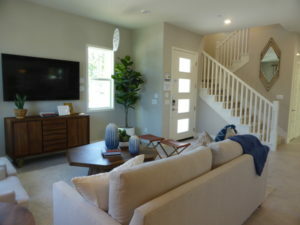 Inside, the home has a small entryway, with the great room on the right and the staircase on the left. 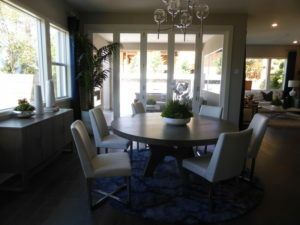 There isn’t a place to put an entry table. 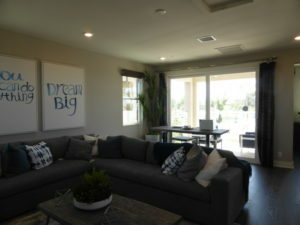 The great room is 14’ x 20’ and has windows on two walls, facing the front and street-side of the home. 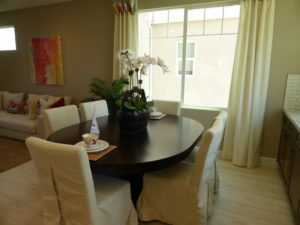 It is far more spacious than the great room in residence 2 and is still fully open to the kitchen and dining area. 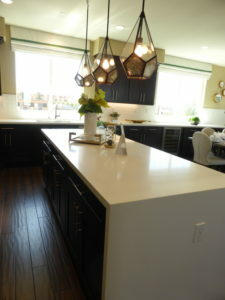 The kitchen is 26’ x 12’ with a large island. 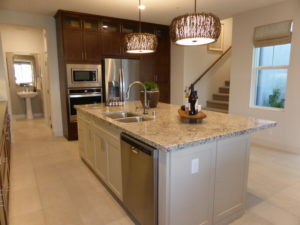 The island has seating on one side and the sink and dishwasher on the other. 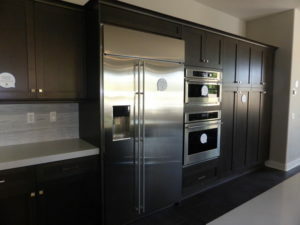 All the appliances sit on one long wall, with the fridge, microwave, and oven toward the left and the cooktop in the middle. 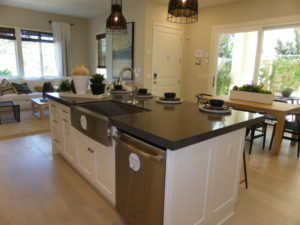 There is counter space on both sides of the cooktop. 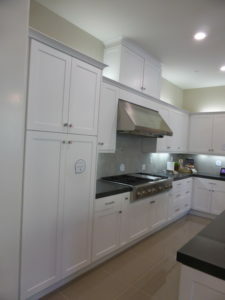 The other wall has additional counter space and pantry-height cupboards at the end. 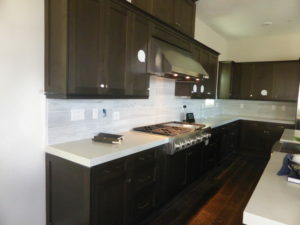 Overall, the kitchen has plenty of cabinets and drawers. 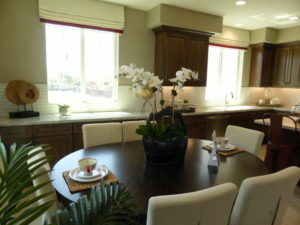 The dining nook is on the left side of the kitchen. 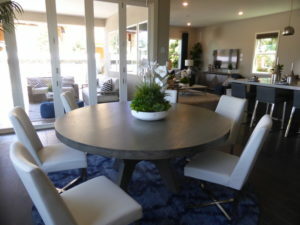 It can comfortably seat about eight people. 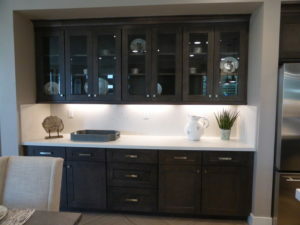 There are additional base cabinets that extend to the end of the room. 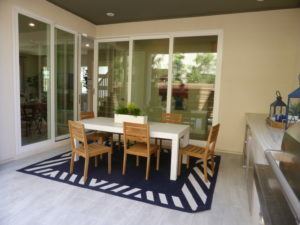 Sliding doors on the left lead to the covered patio. 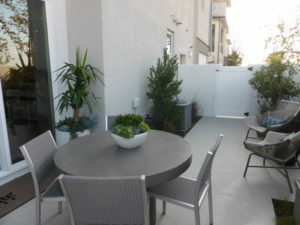 The patio is more spacious than in the other homes, measuring 10’ x 16’. 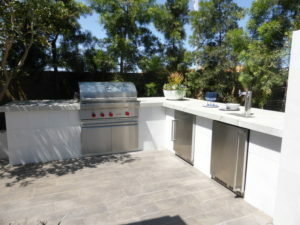 It has an upgraded built-in barbecue and mini fridge set into a long counter. 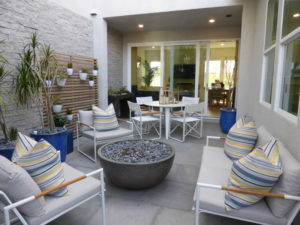 There isn’t much yard beyond the patio. 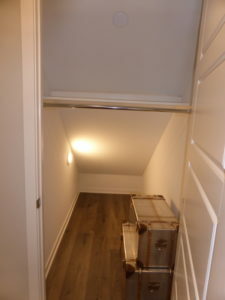 There is a large closet under the stairs. 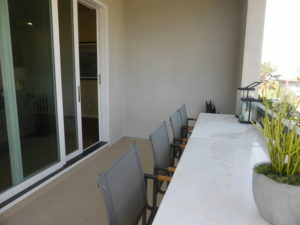 The hallway has additional sliding doors to the patio. 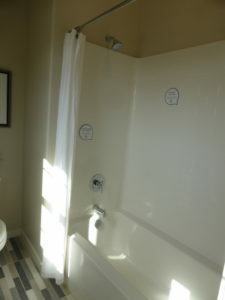 Bathroom 4 is on the left side of the hall. 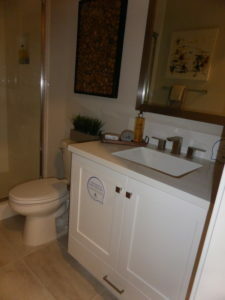 It has a good-sized vanity with one sink, two cabinets, and six drawers. 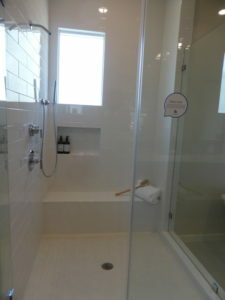 There is a shower/tub combo. 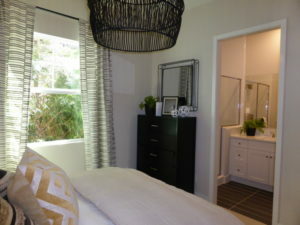 Bedroom 4 is just outside the bathroom. 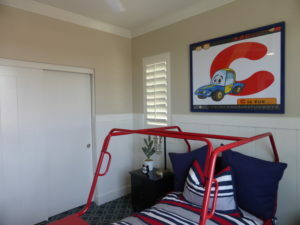 It is 10’ x 12’ and has windows facing the side of the house and the motor court. 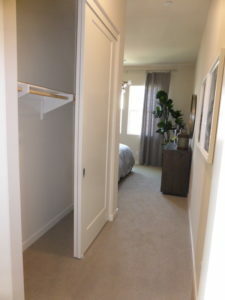 There is a bypass closet, though the floorplan lists it as a walk-in closet. 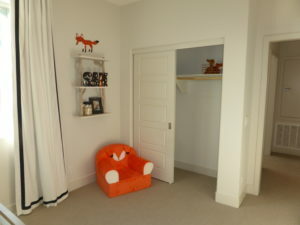 The second floor has an open den at the top of the stairs. 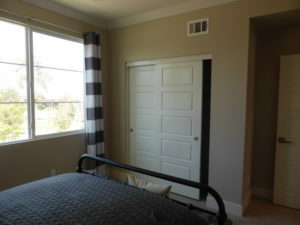 The room is 10’ x 14’ and has a window facing the side of the house. 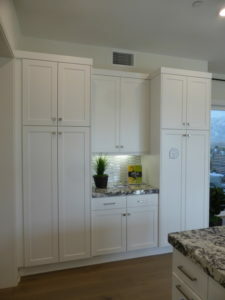 The upper and lower cabinets are included with the home. 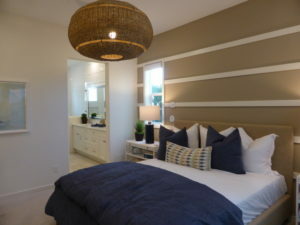 As in the other homes, the secondary bedrooms and bathroom are at the back of the house. 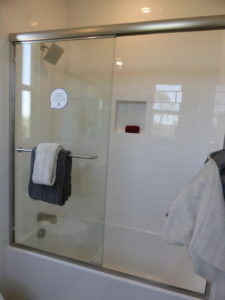 The bathroom is on the right side. 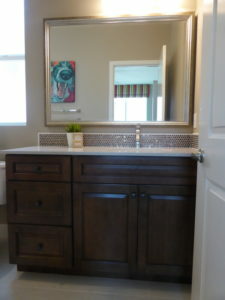 It has a large vanity with one sink, two cabinets, and six drawers. 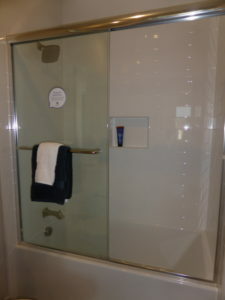 There is a shower/tub combo with a shampoo niche. 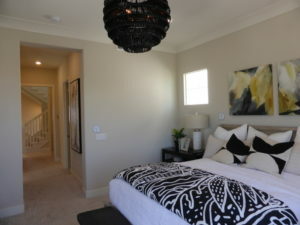 Bedroom 2 is on the left. 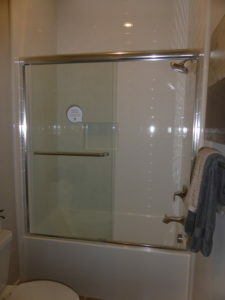 It is 10’ x 12’ with windows facing the back and side. 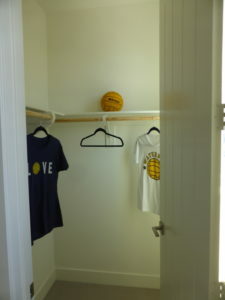 The bypass closet is slightly deeper than normal but not a true walk-in. 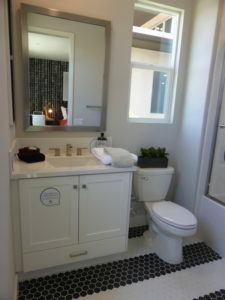 There is an en-suite bathroom with a small vanity and a shower/tub combo. 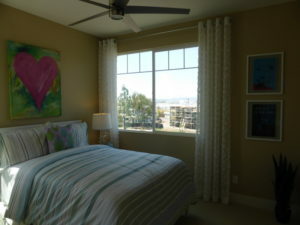 Bedroom 3 is much larger, measuring 15’ x 11’ and has windows on two walls. 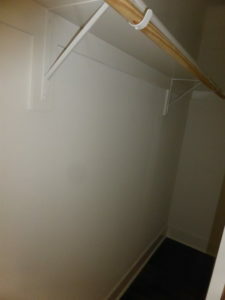 It has a standard bypass closet. 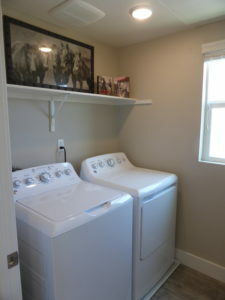 The laundry room is on the other side of the den. 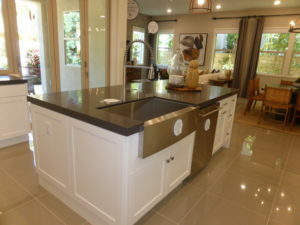 It has space for side-by-side machines and a short counter with a sink. 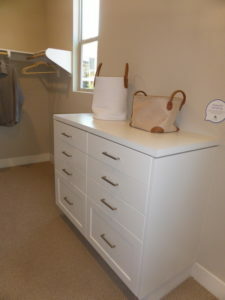 There are several linen cabinets and a few drawers. 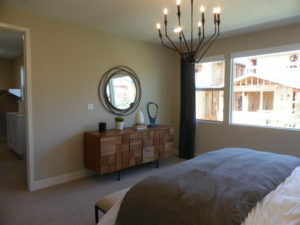 The master suite is at the front of the house. 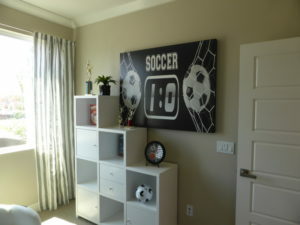 It is 16’ x 15’ and has windows on two walls. 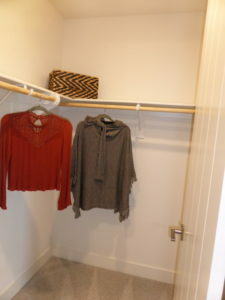 There is a small walk-in closet in a corner of the bedroom. 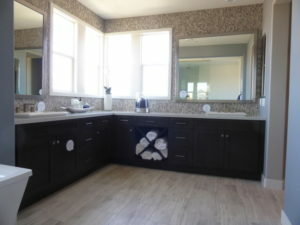 The master bathroom has two vanities, each with one sink, one set of cabinets, and six drawers. 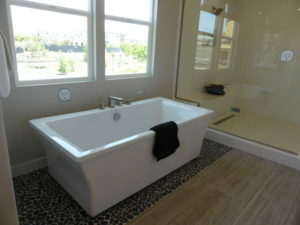 The freestanding tub sits between the vanities. 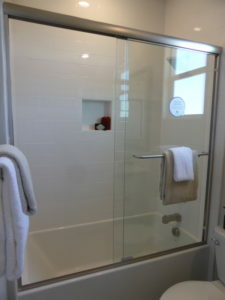 The shower is across from the bathtub. 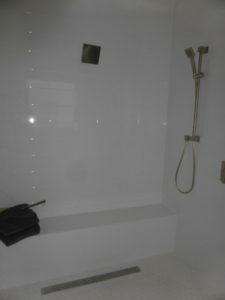 It is a good size and has a full bench, but the bench is under the showerhead instead of at the opposite end. 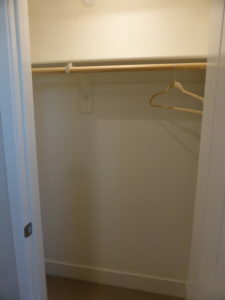 There is a second walk-in closet in the bathroom and it is larger than the first. 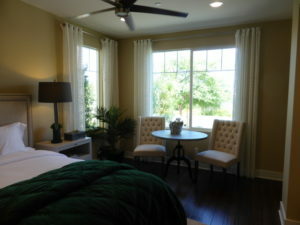 The third-floor bonus room is 15’ x 26’ with windows on all four walls. 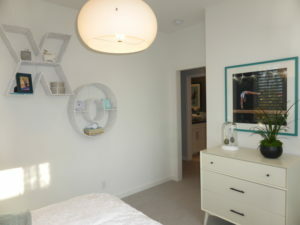 The model shows an upgraded built-in unit that stretches across one wall. 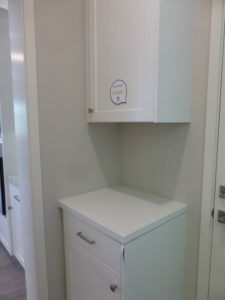 It is mostly base cabinets and drawers but also includes a mini fridge. 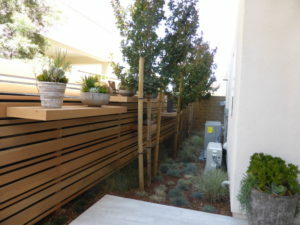 The deck is 10’ x 15’ and is on the side of the house, so it has more privacy than the first two residences. 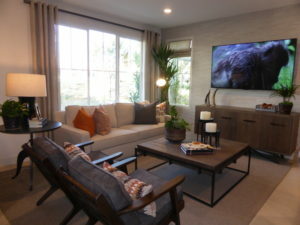 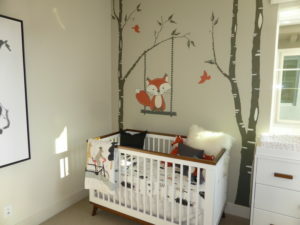 The den is a great addition to this home and provides extra flexibility. 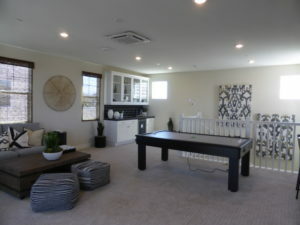 I like the layout of the first floor more in this model, as the great room is more spacious. 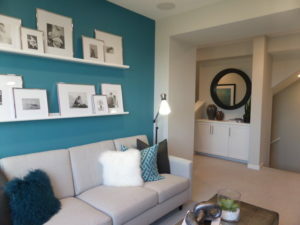 Overall, the Encore homes are all quite similar to each other. 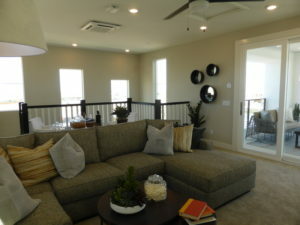 Each has four bedrooms, including one on the first floor, and a third-story bonus room. 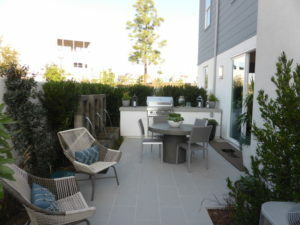 They all have outdoor patio space but no backyard, as is the trend in many new homes in the Great Park. 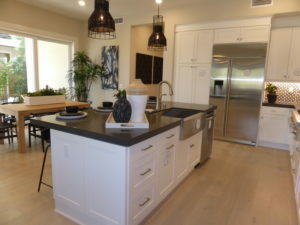 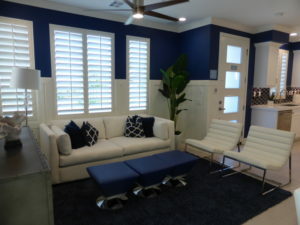 This entry was posted in New Homes on August 3, 2018 by Karen.